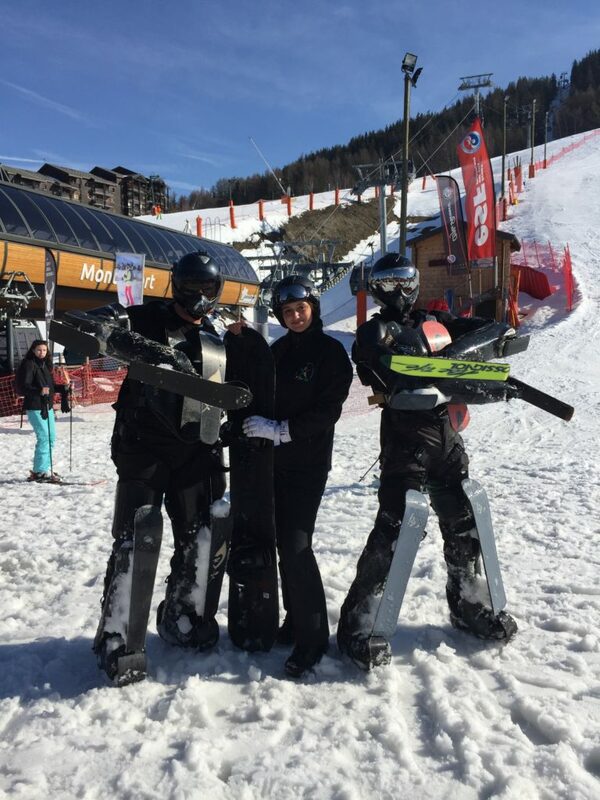 This year Montalbert La Plagne has host the festiglisse event. 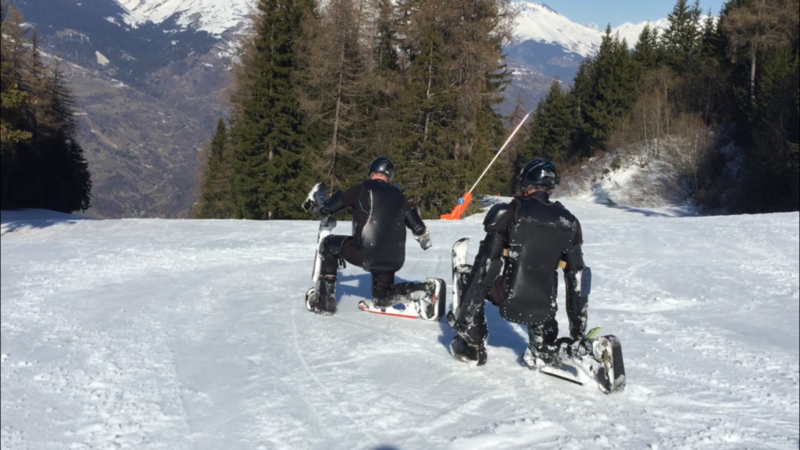 Once again the BUGGY SKI was in the spotlight. 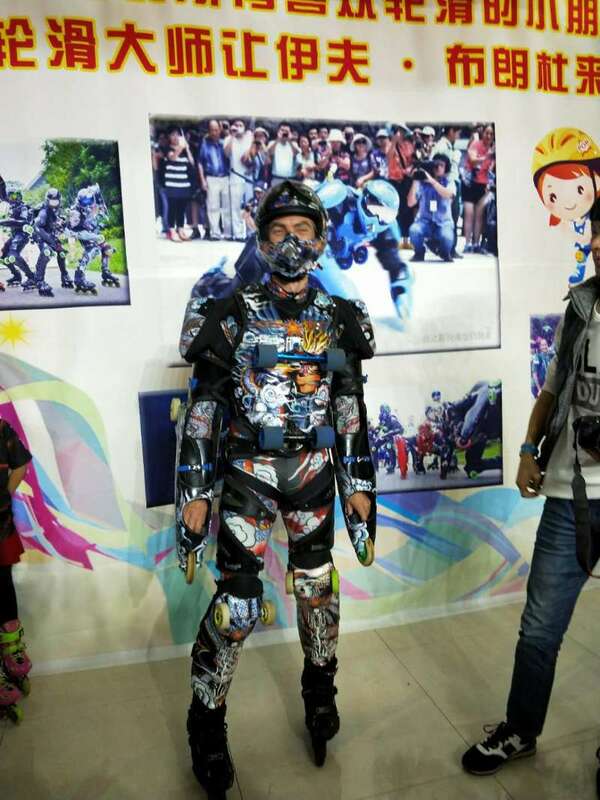 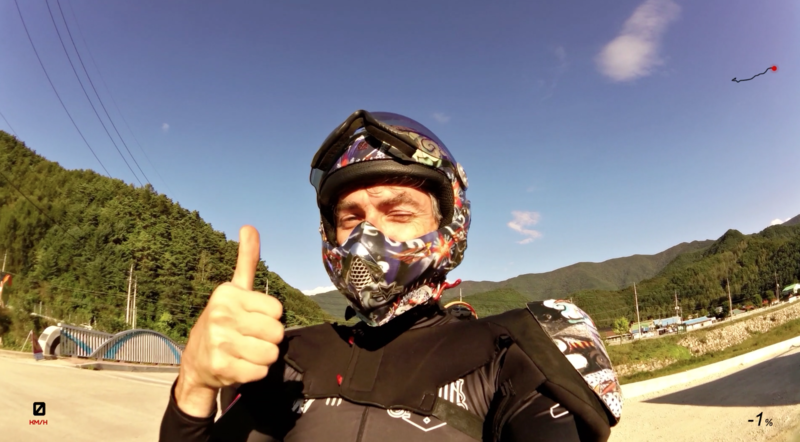 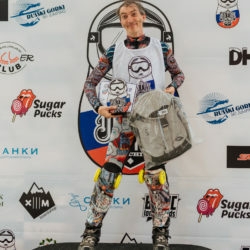 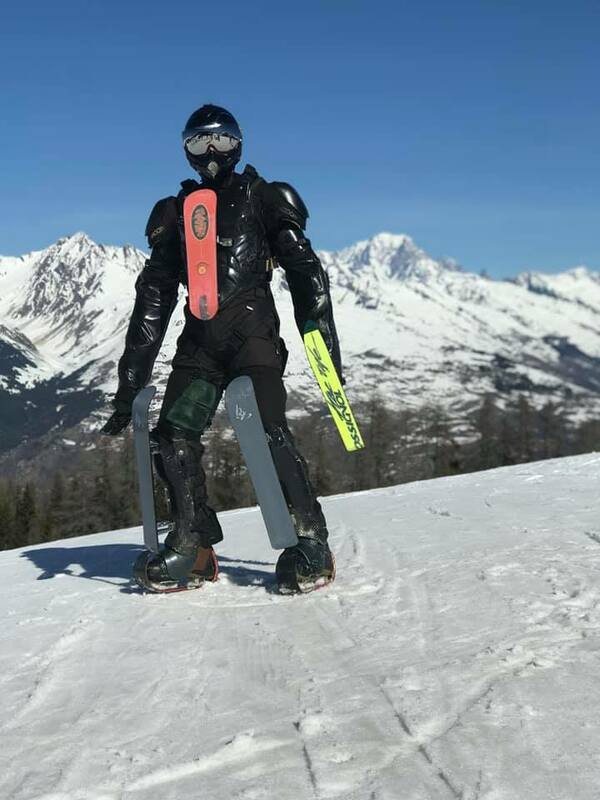 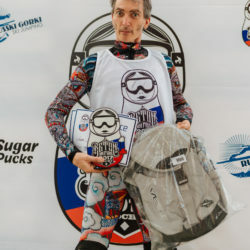 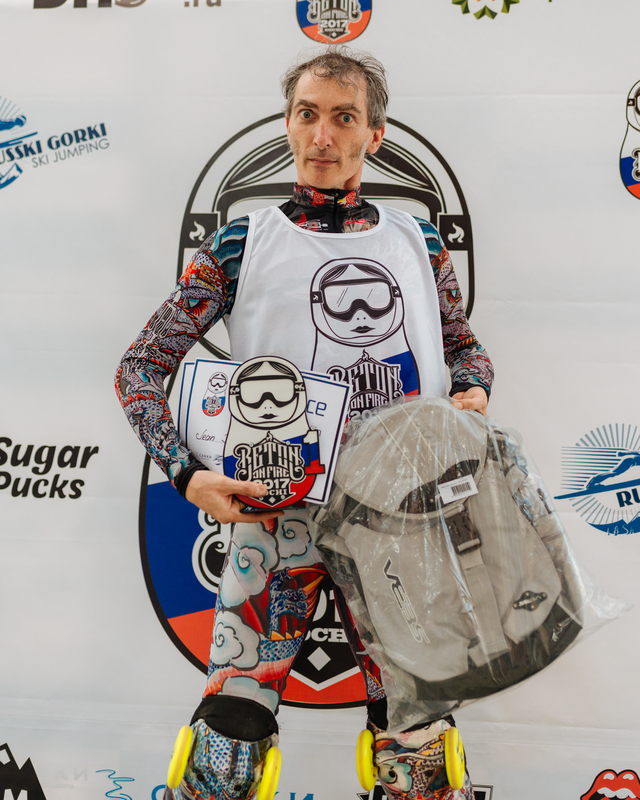 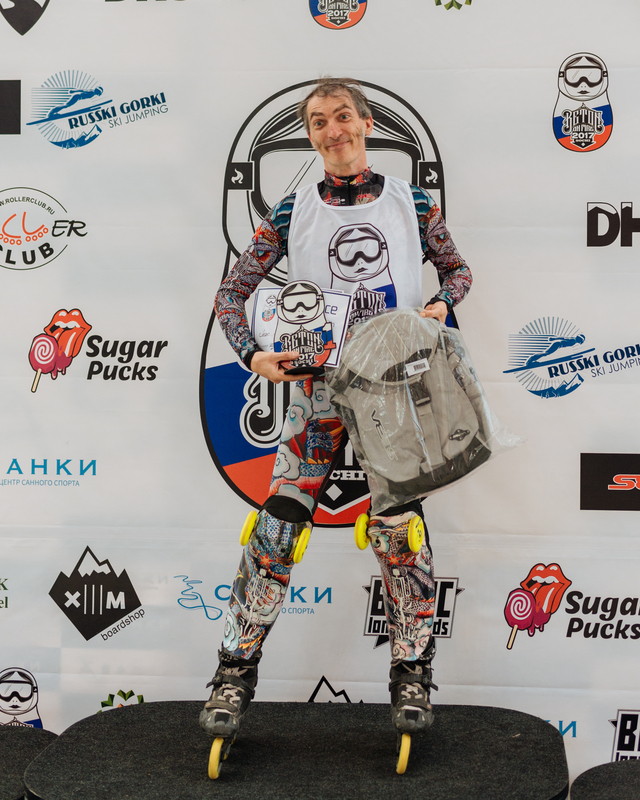 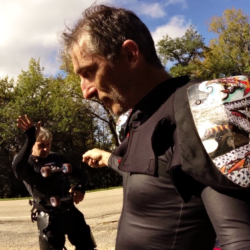 On the first day, Jean Yves Blondeau was alone to show the abilities of the ski armor. 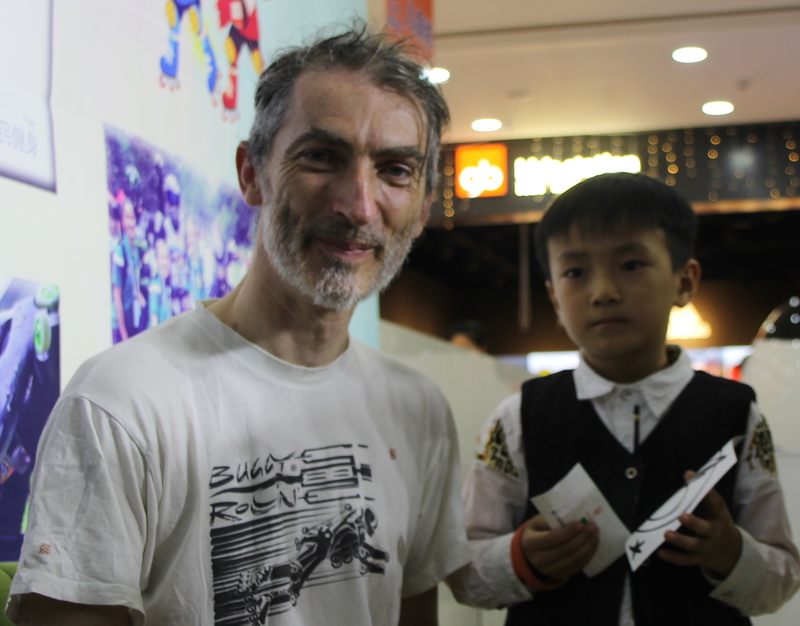 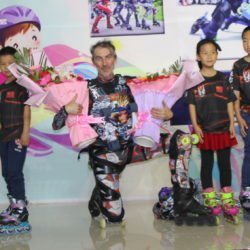 On the second day he was joined by his friend Riderman France. 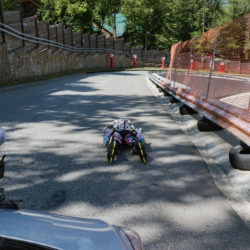 Note the presence of Carole, who is among the active drivers in BUGGY ROLLIN. 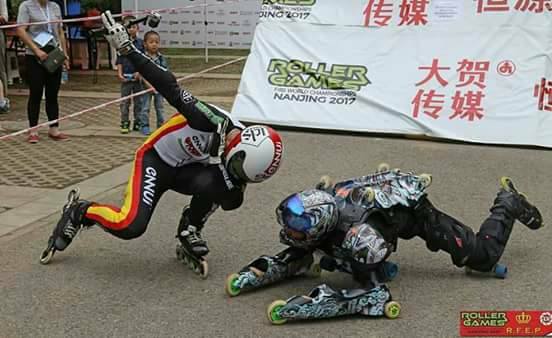 There is only one day in the year when it is possible to get such picture. 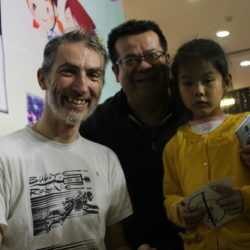 This the happiness of a good synchronicity, every thing was put together. 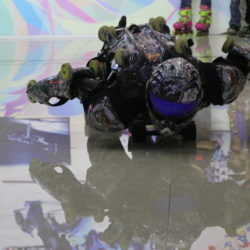 First you need a good BUGY ROLLIN pilot, with an artistic eye, and good notion of in site choreography. 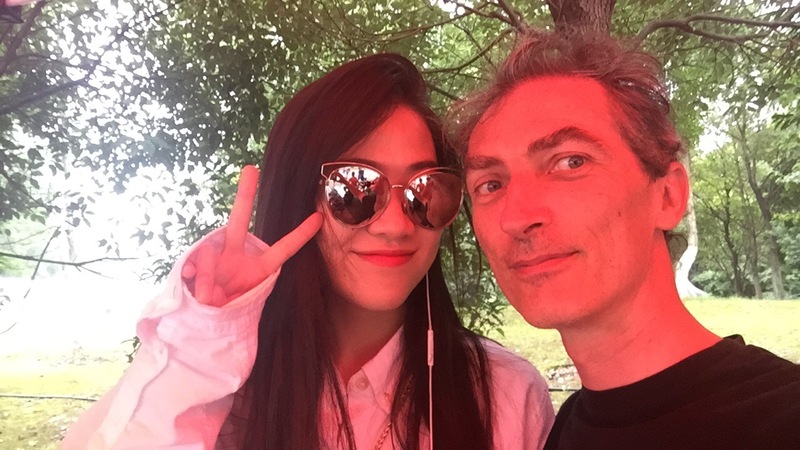 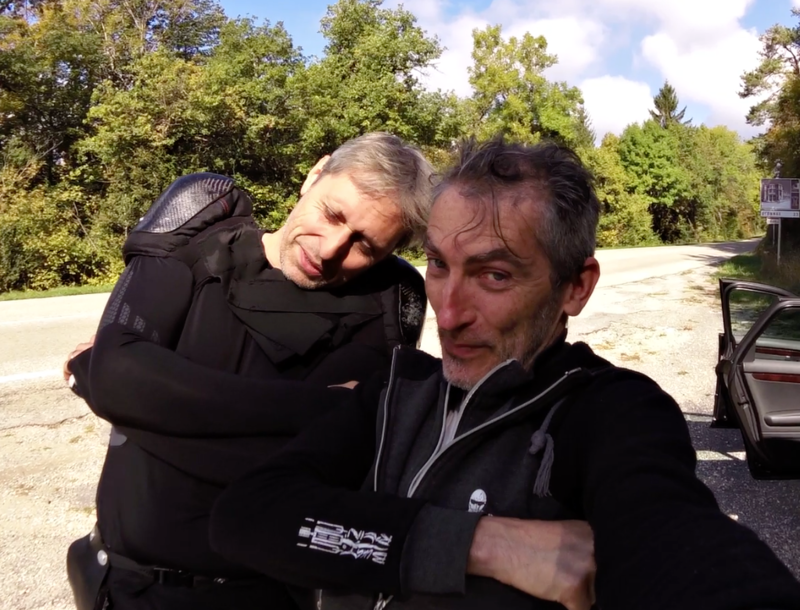 With Jean Yves Blondeau all is good. 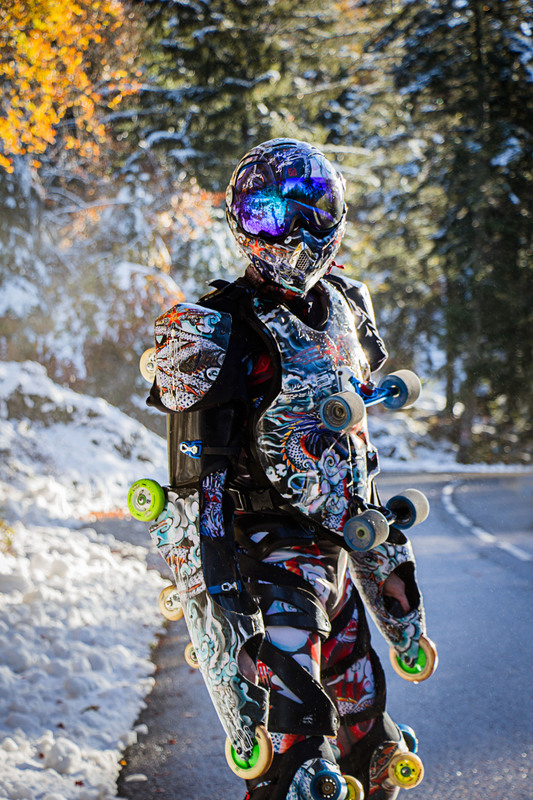 Pilot and Armor in perfect coherence. 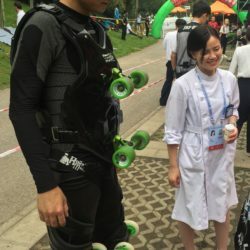 Also the pilot should have the right outfit. 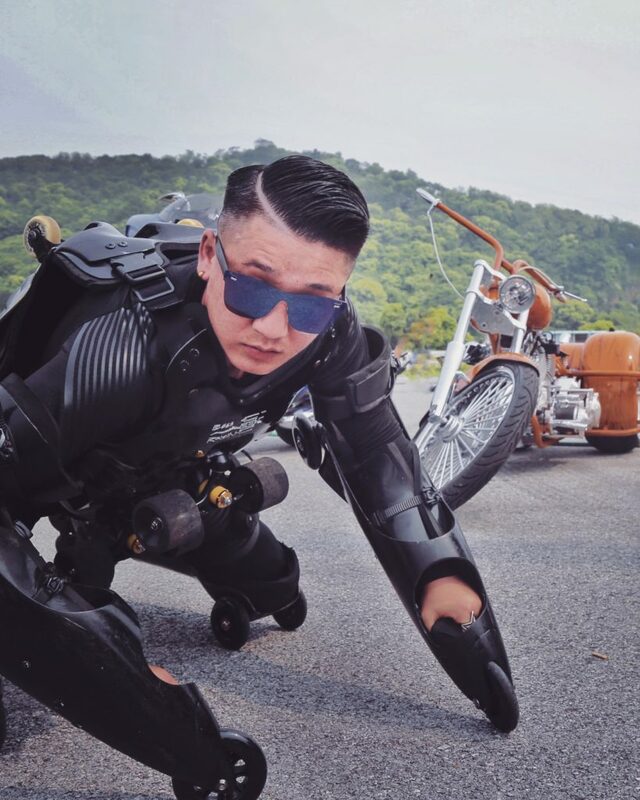 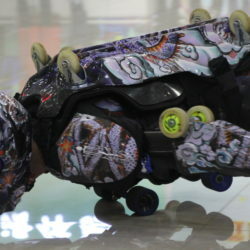 This BUGGY ROLLIN wheel suit named 9 Dragon is a work of art by itself. 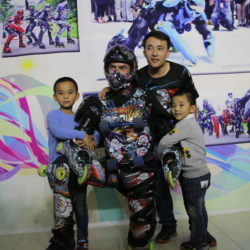 The combination of hand made drawings are running on the surfaces of the shells of the armor as well as on the stretch under armor lycra (spandex) suit. 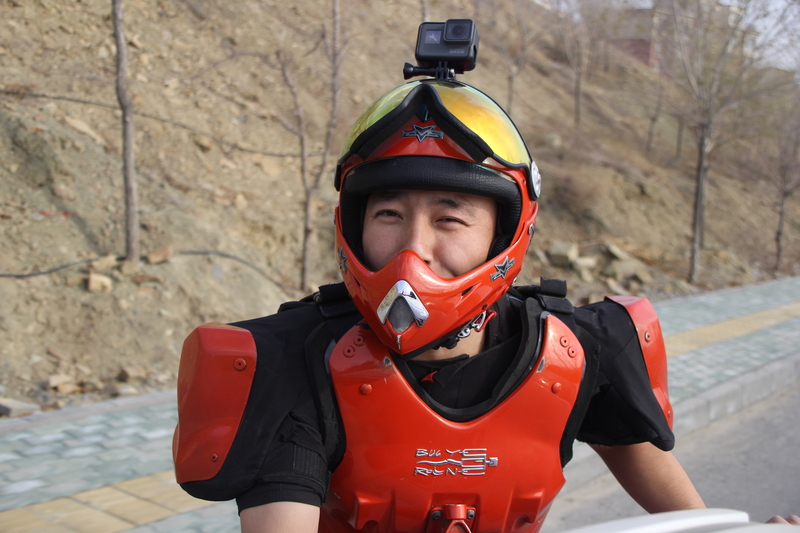 The helmet is also in coherence with the dragon concept. 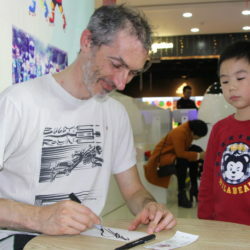 Nine is the most powerful number in Chinese tradition and also for Nicholas Tesla (with 3 and 6). 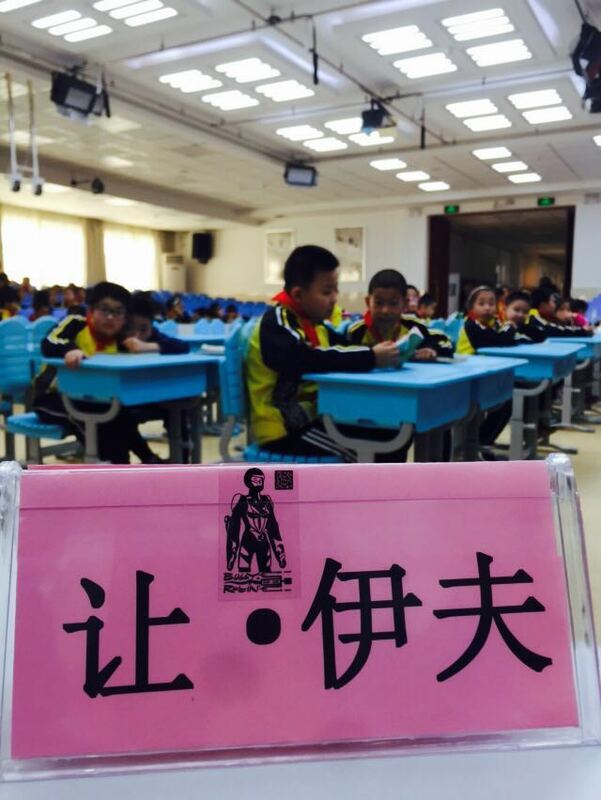 This number was reserve for the use of the emperor only. 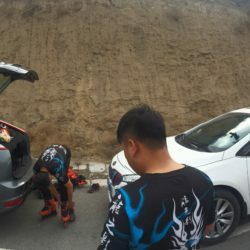 Now a days, the more number 9 appears on Chinese plate number, the more powerful is the owner. 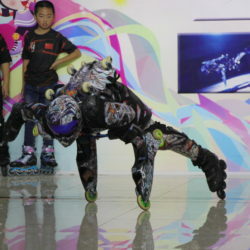 Dragon stands for the most powerful animal. 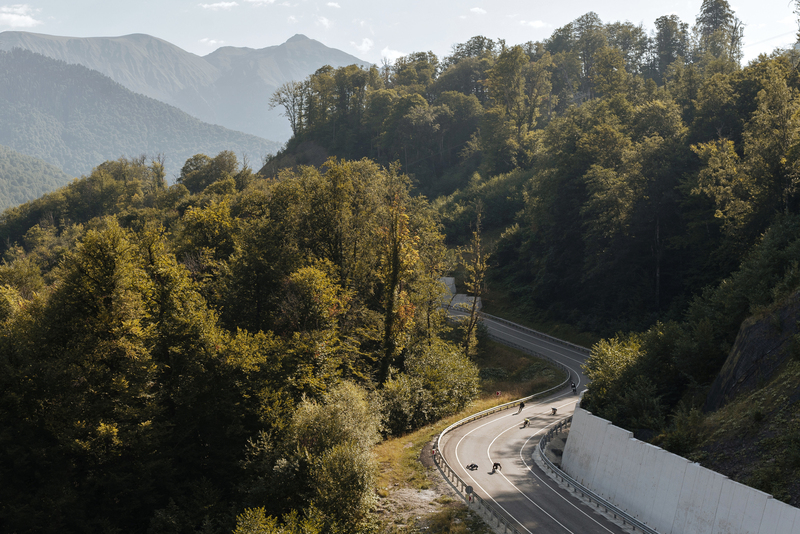 It has a strong spirit of freedom, that fit perfectly to Jean Yves Blondeau mind and family heritage. 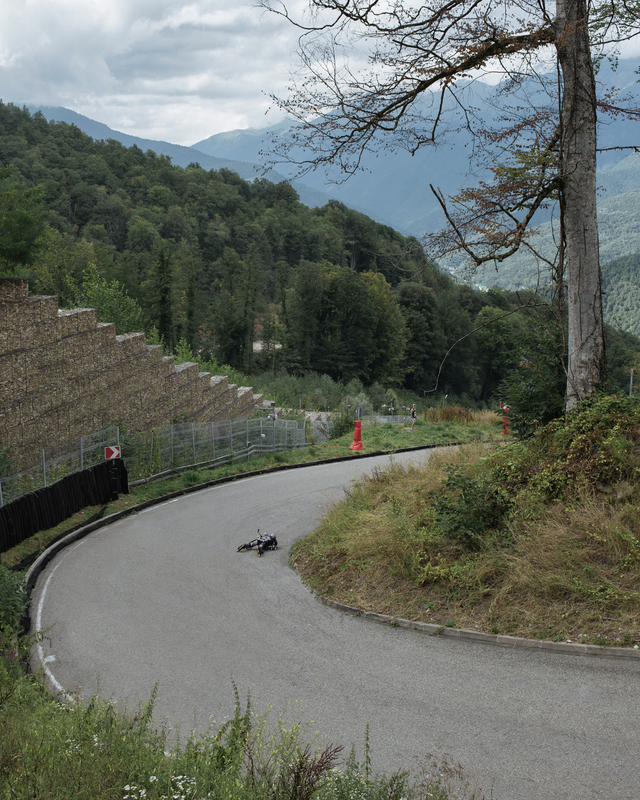 Third you need the mountain with the nice road, the trees and the altitude to get snow. 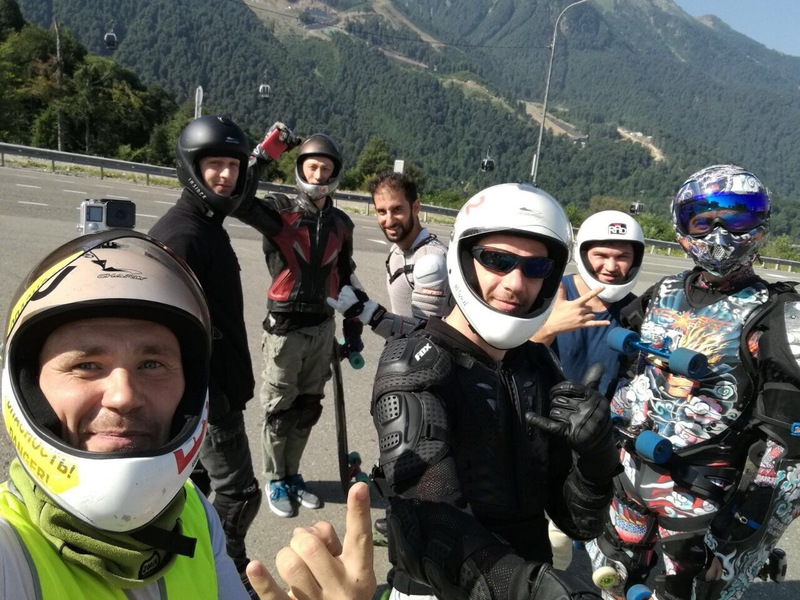 Semnoz mountain just near the home of BUGGY ROLLIN office, beside Annecy belongs to theses magic mountains with an easy access and Wonderfull panoramic. 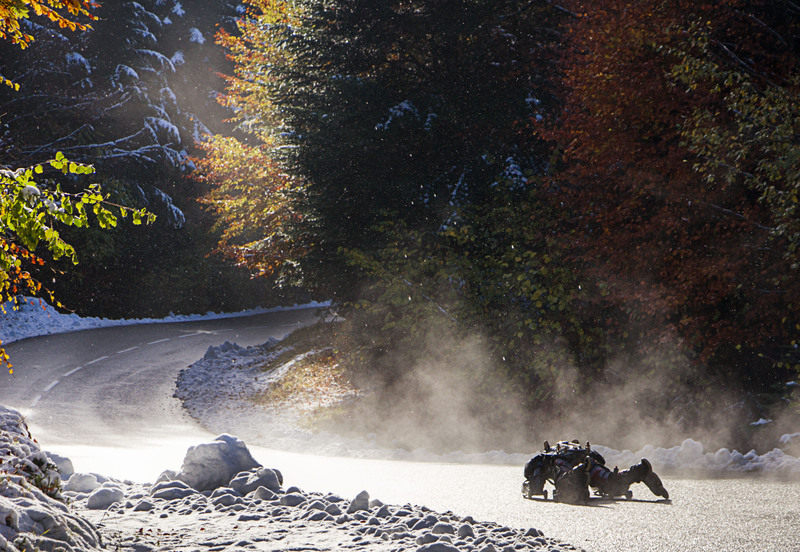 Fourth, you need fall colors with leaves still on the trees, first snow that does not melt straight away. 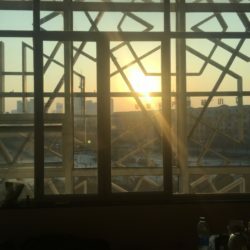 And on the top of that, you need sunshine to put light on the fire of colors. 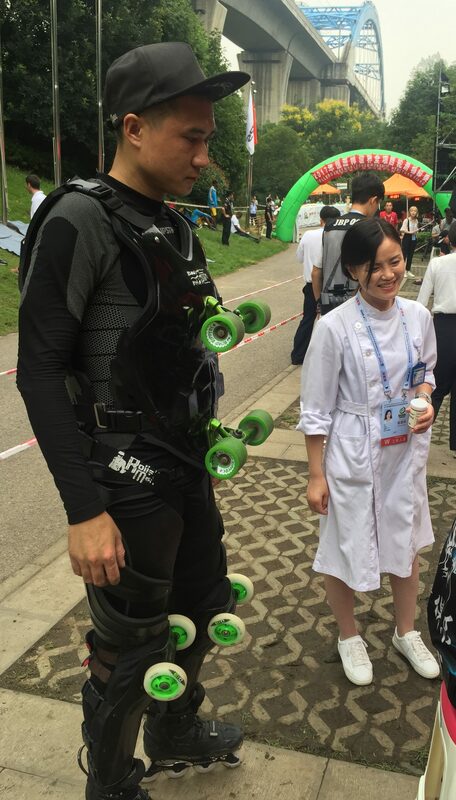 This combination is maybe one day in the year. 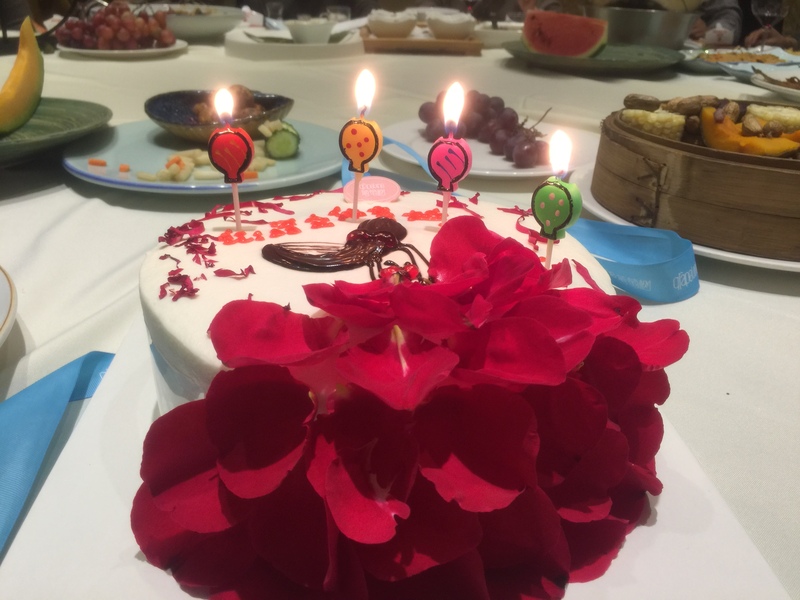 This day should be celebrated as much as easter, christmas or an equinox. 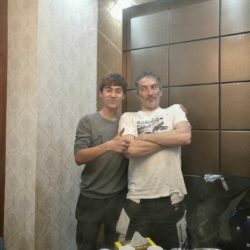 These pictures are a blessing of that existing present. 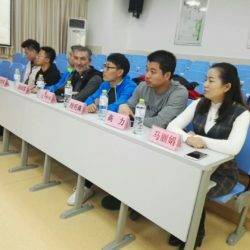 When understanding the needs to achieve this pictures, very need can be consider as a line of possibility that have been focused on one point. 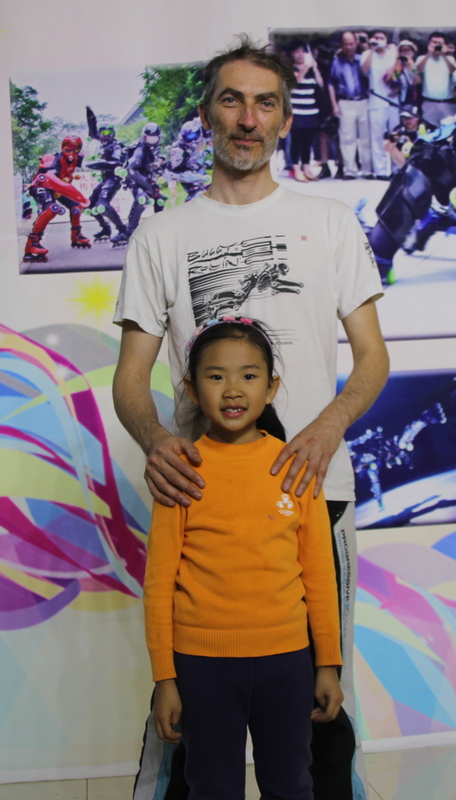 Like a converging lasers beams it create a unit shining point like a star in the sky. 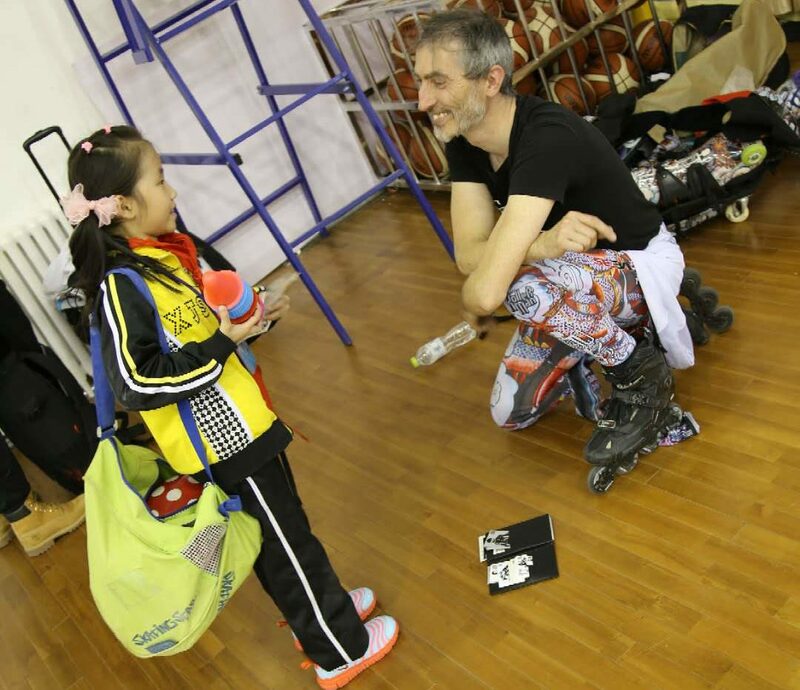 A star that is full of intense happiness, a star that invite you to vibrate to the beauty together. 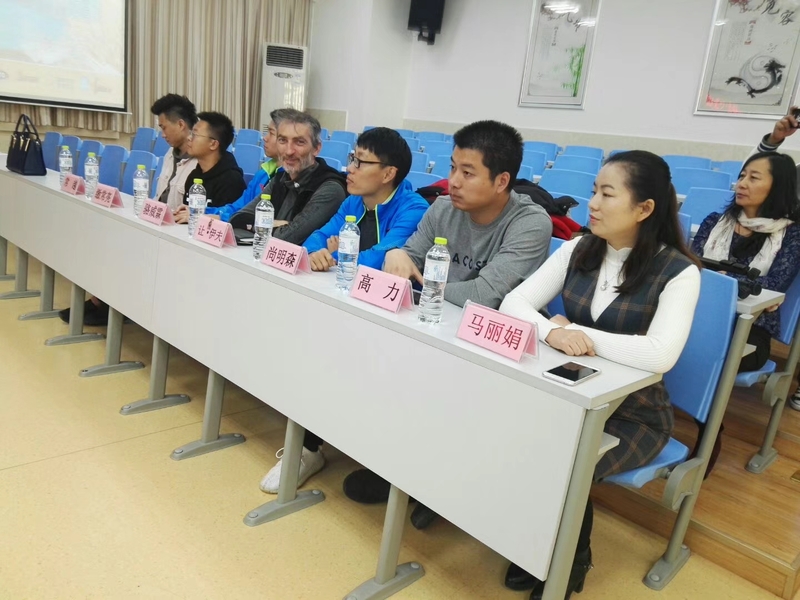 As introduction meeting before the event, the sport government People explained us some special rules applied to this area. 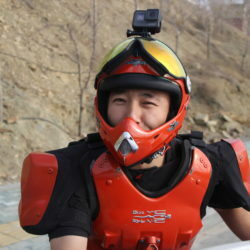 Police can control camera or phone picture at anytime. 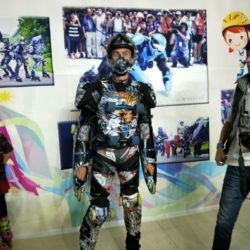 We are not allowed to take picture of police, security, government buildings or government people. 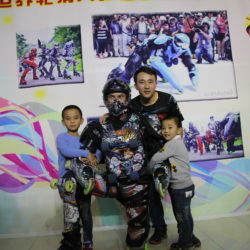 If police ask to control we must cooperate without trouble. 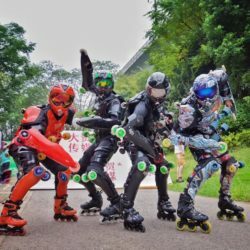 That is no problem because police is not our interest. 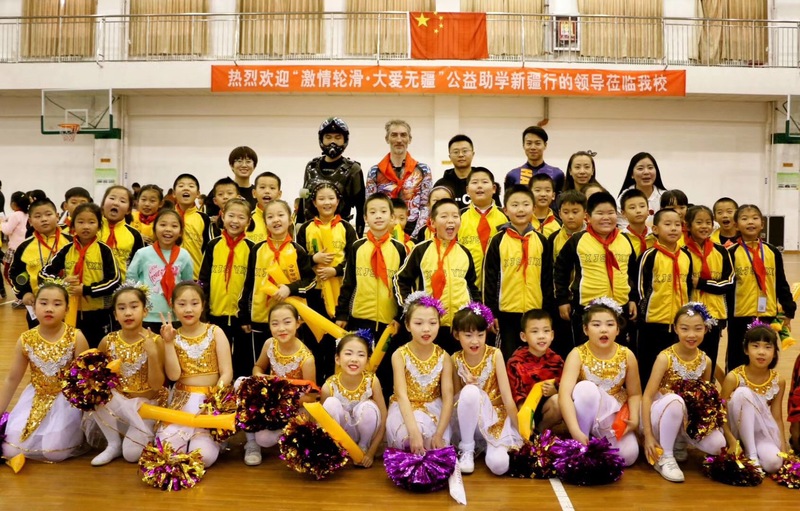 Our interests are sports and education. 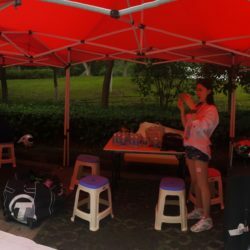 The luggages were scan at each hotel. 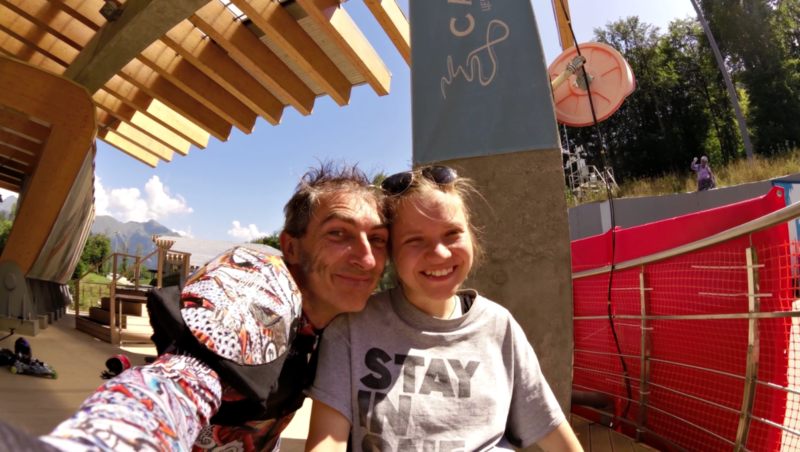 They were scan at parcs gate and restaurants. 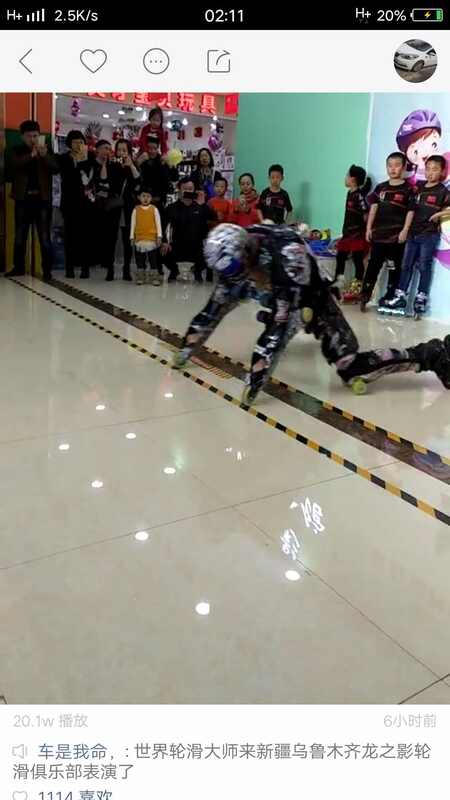 The only thing to do is to cooperate patiently at all control. 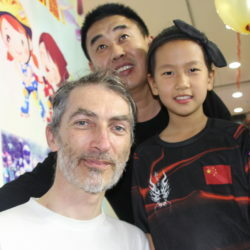 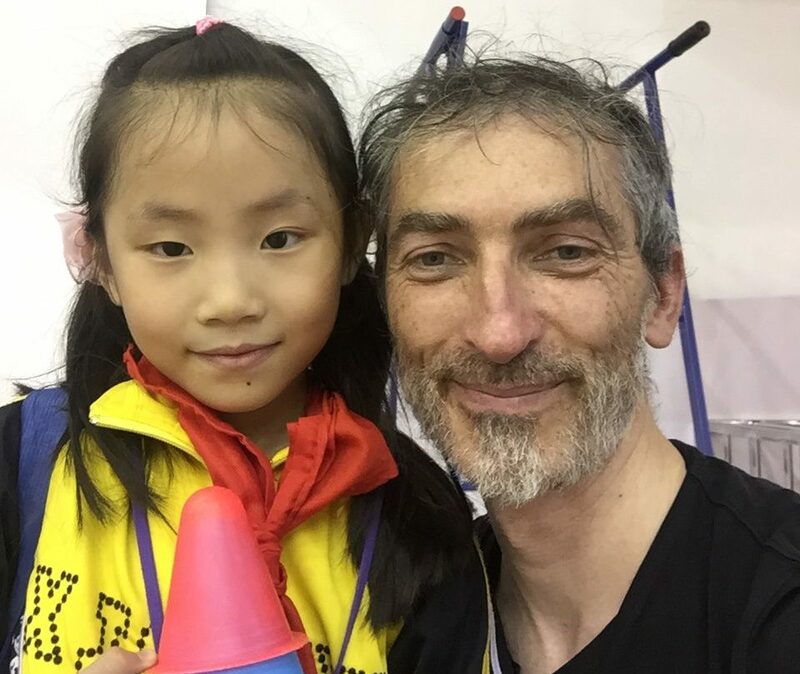 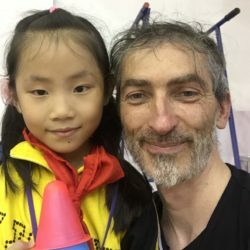 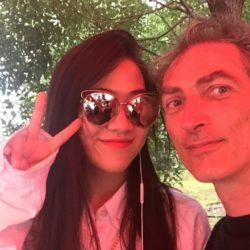 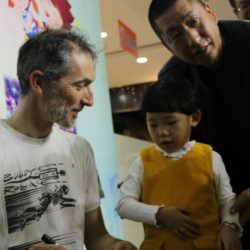 That is the case of the little girl who went directly to speak to Jean Yves asking accurate questions in a perfect english. 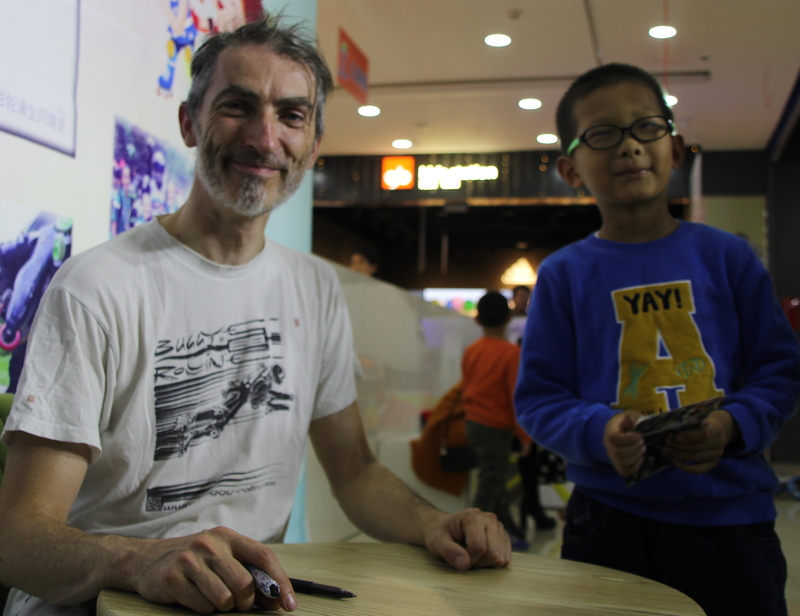 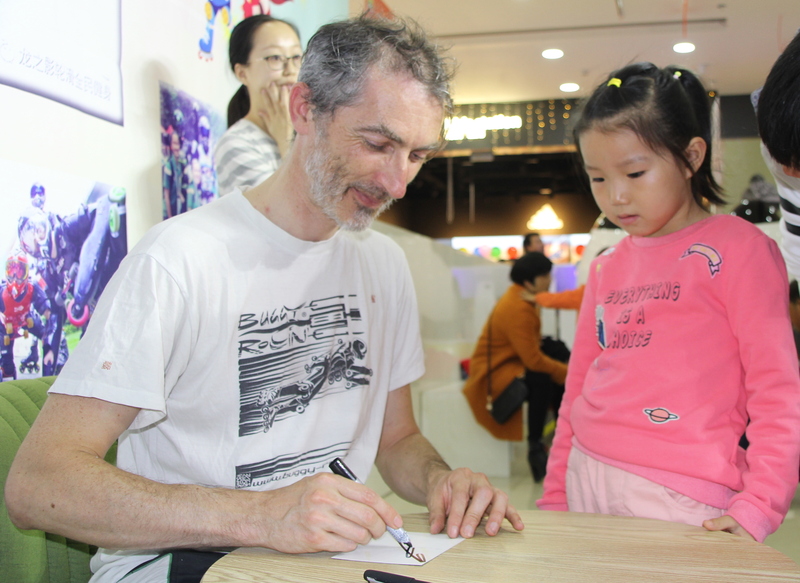 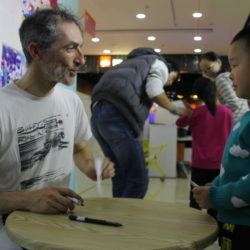 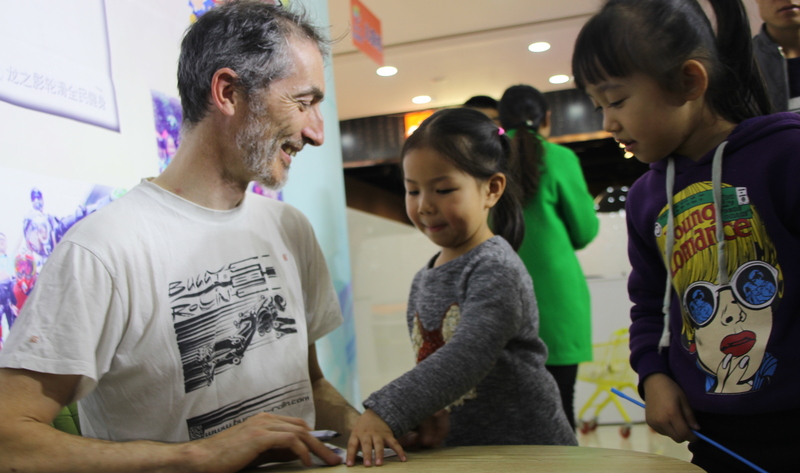 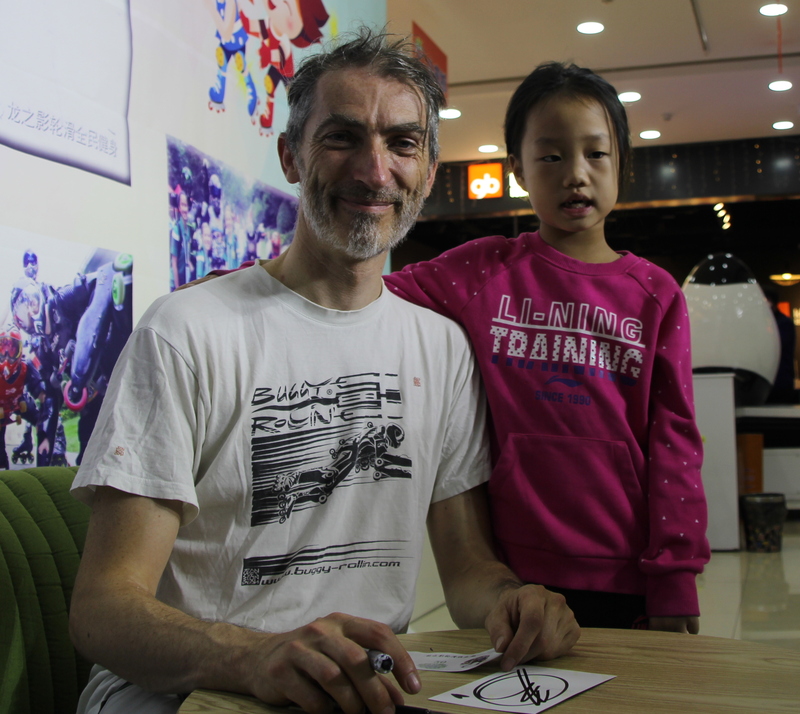 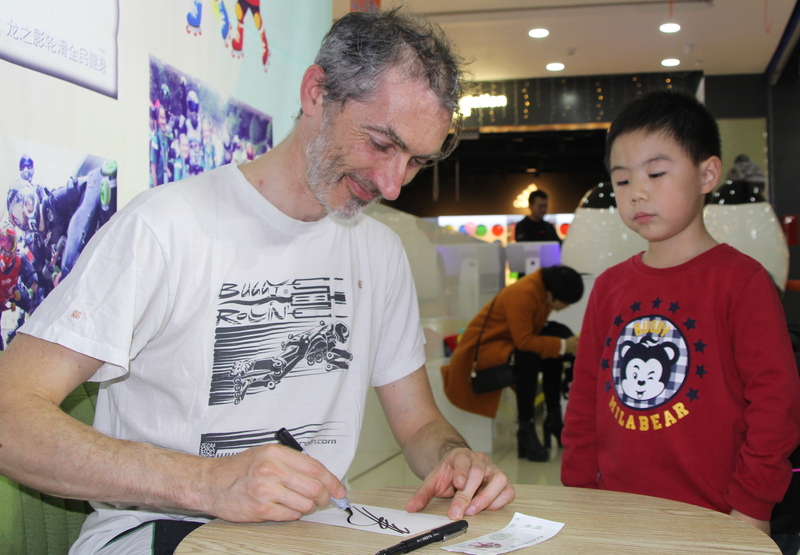 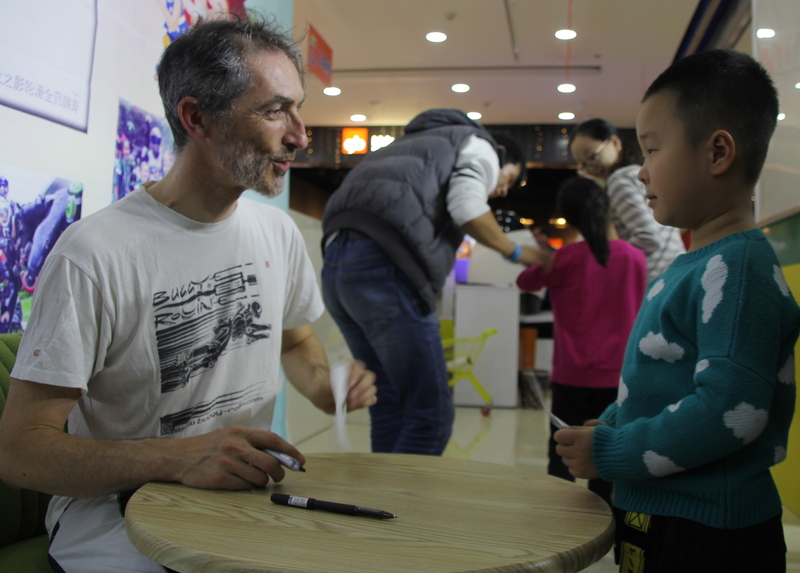 After show we made some pictures and signature with the kids. 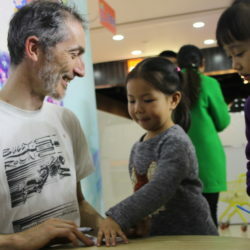 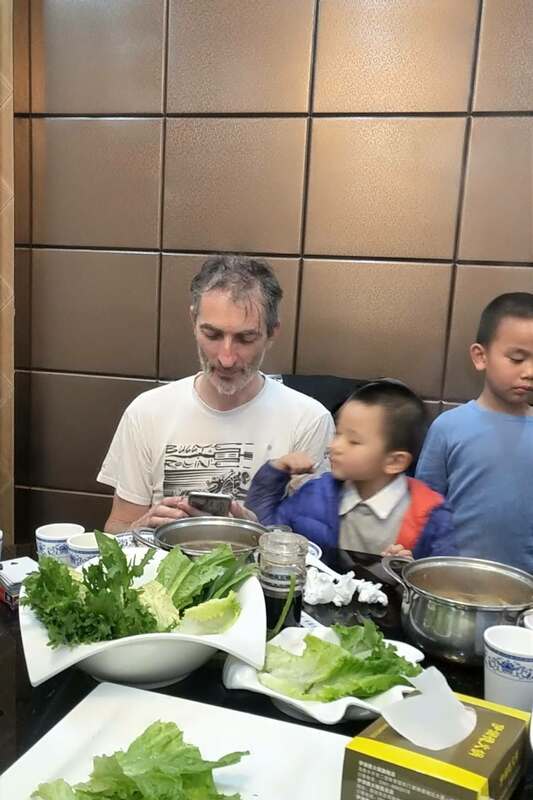 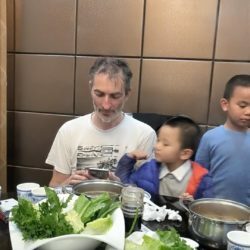 The contact with the children is very refreshing. 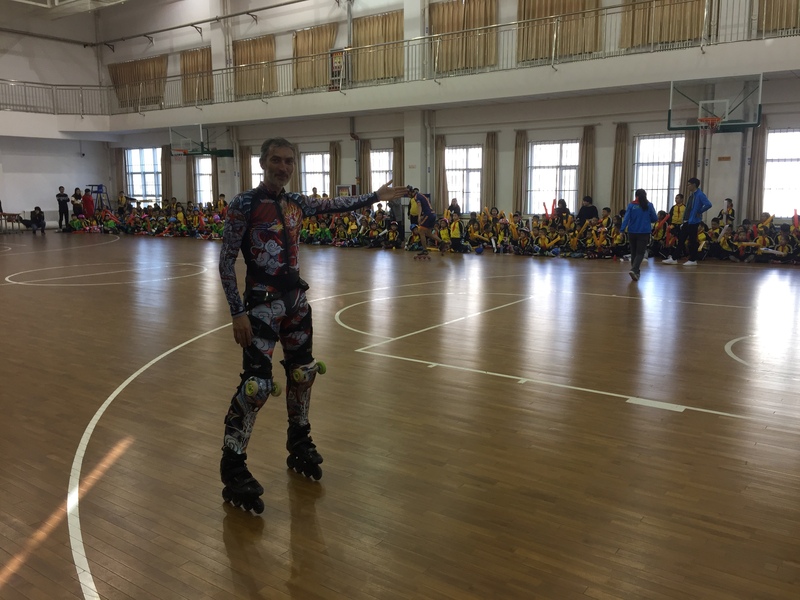 We visited two schools. 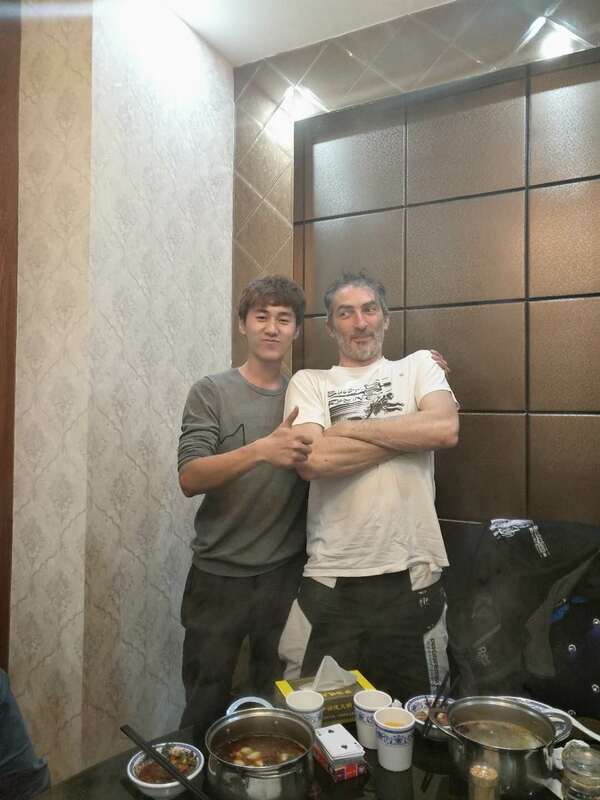 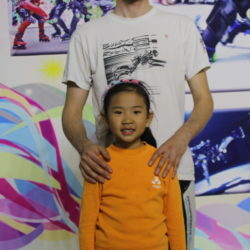 One in Urumqi and the other one was in the city of Karamai. 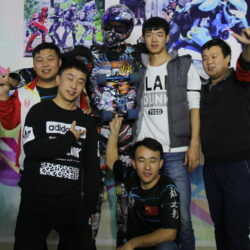 Karamai is the number one place in china to produce petrol. 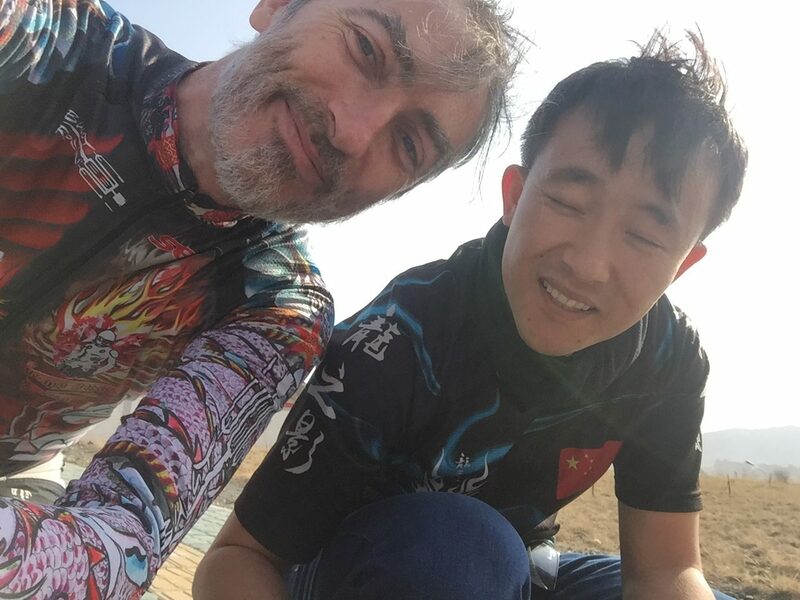 Surprisingly, the petrol is plopping out of the top of hill in the desert. 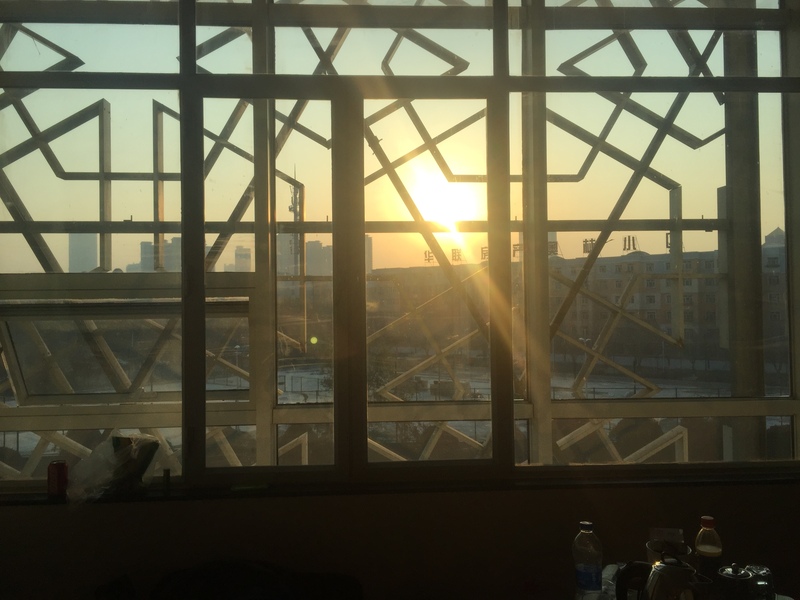 Urumqi is the home fo Xiao Long. 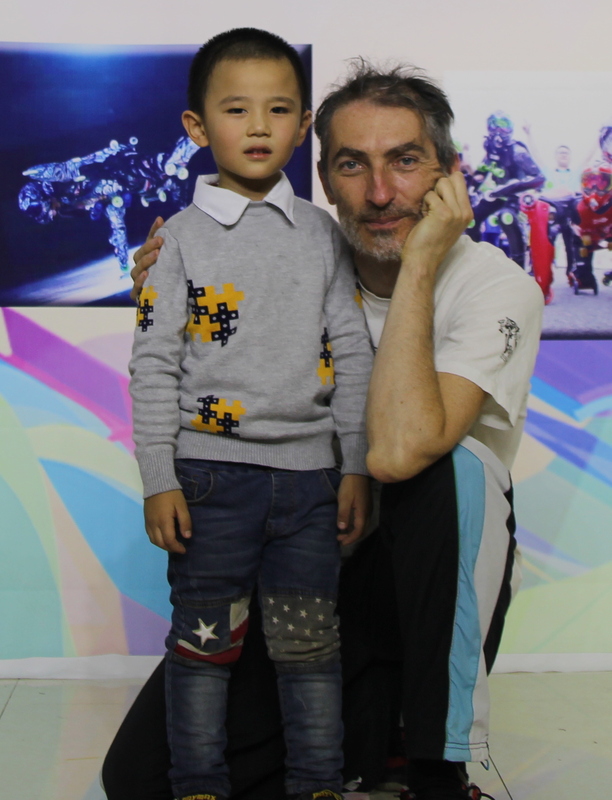 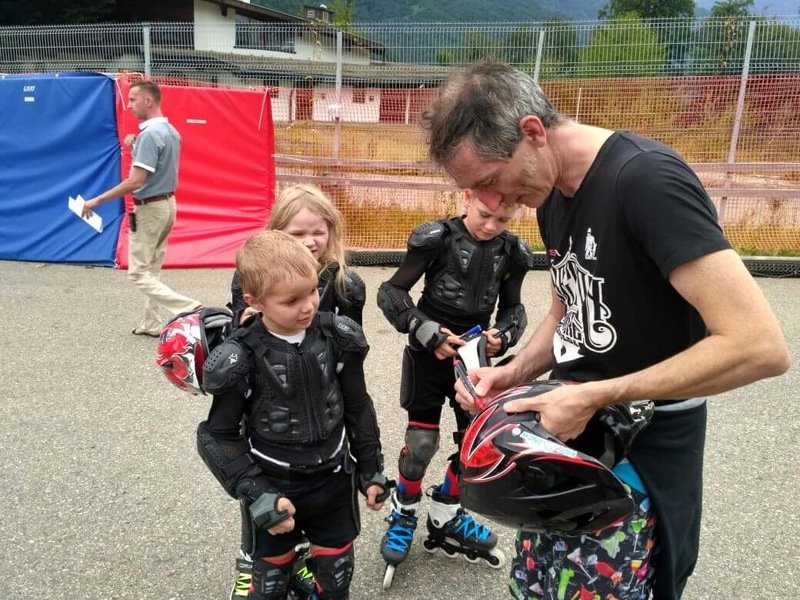 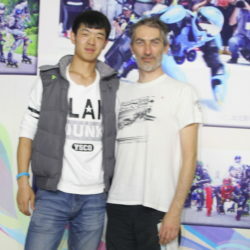 So Jean Yves came to visit him at his skate school and made a show for him. 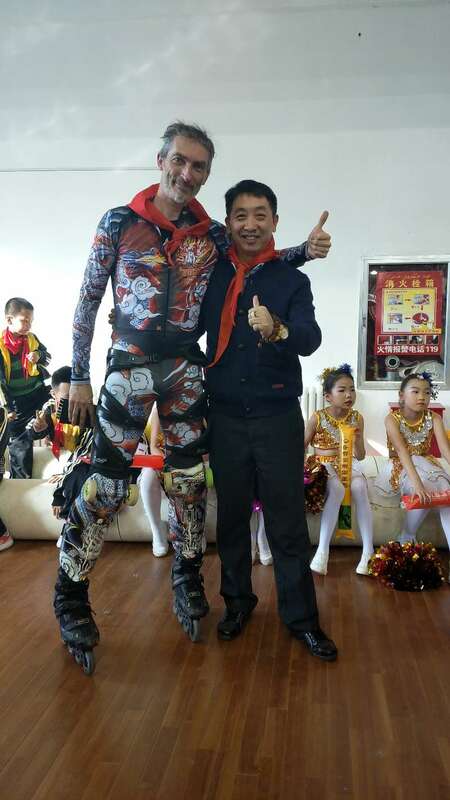 He was not invited to make show in the schools. 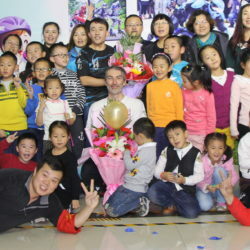 But after Jean Yves asked the authorities he was invited to go in the last schools were Jean Yves could not. 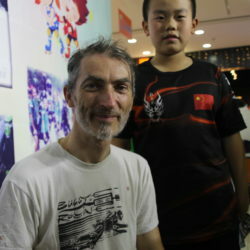 Being introduced to Xiao Long kids was nice, and seeing his school was helping to understand who he is. 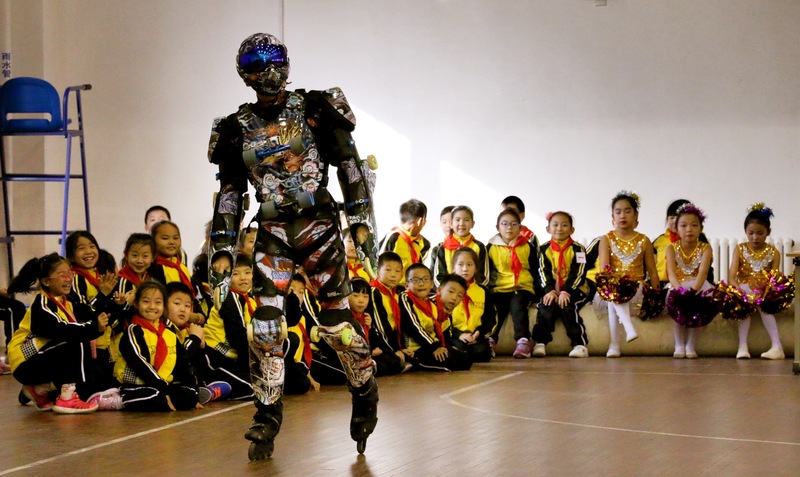 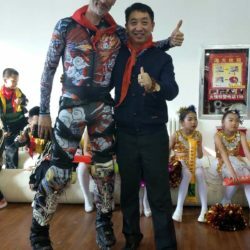 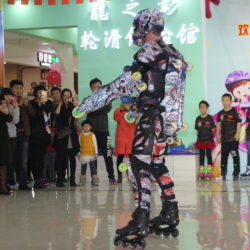 Instead if Xiao Long, Chang Yue was invited to make show in school wearing BUGGY ROLLIN wheelsuit. 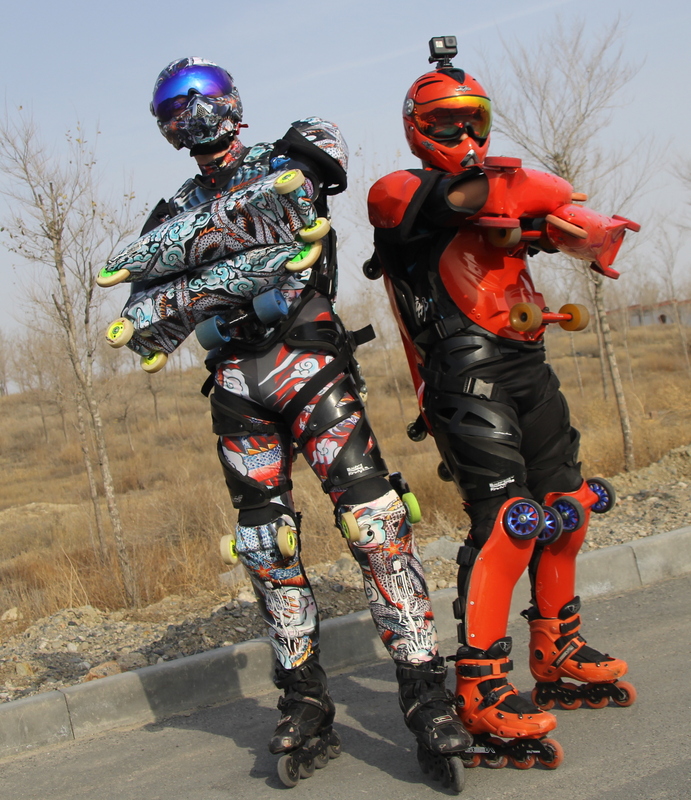 So we were 2 BUGGY ROLLIN at Urumqi schools. 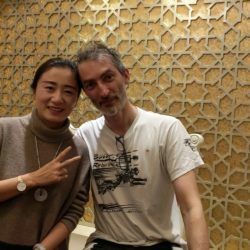 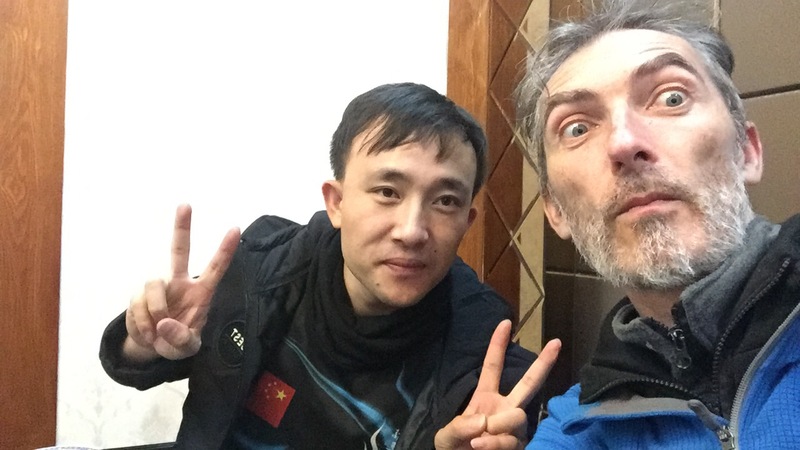 It was nice to spend time with Chang Yue learning each other and make training outdoor cold morning and at night in hotel lobby of Karamai. 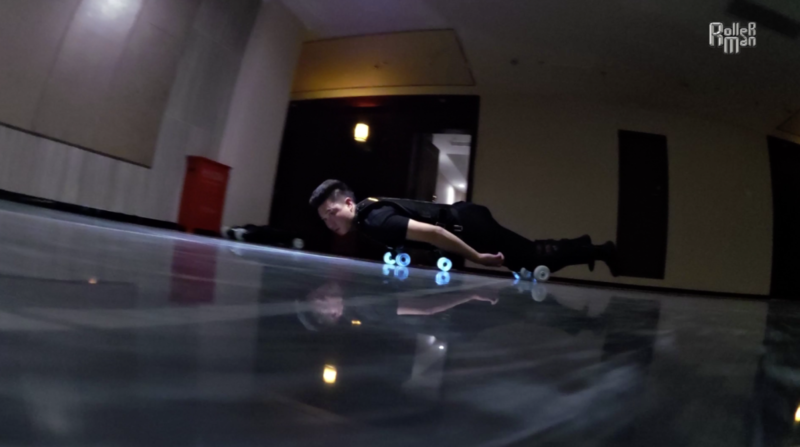 In the hotel Lobby at deep night we were making exercices to push only with legs and make tight turn in skelton position . 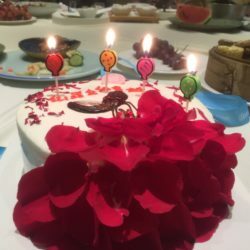 Dinner with official and special cake for Rollerman. 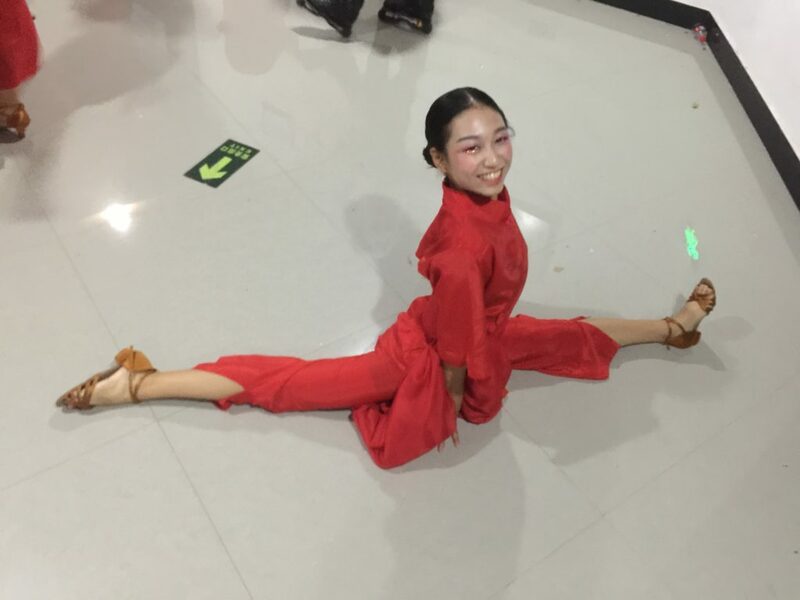 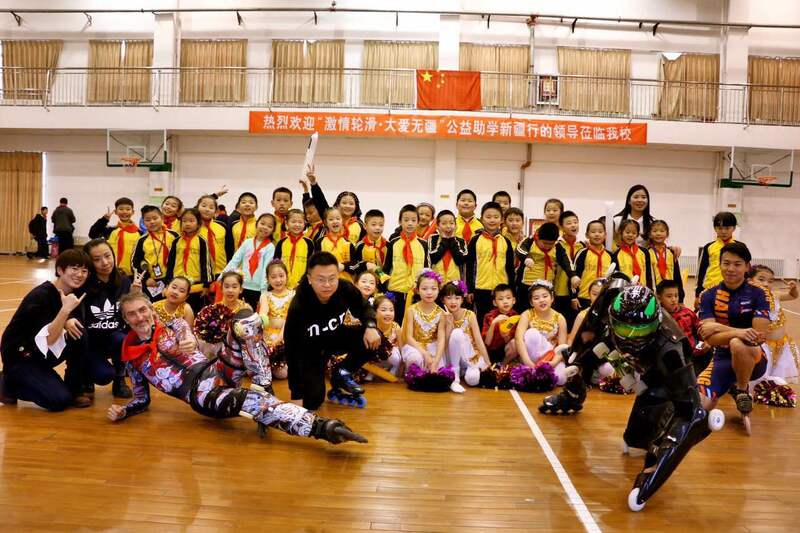 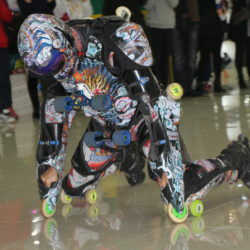 Performance at Xiao Long Skate school. 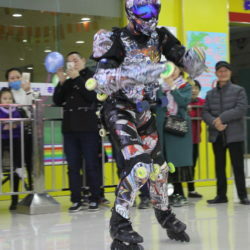 Rollerman show at Urumqi and Karamai school. 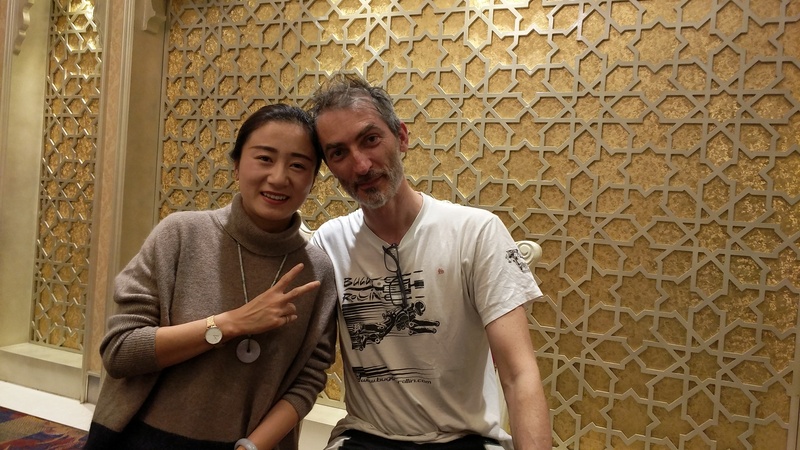 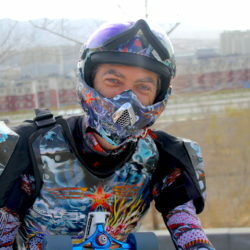 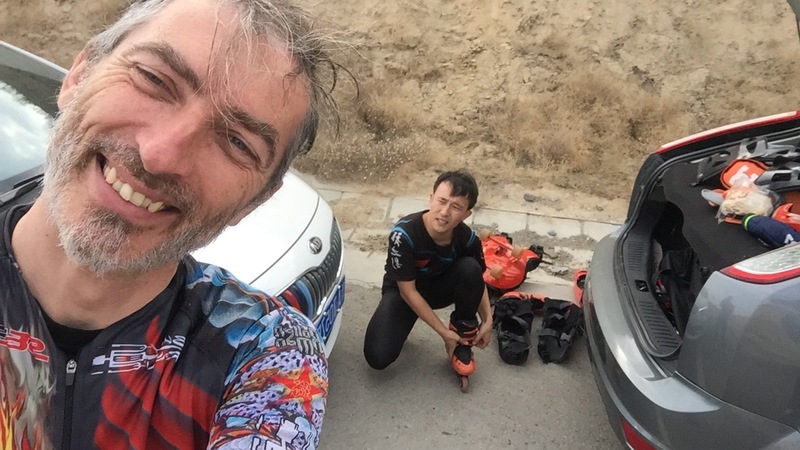 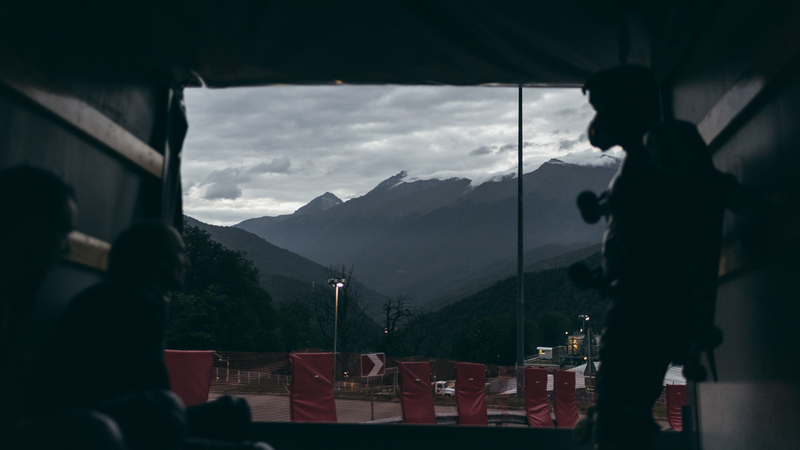 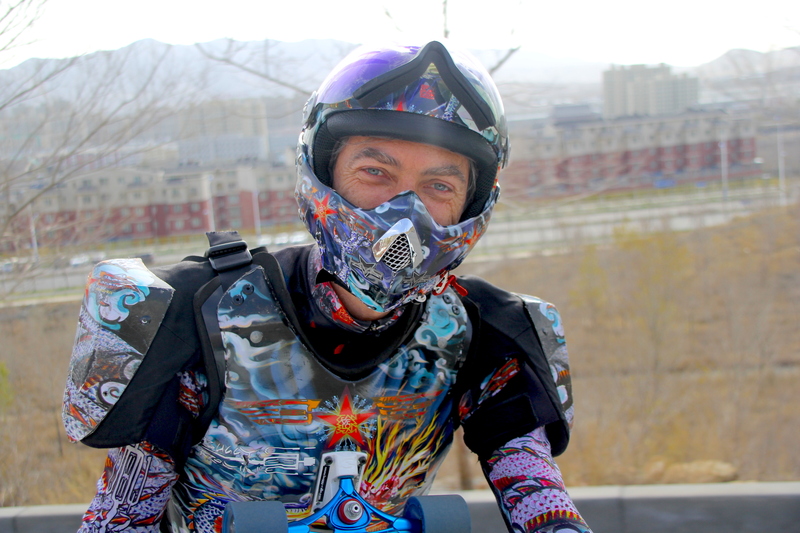 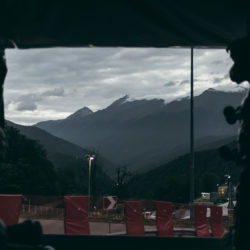 The last day, just before Jean Yves Blondeau had to take airplane back to Europe, we decided to go outside the city of Urumqi for freeride. 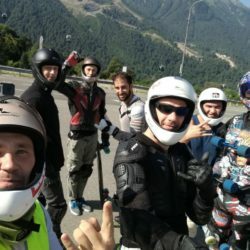 First we tried a small road near the city. 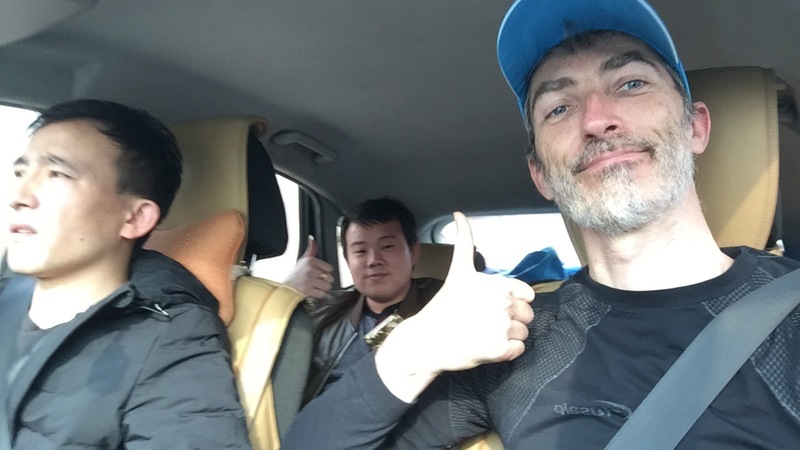 But then Xiao Long was getting frustrated that the road was so short. 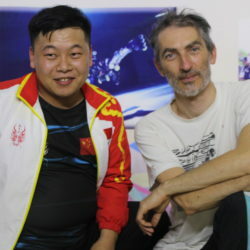 So he cancelled his own schedule to stay more with Jean Yves. 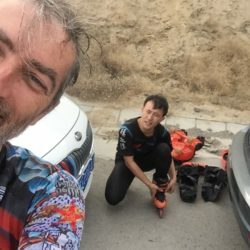 They went together one hour away from the city. 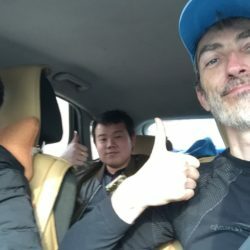 The second road was longer but boring. 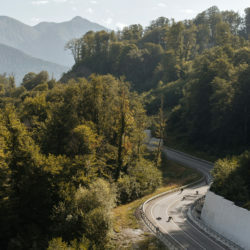 Finally we could find an exciting road starting near a dam in the mountain. 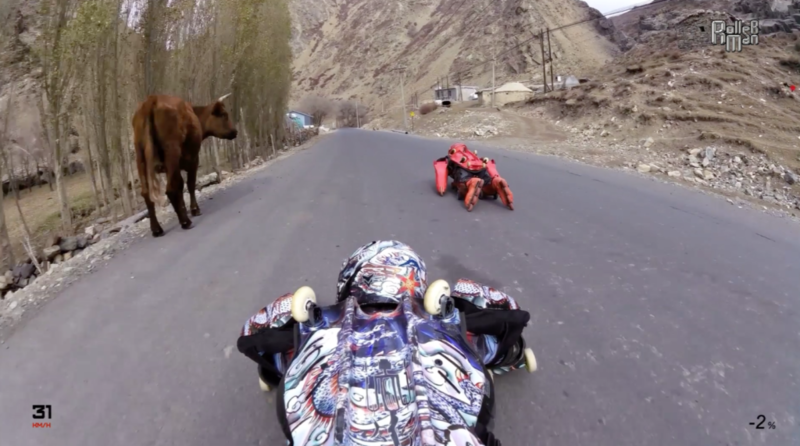 On the road, were running with us, chicken, donkeys and cows. 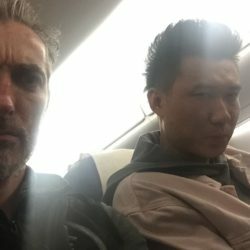 We came just in time back to airport for Jean Yves . 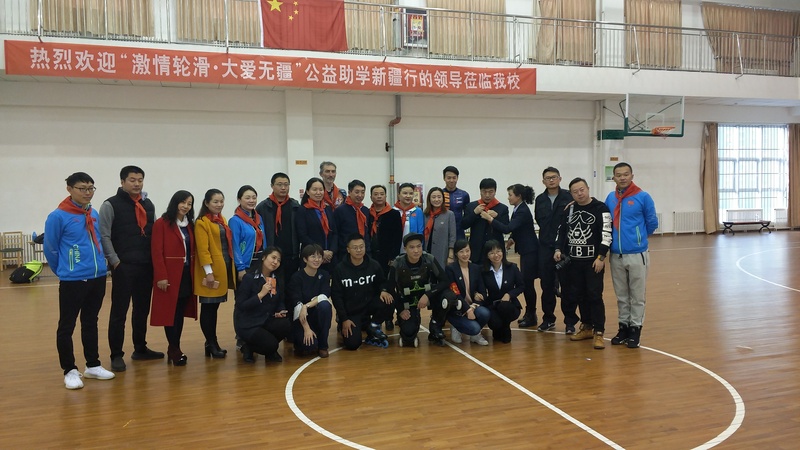 And for the end the pictures of the people at Xiao Long School. 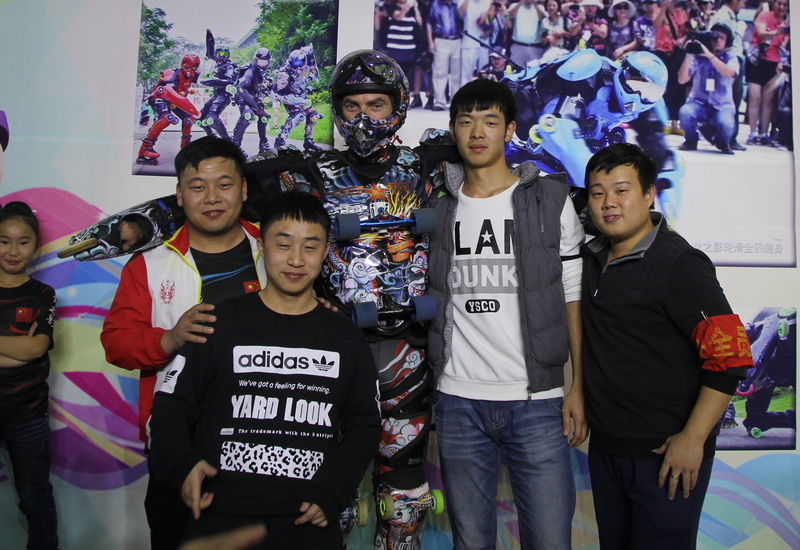 After the show people took time to make picture with Jean Yves Blondeau Without the BUGGY ROLLIN armor. 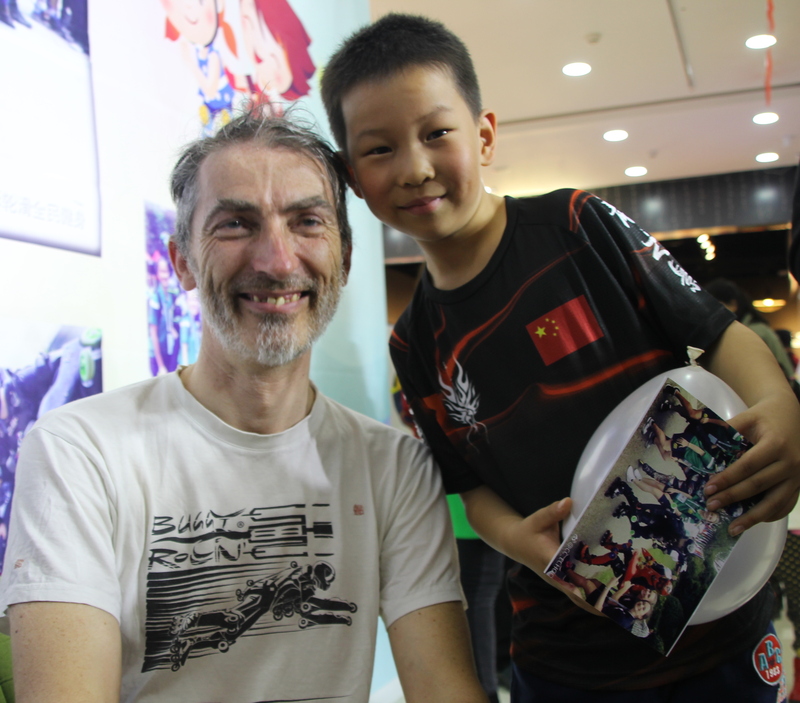 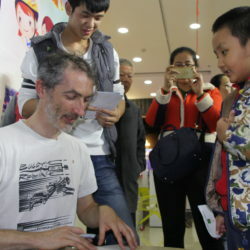 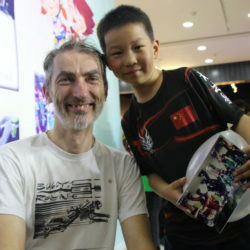 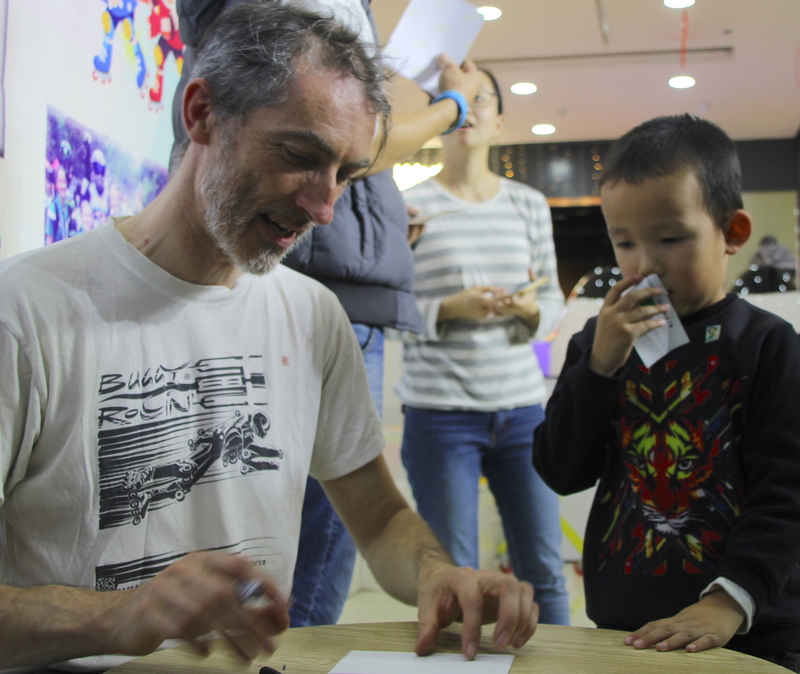 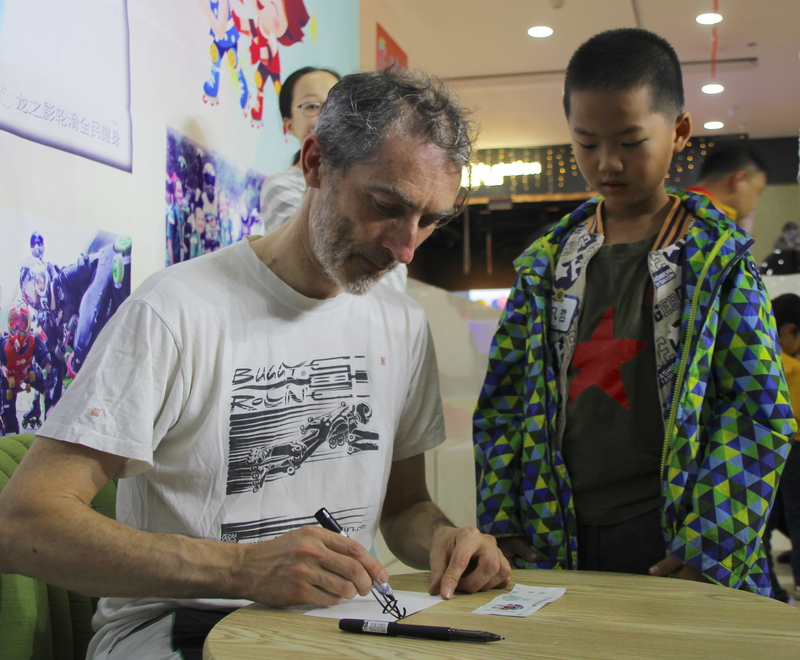 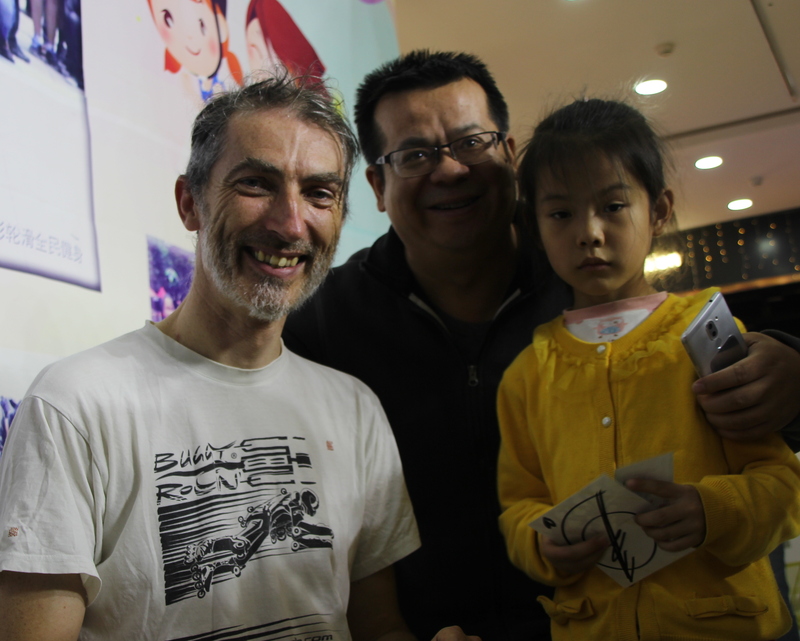 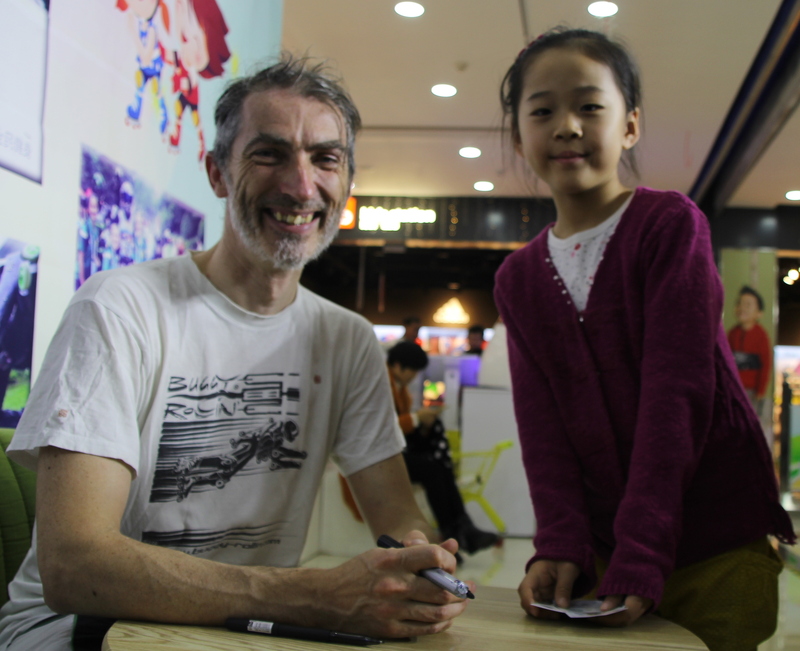 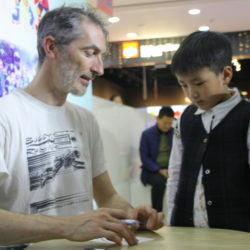 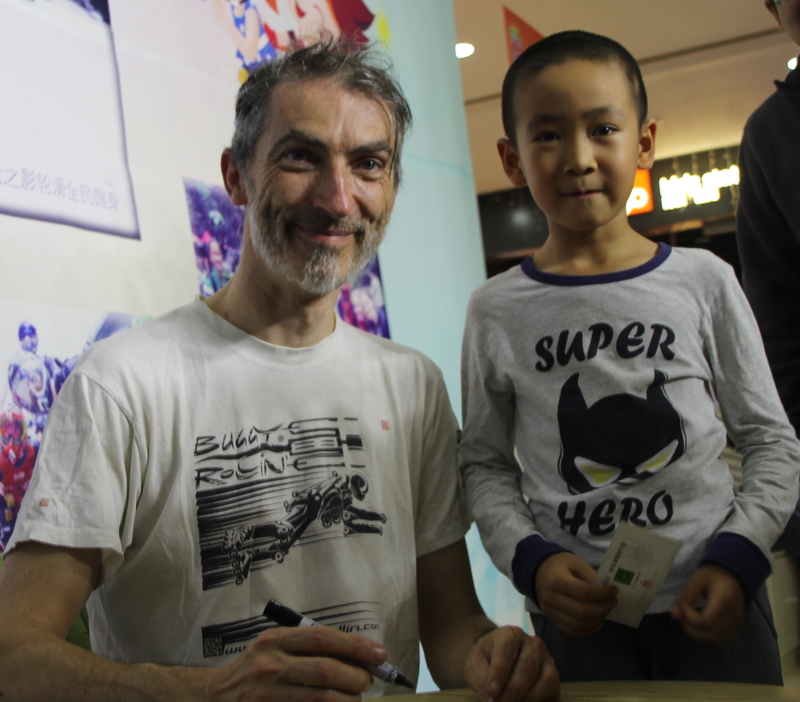 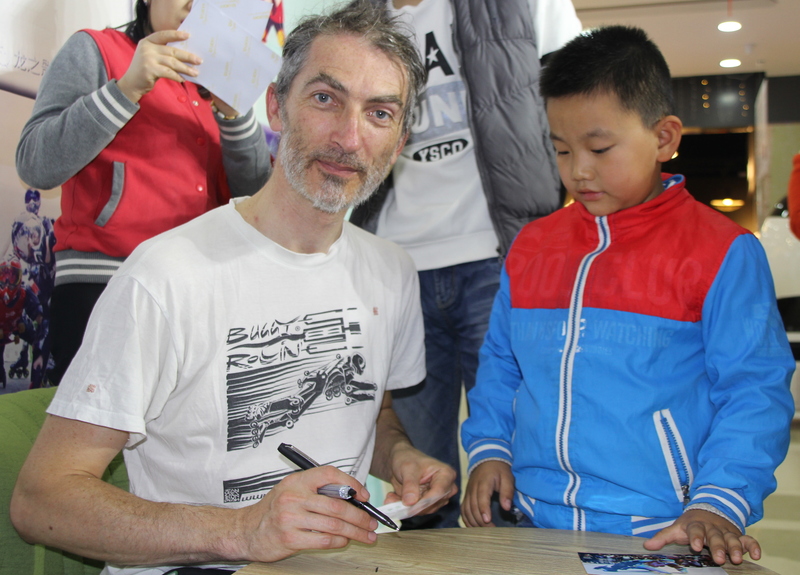 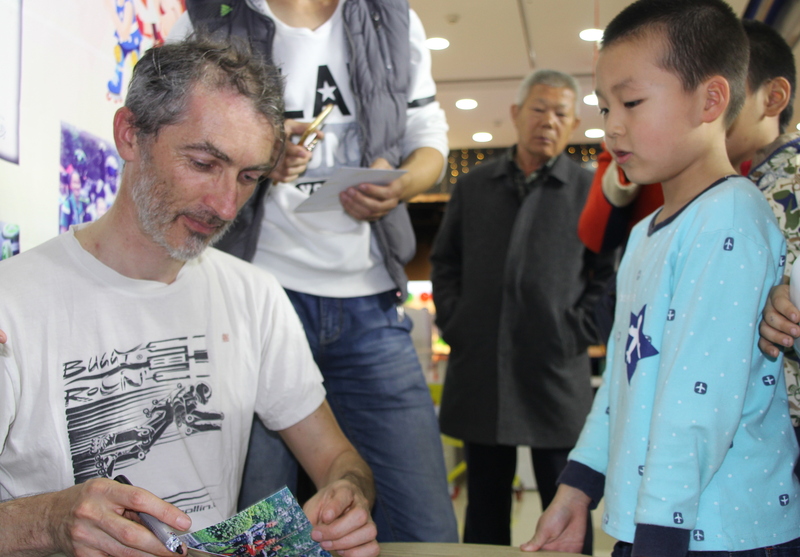 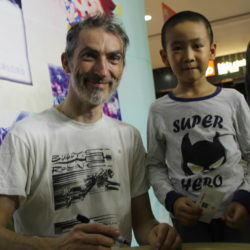 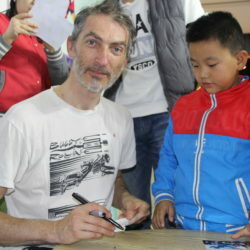 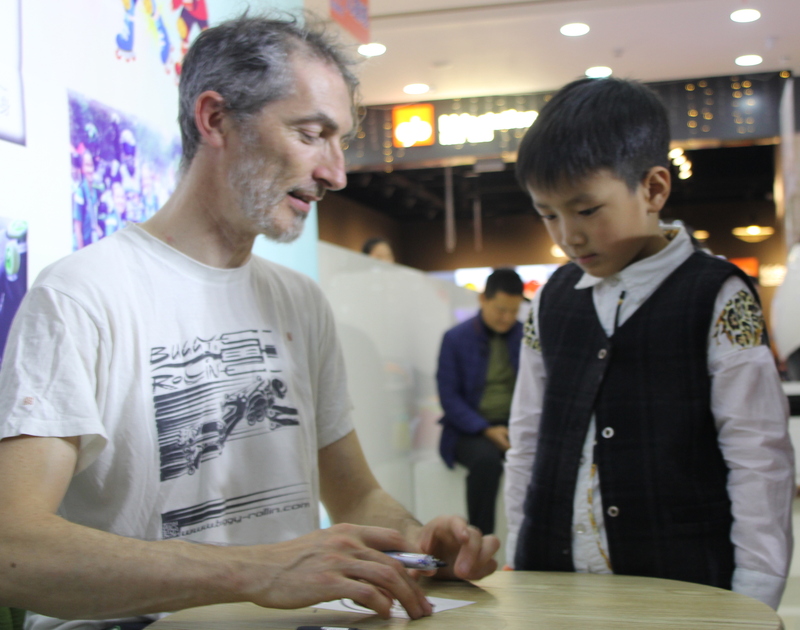 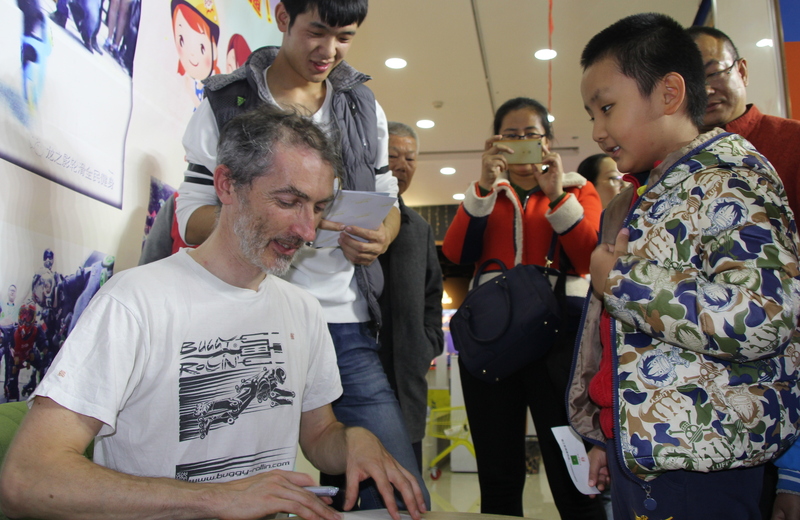 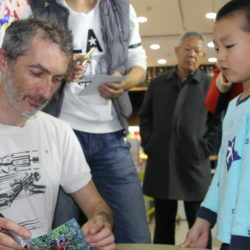 they coud get some signed postcard and stickers from Jean Yves and talk to him directly. 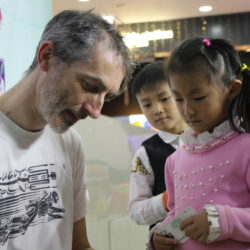 This direct contact is essential for Jean Yves. 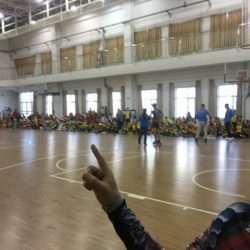 It makes a very special color in life. 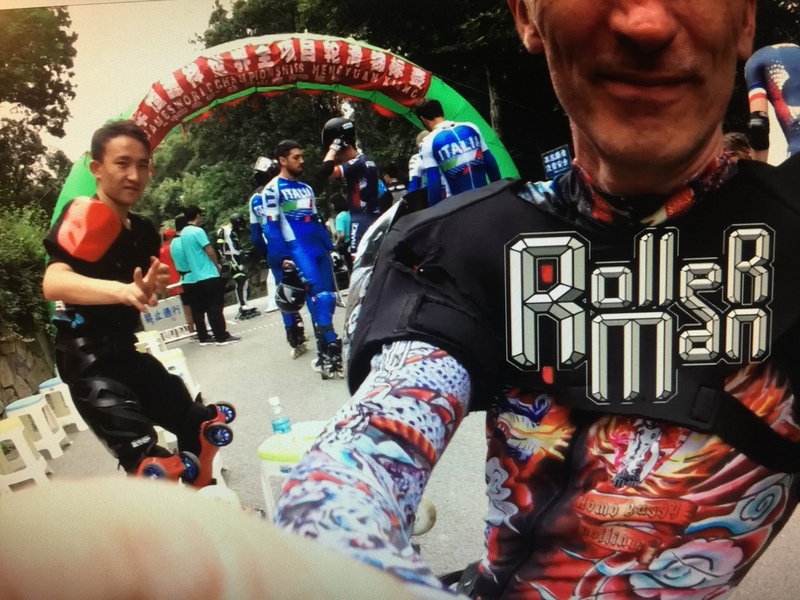 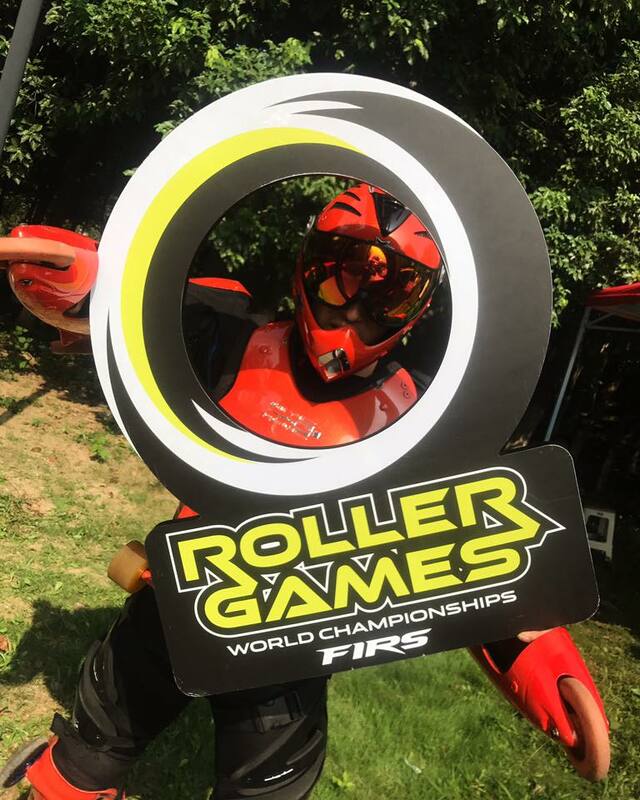 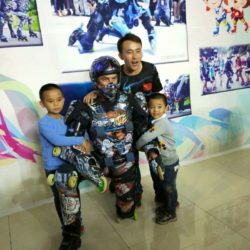 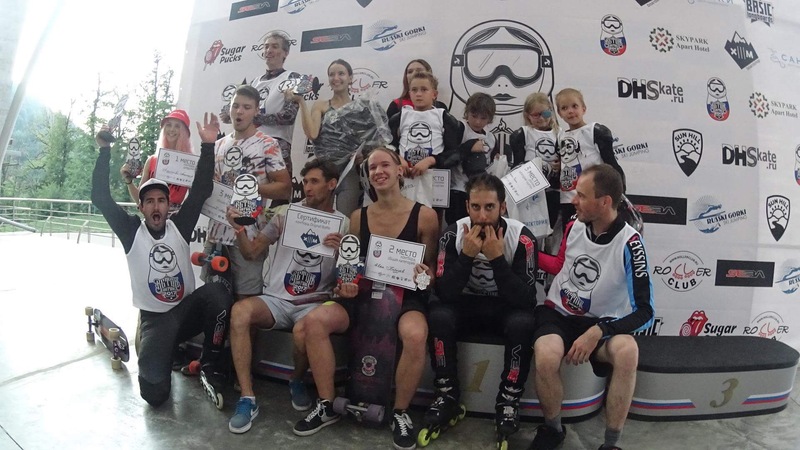 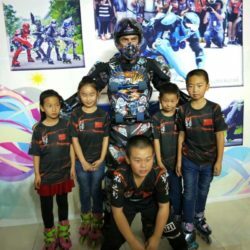 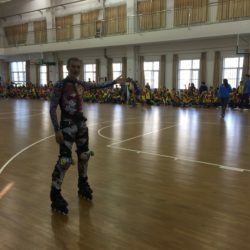 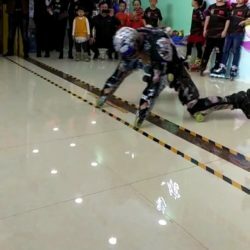 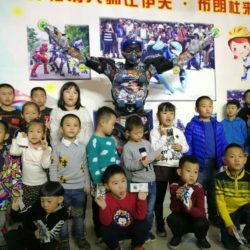 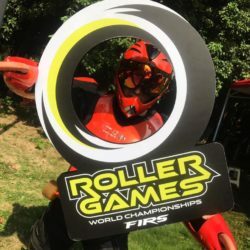 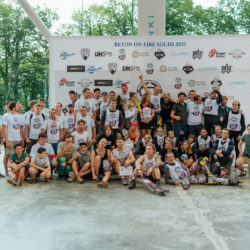 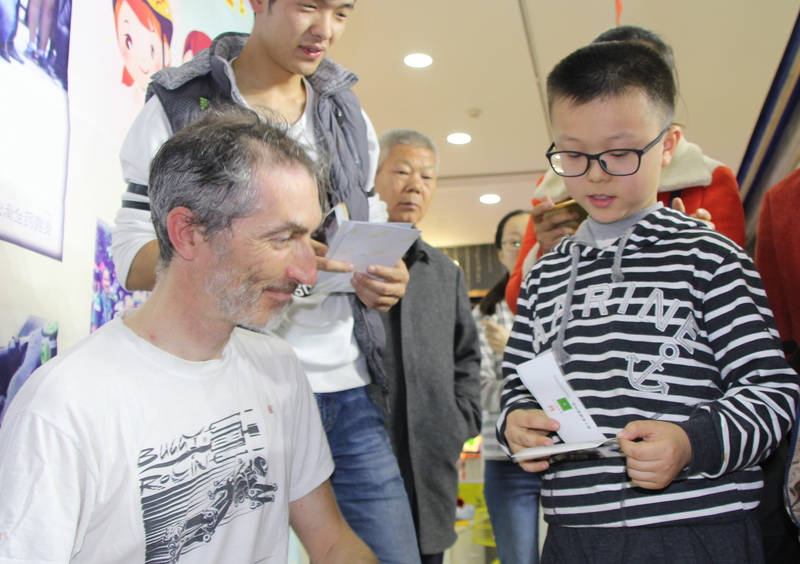 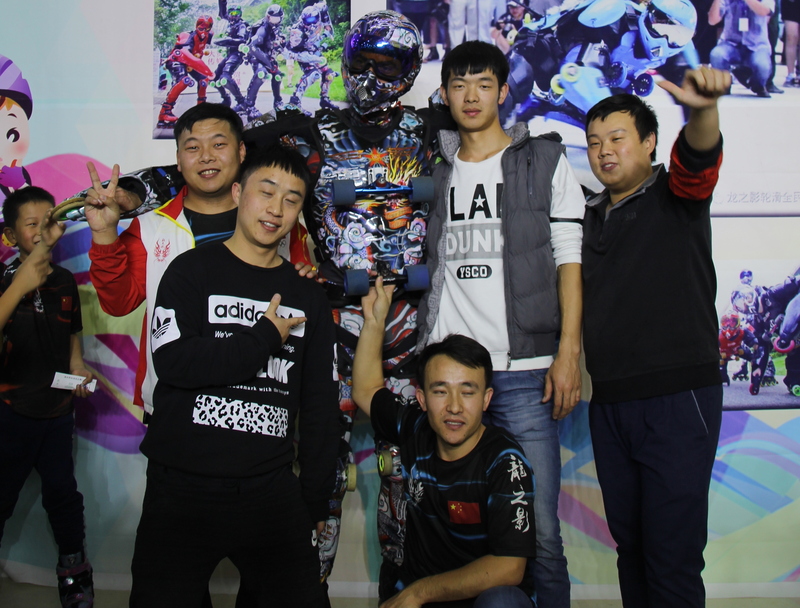 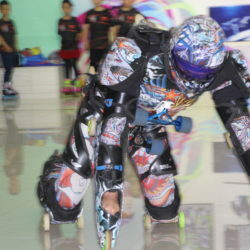 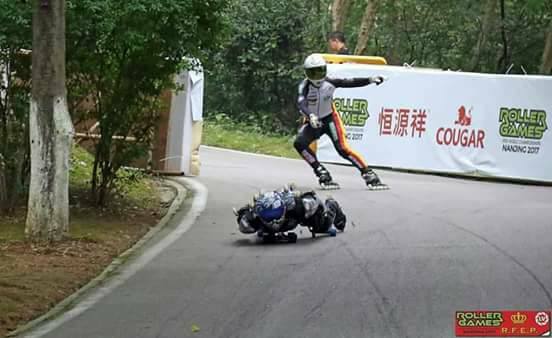 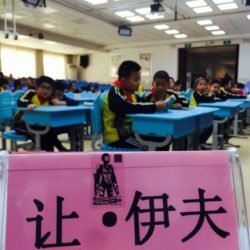 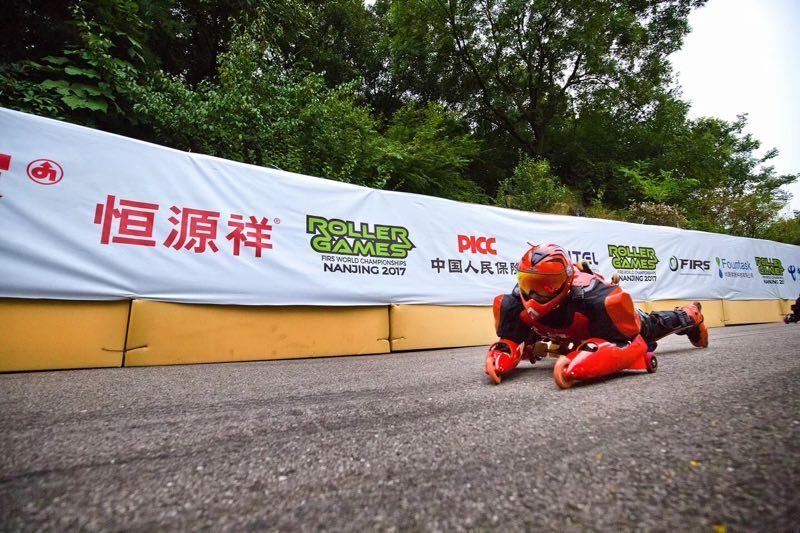 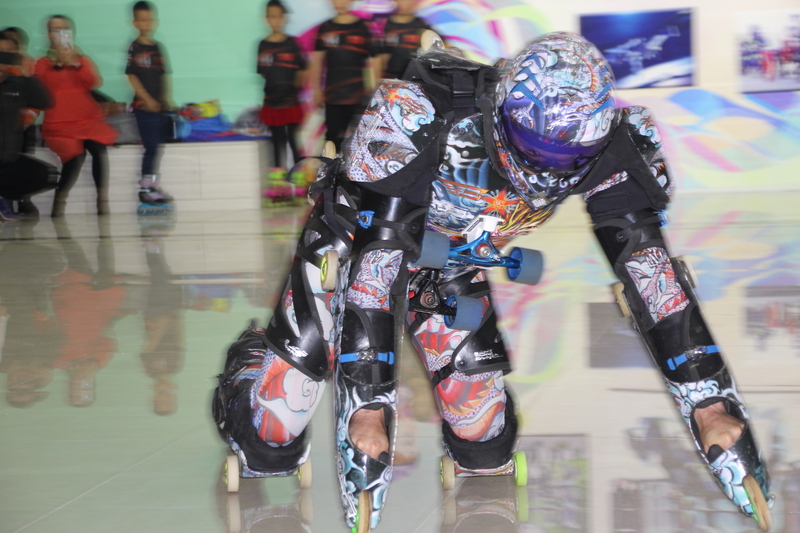 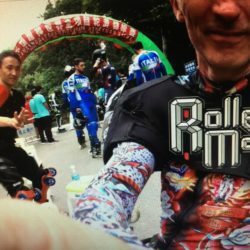 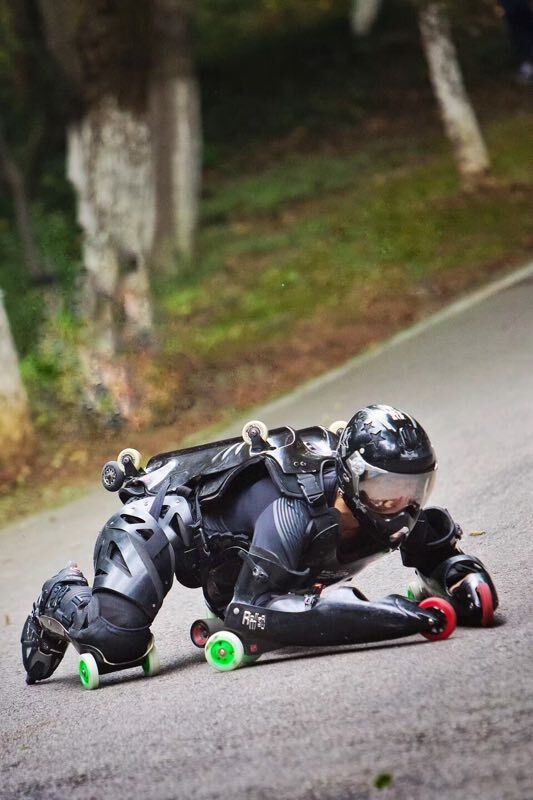 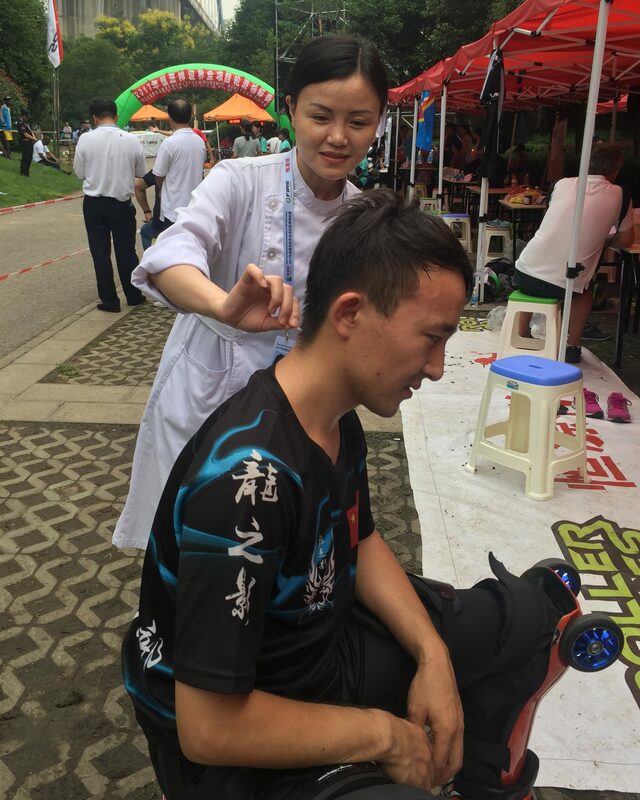 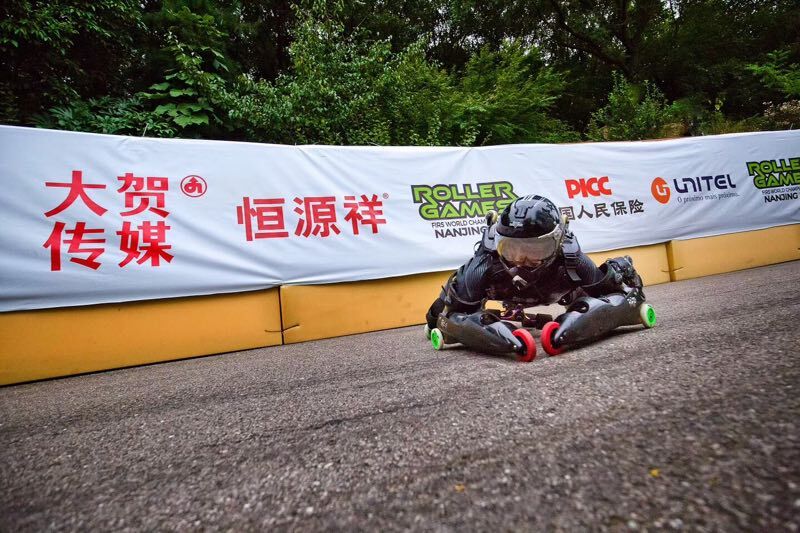 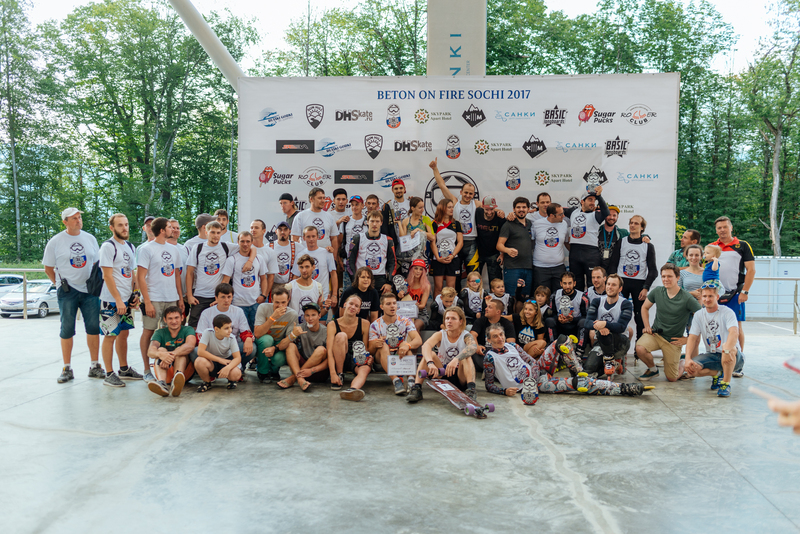 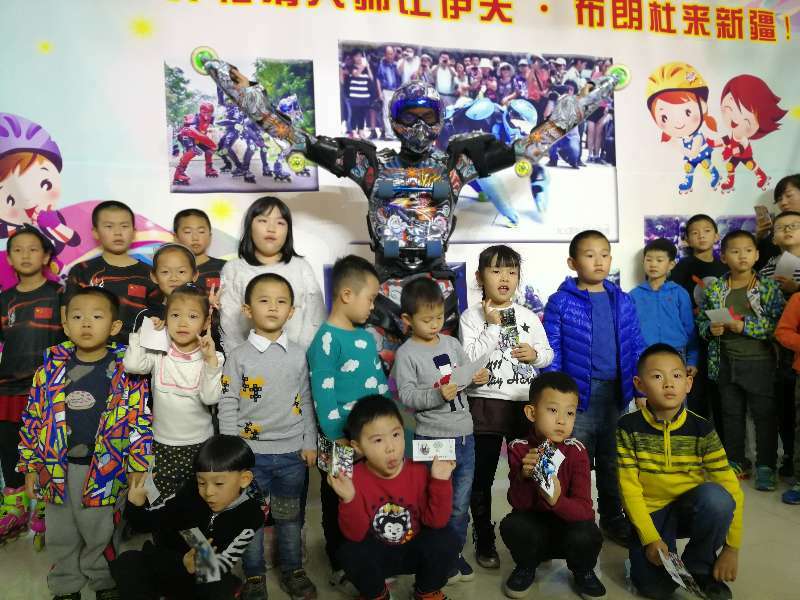 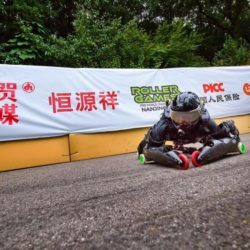 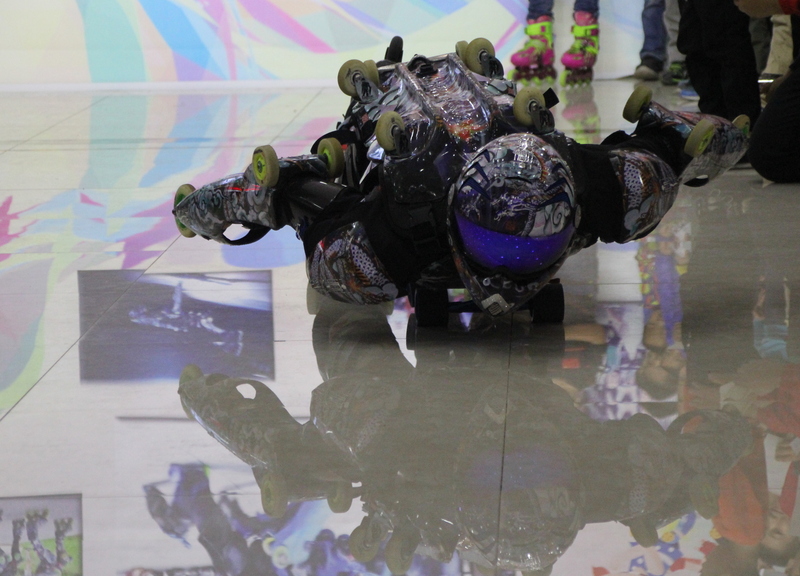 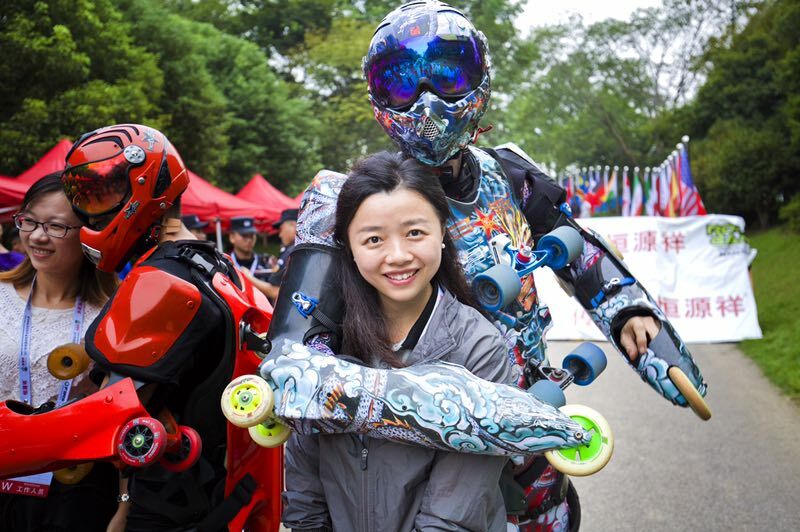 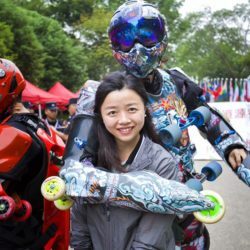 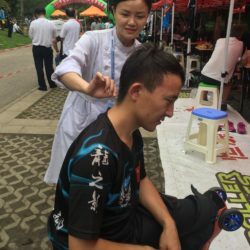 Roller Games were hold in Nanjing in 2017. 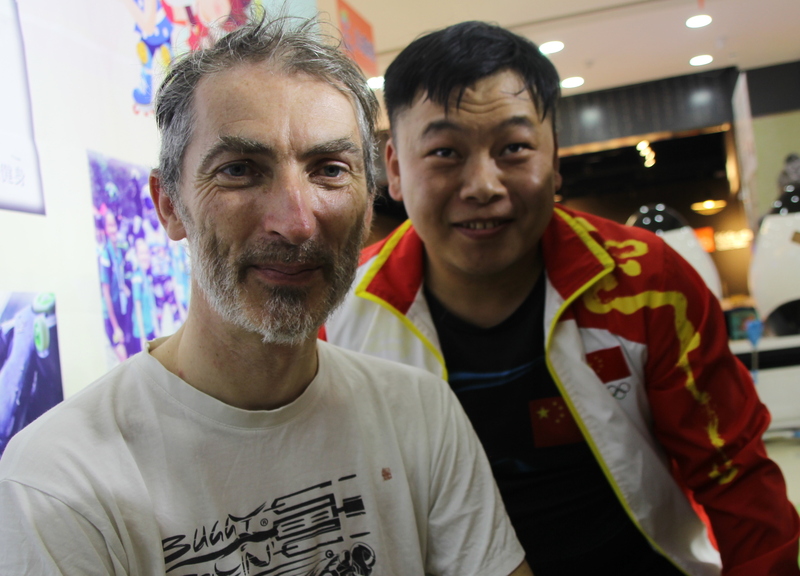 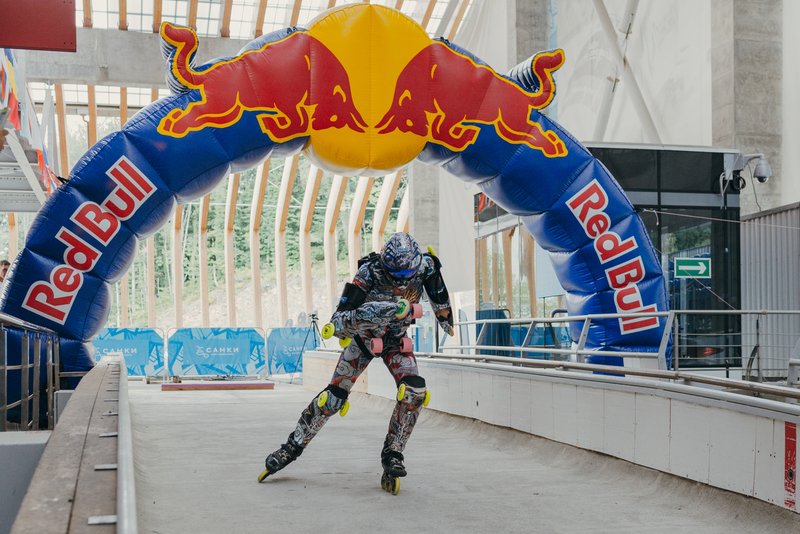 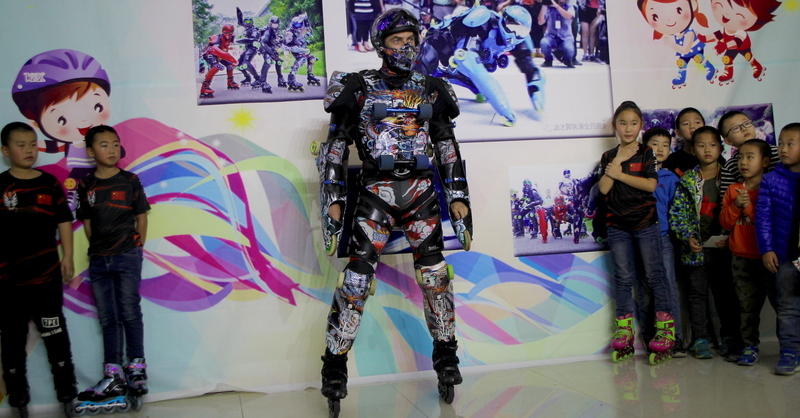 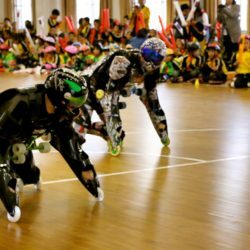 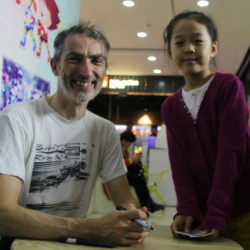 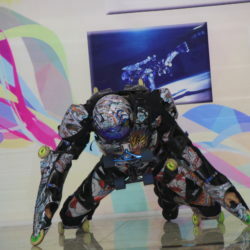 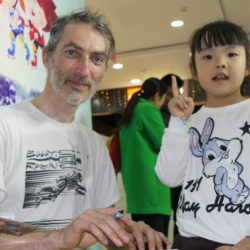 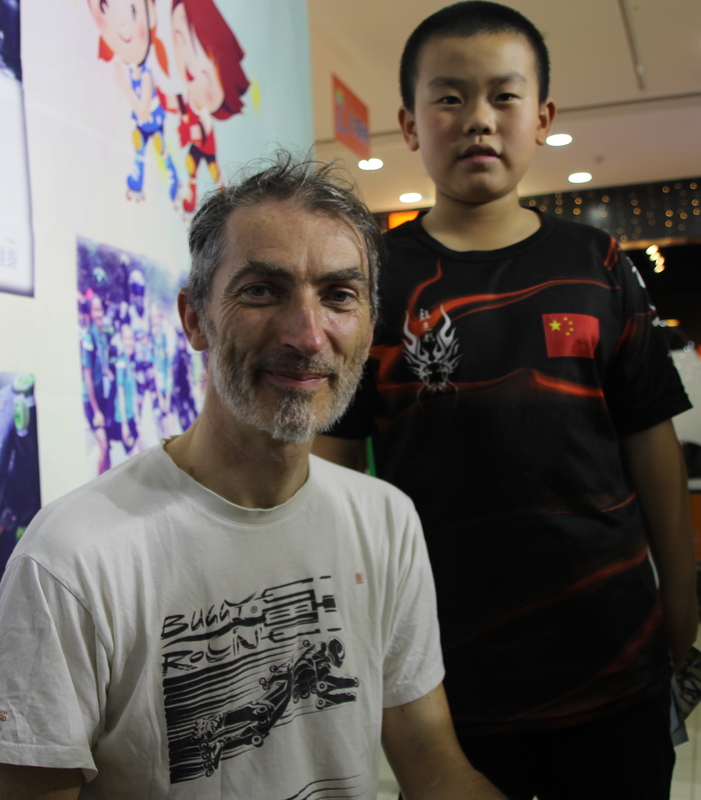 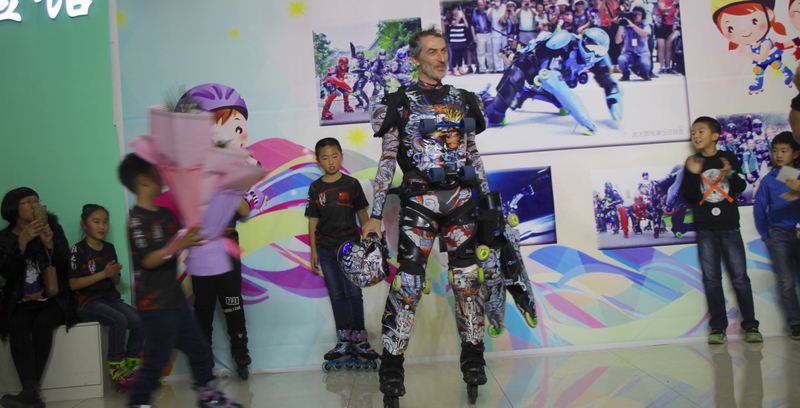 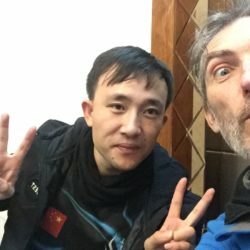 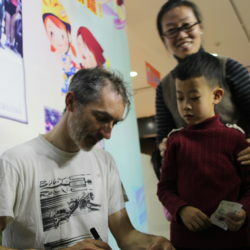 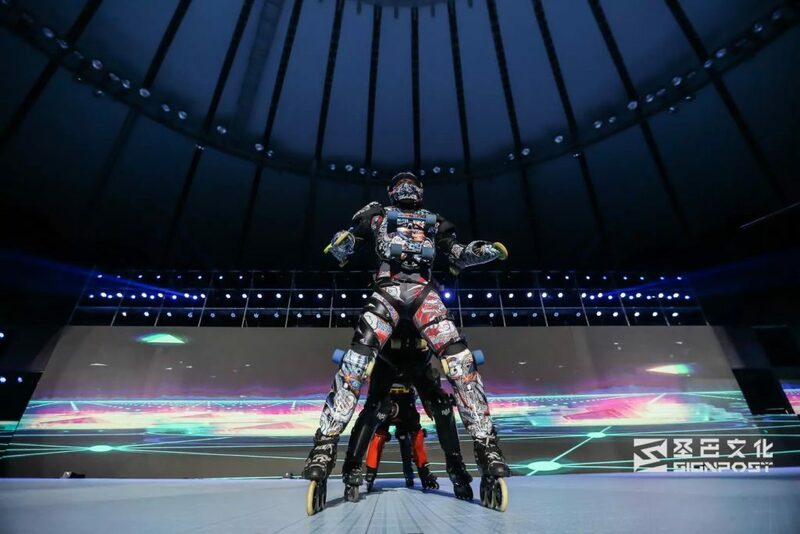 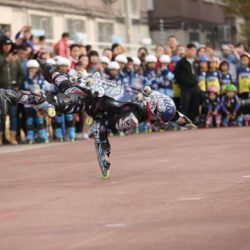 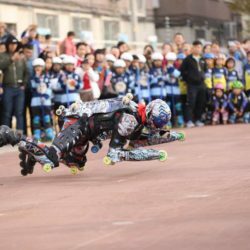 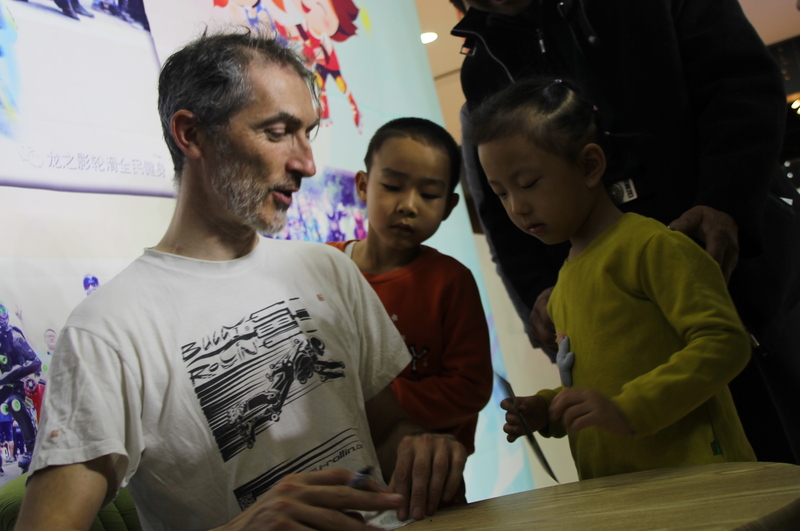 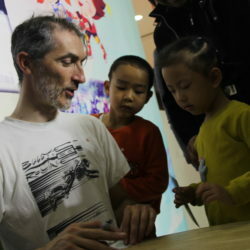 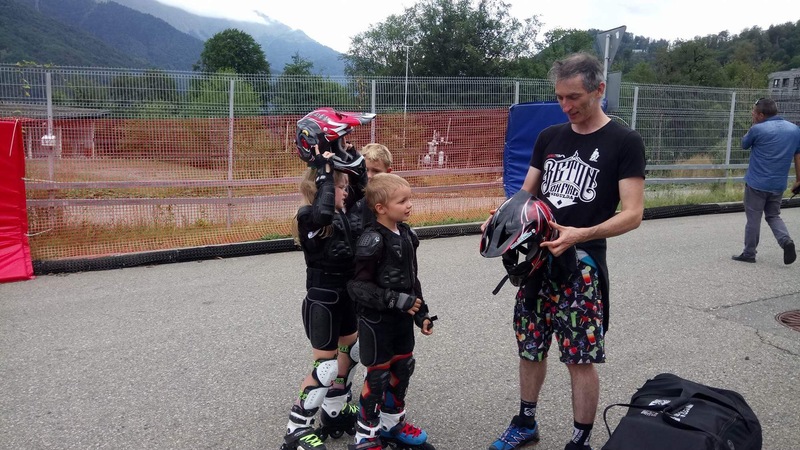 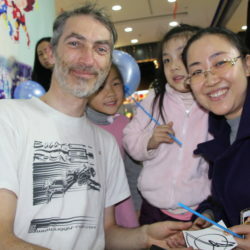 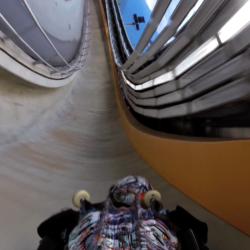 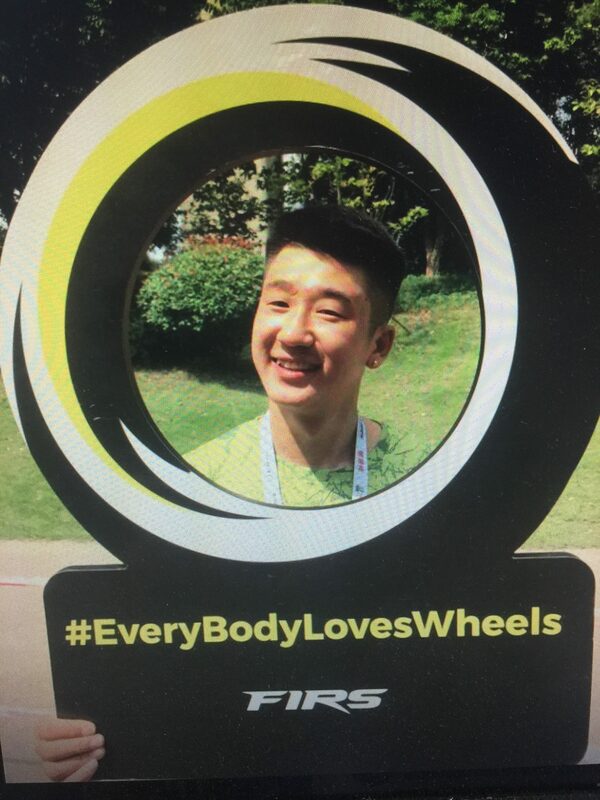 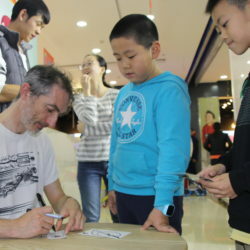 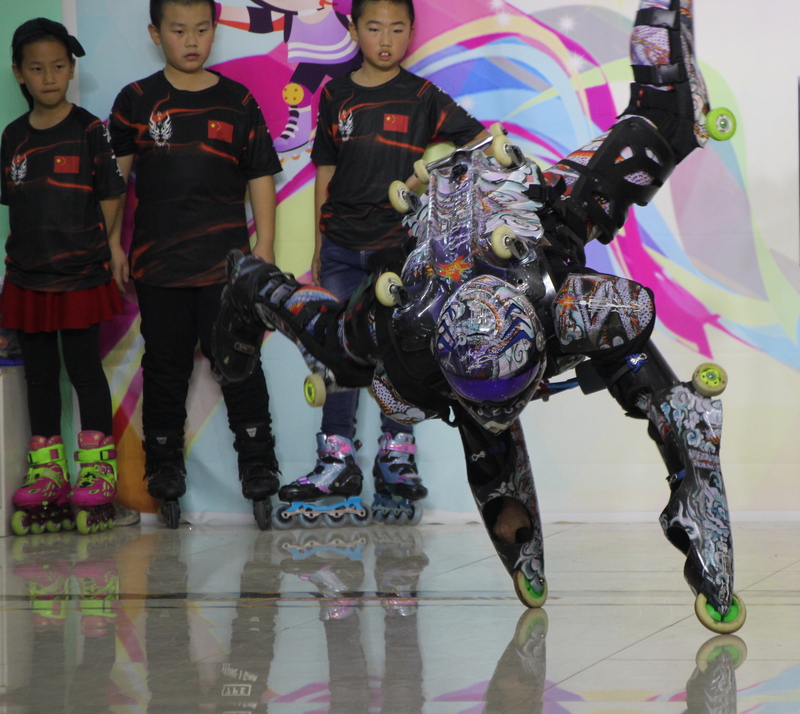 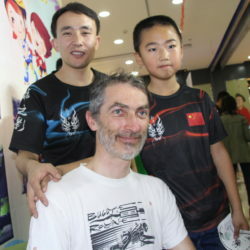 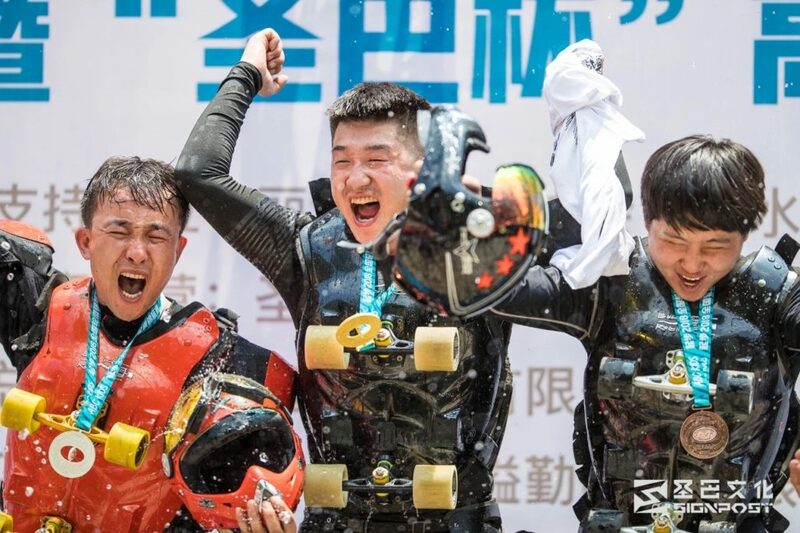 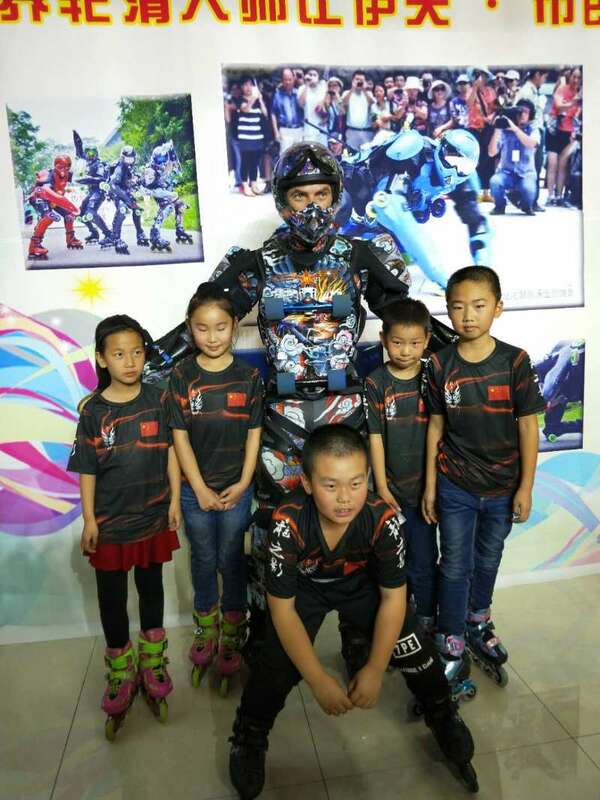 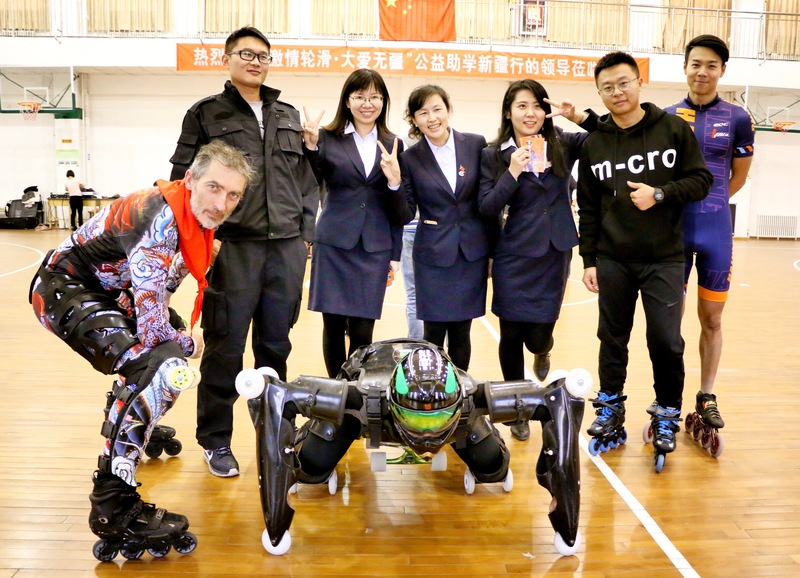 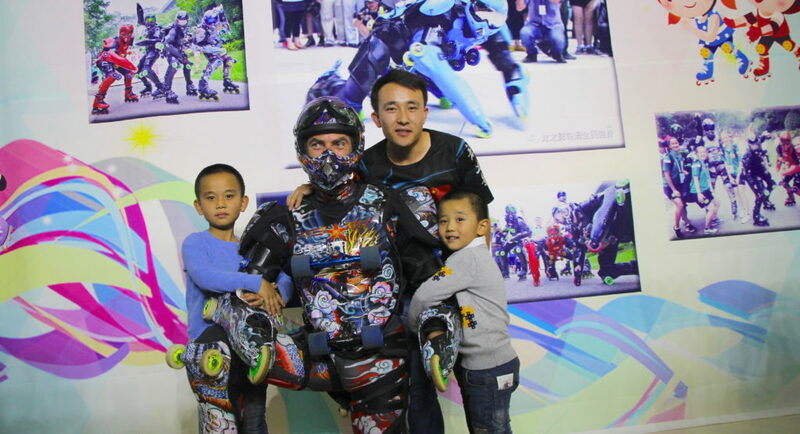 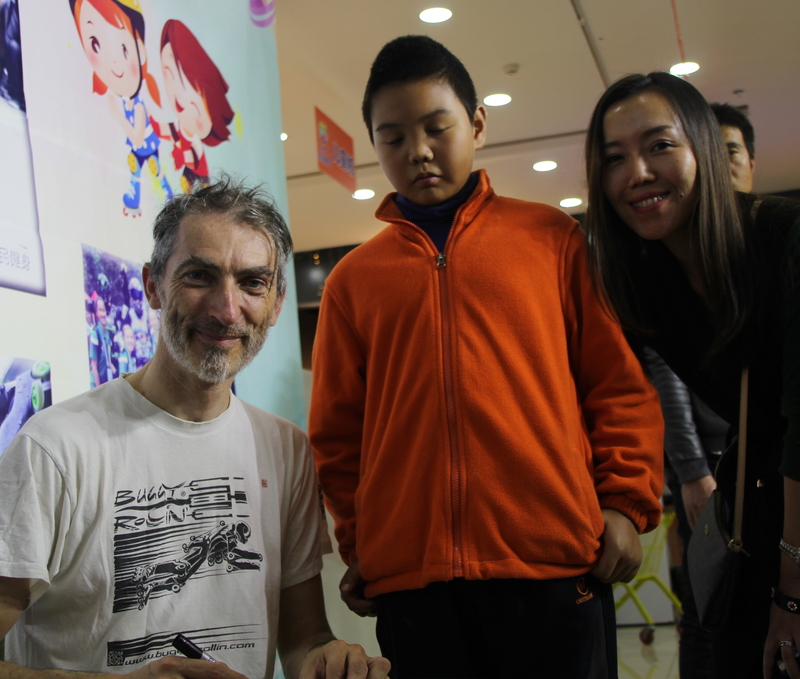 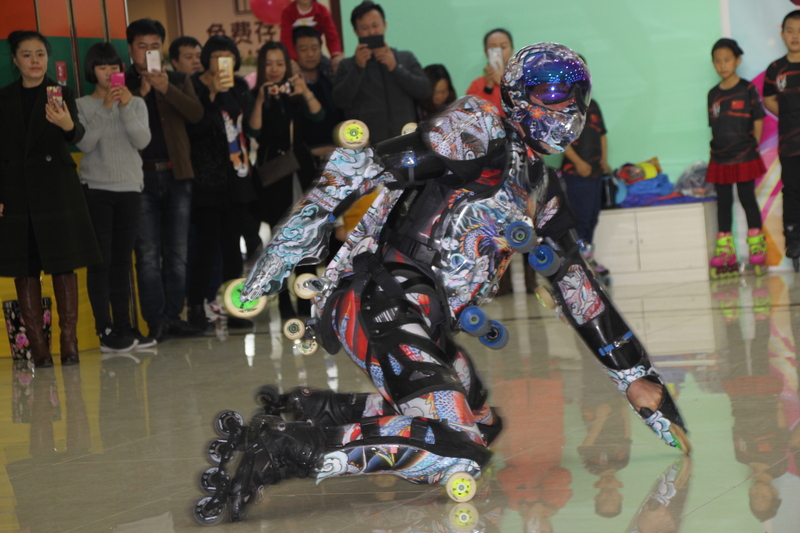 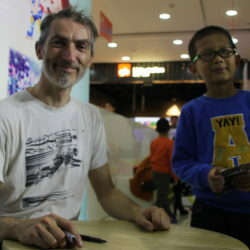 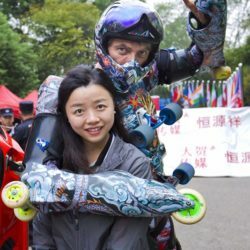 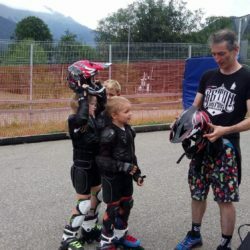 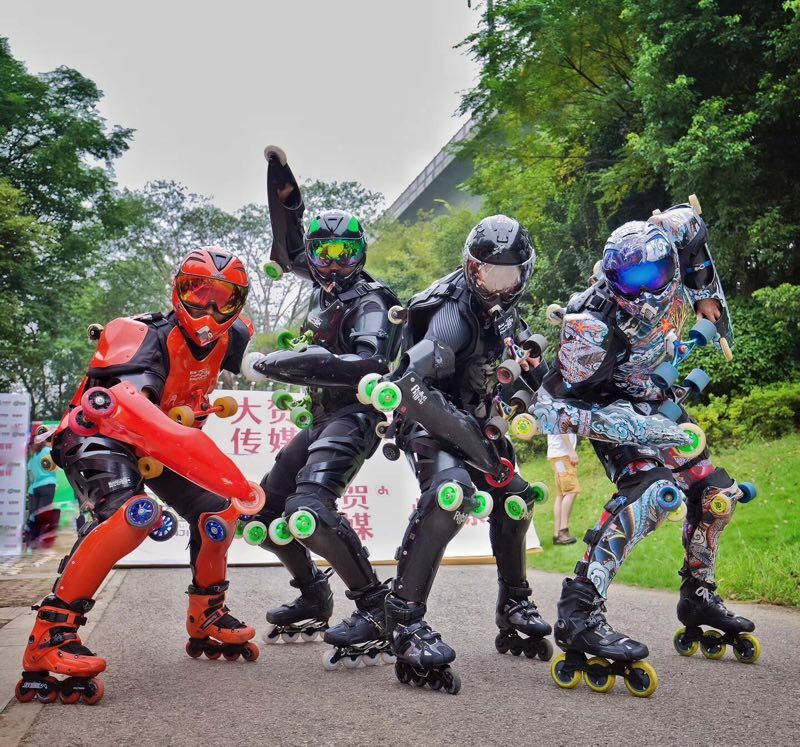 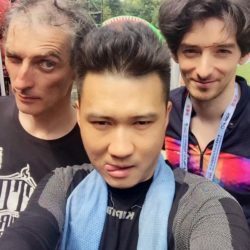 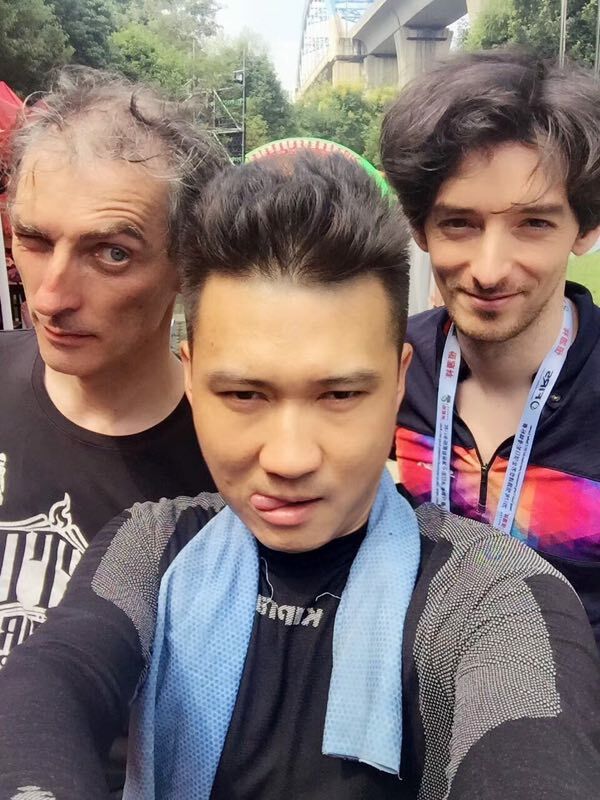 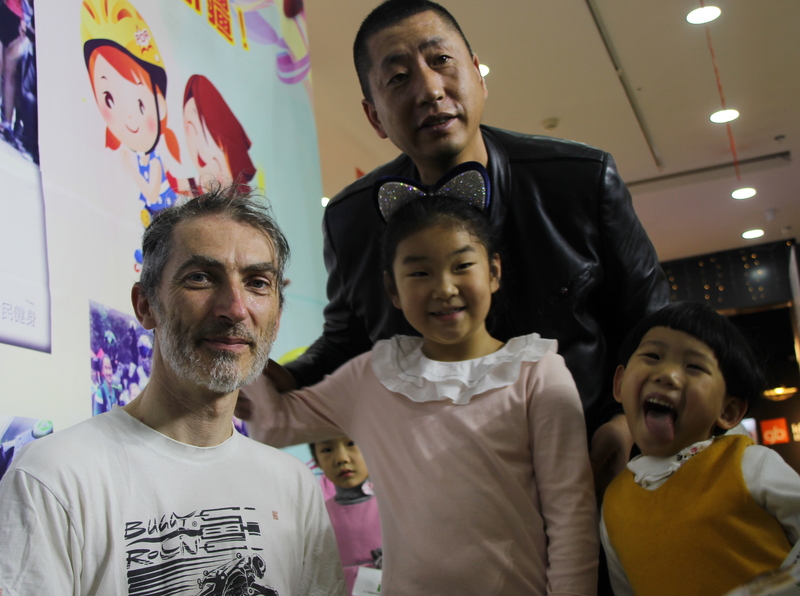 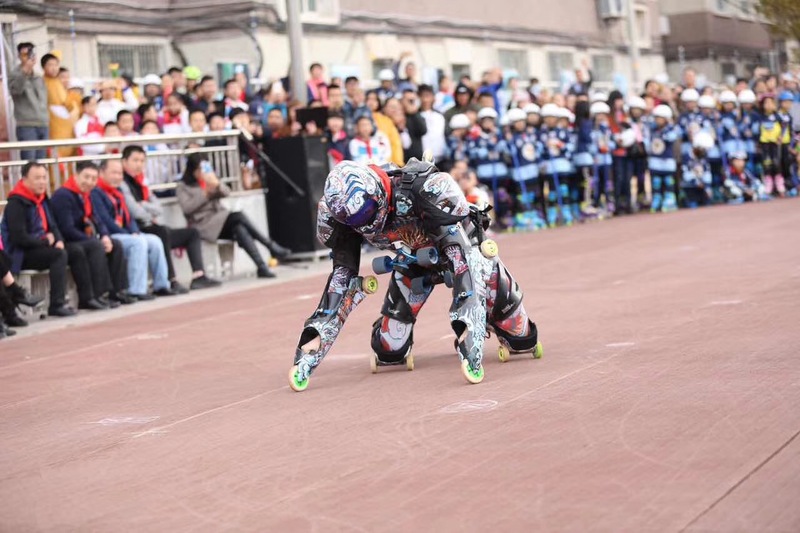 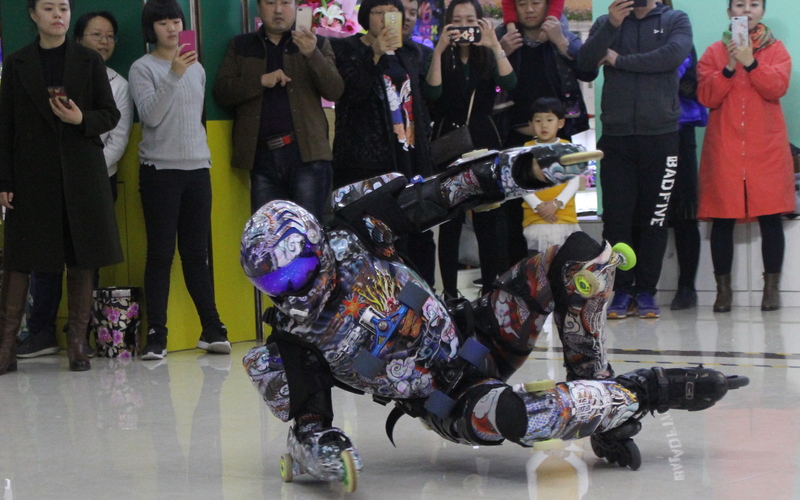 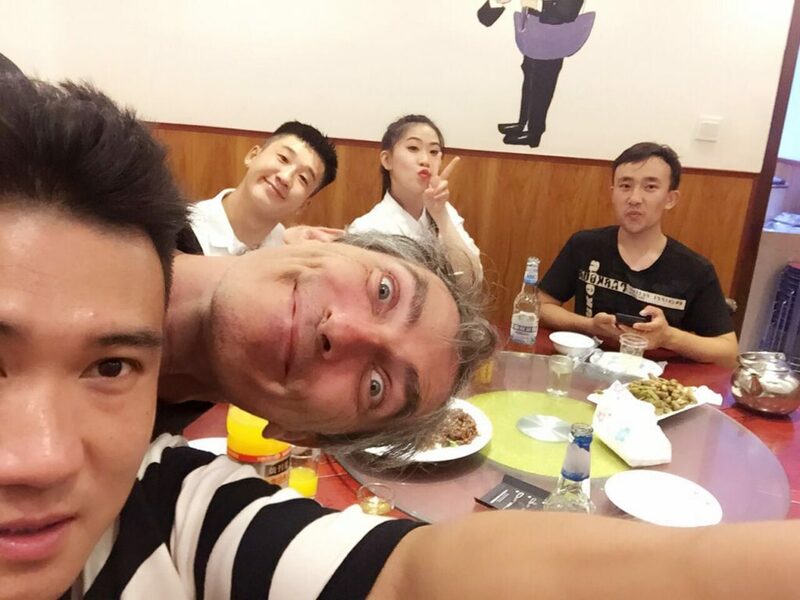 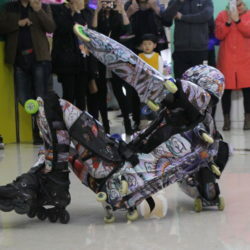 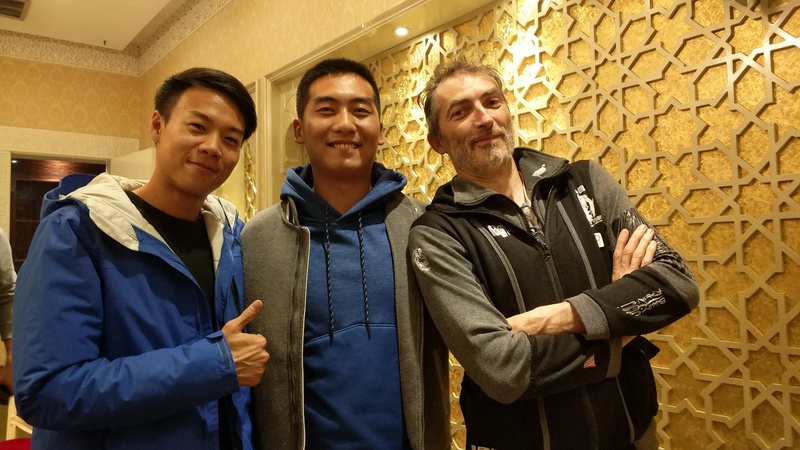 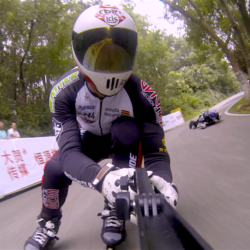 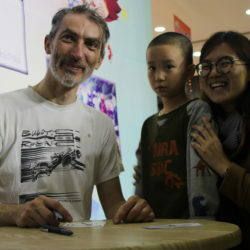 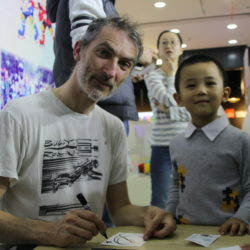 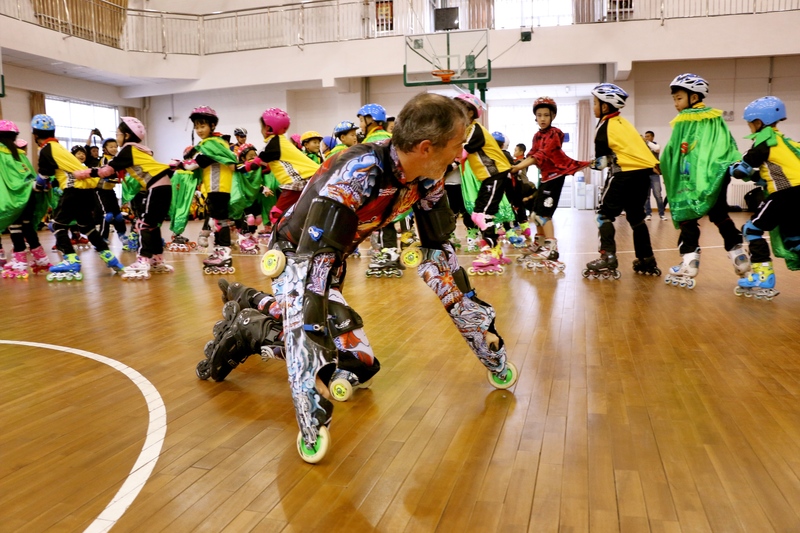 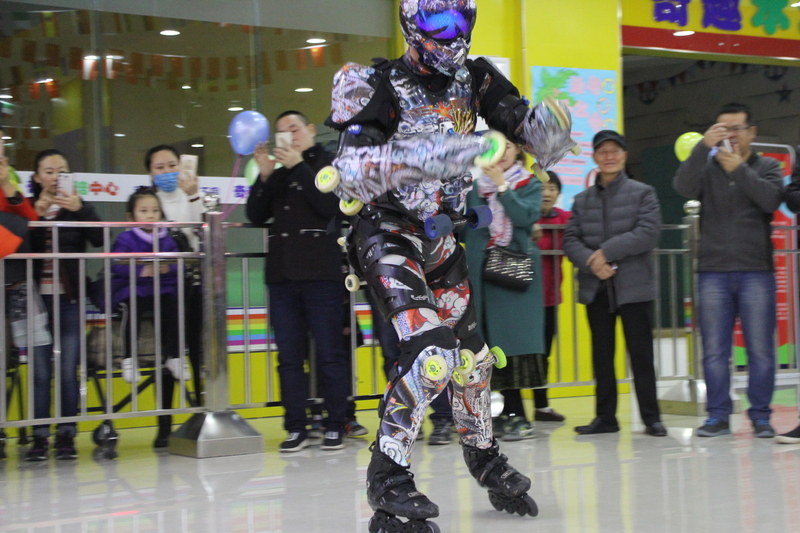 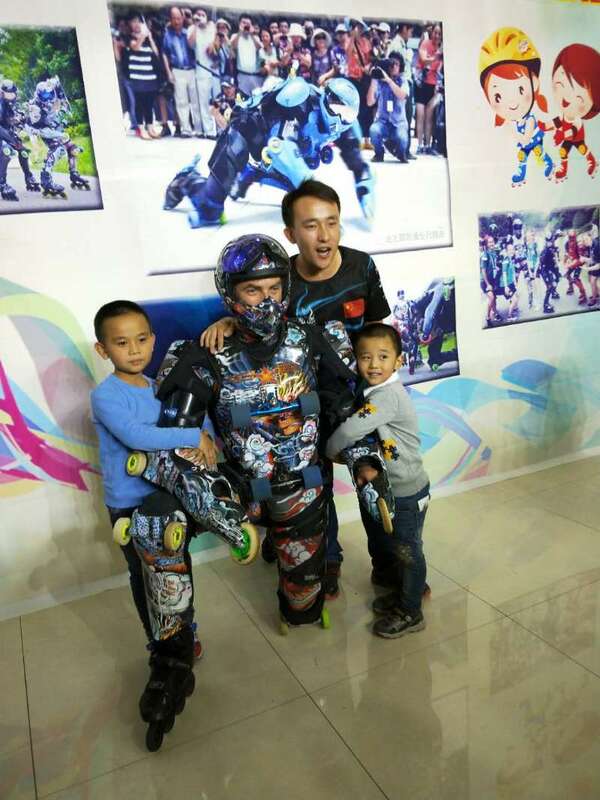 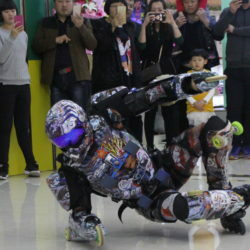 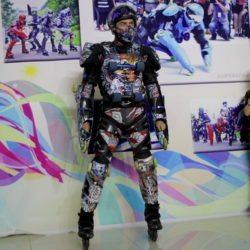 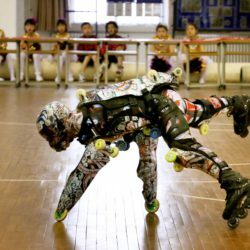 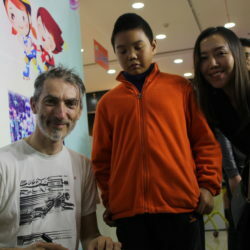 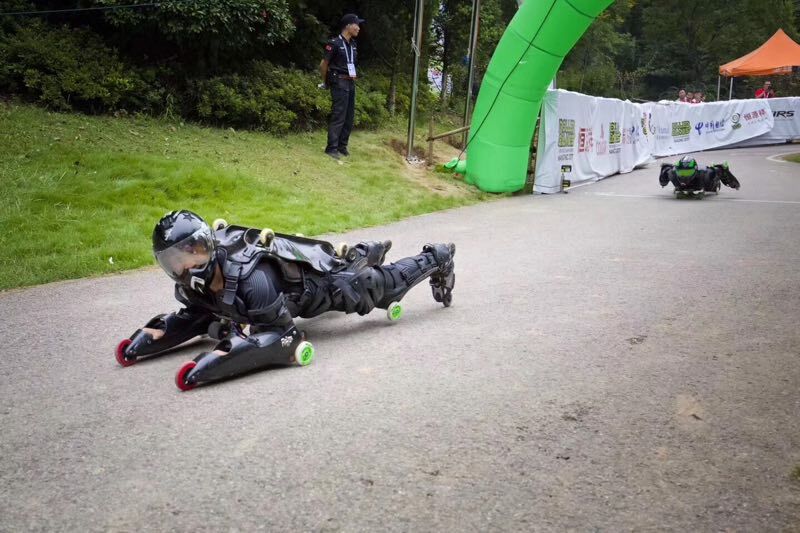 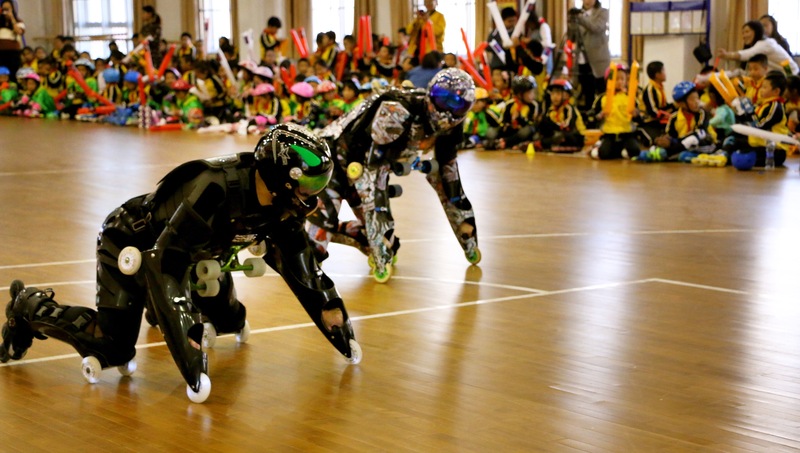 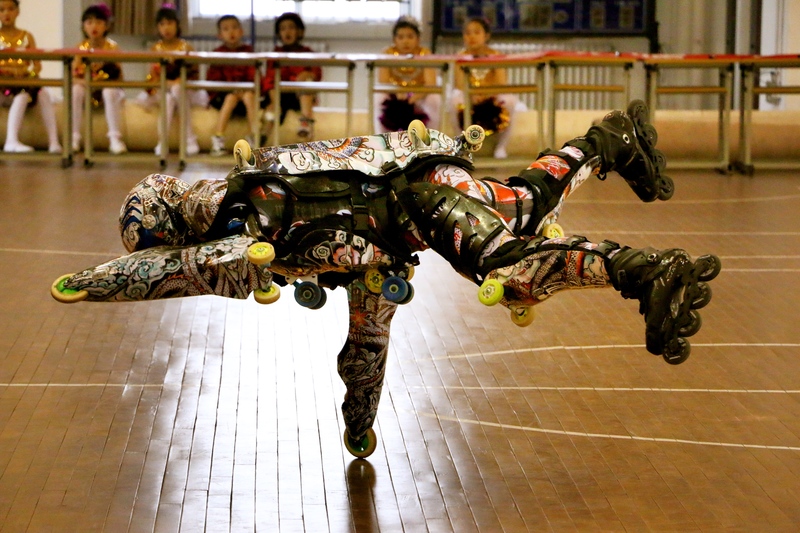 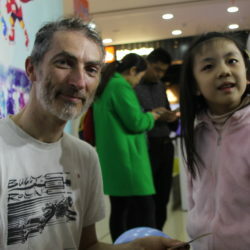 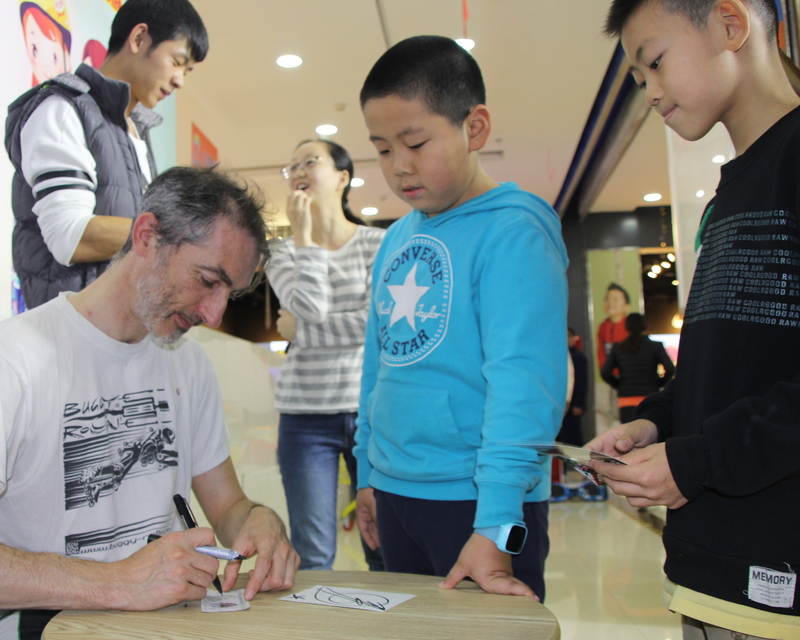 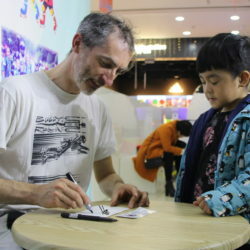 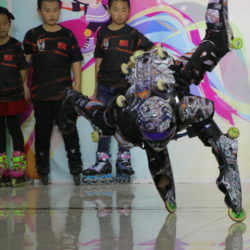 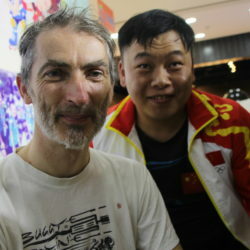 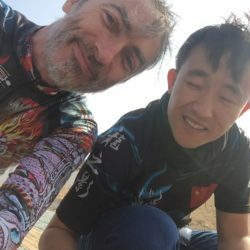 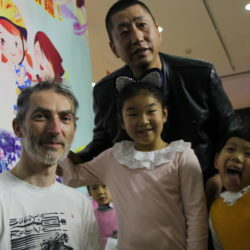 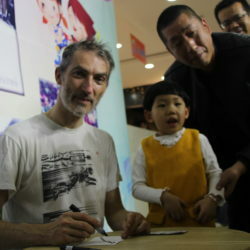 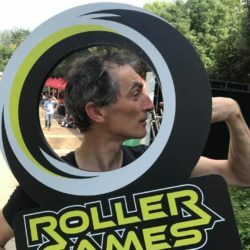 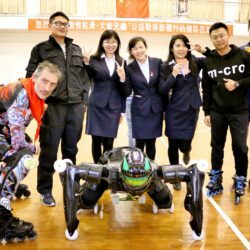 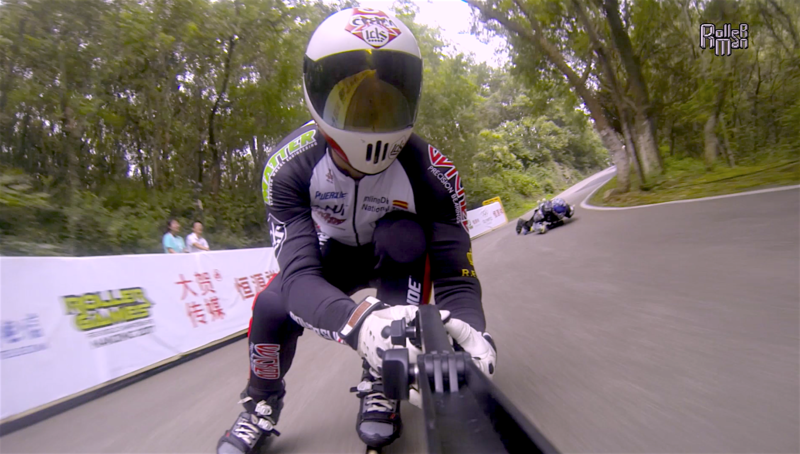 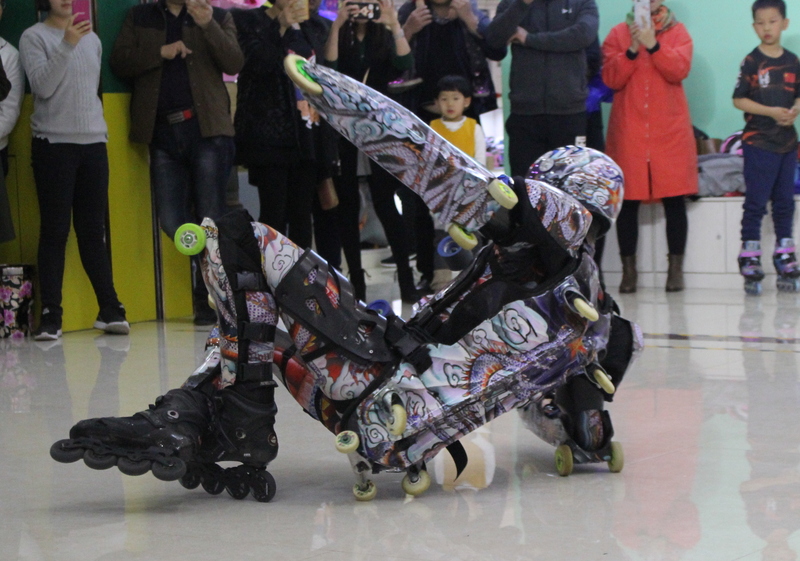 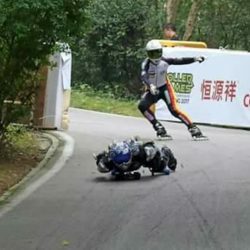 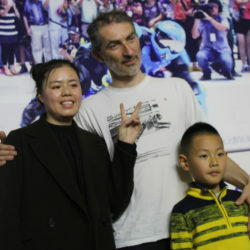 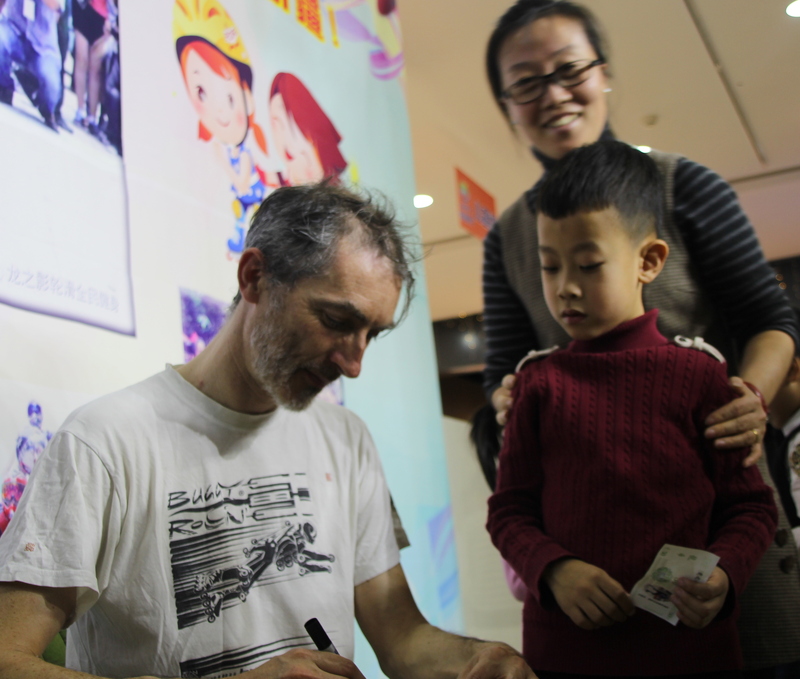 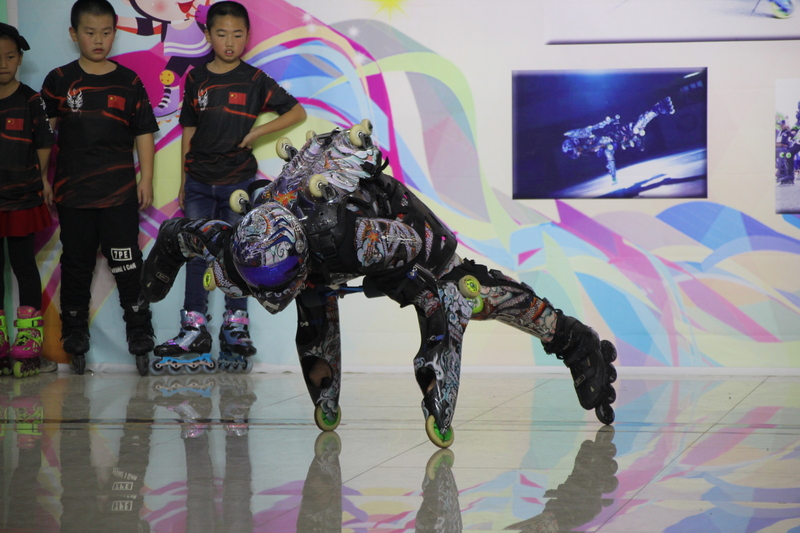 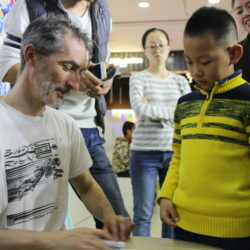 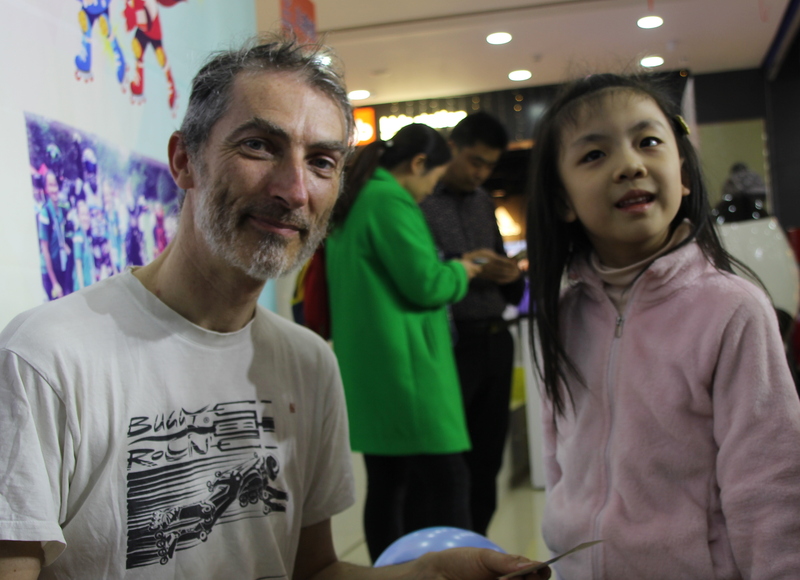 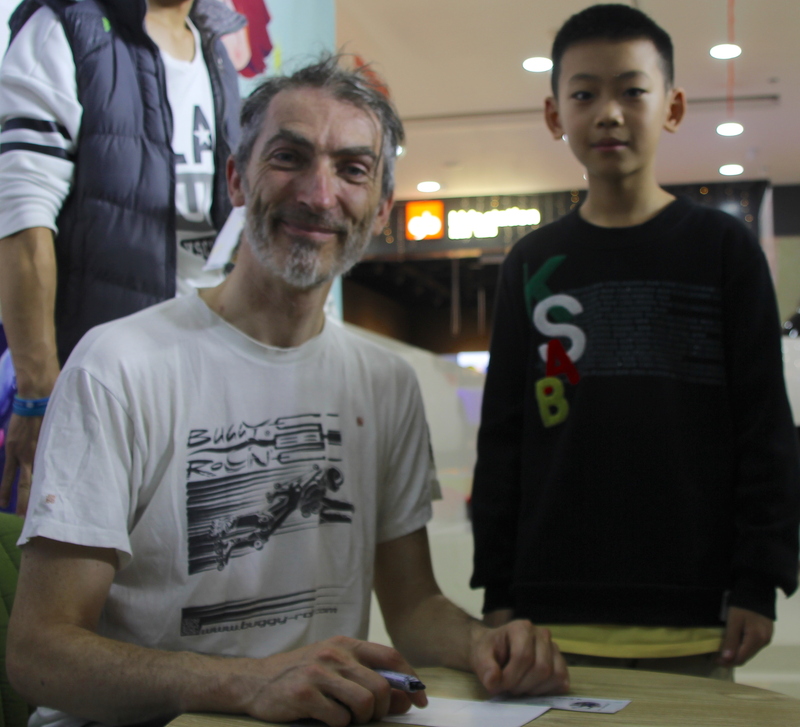 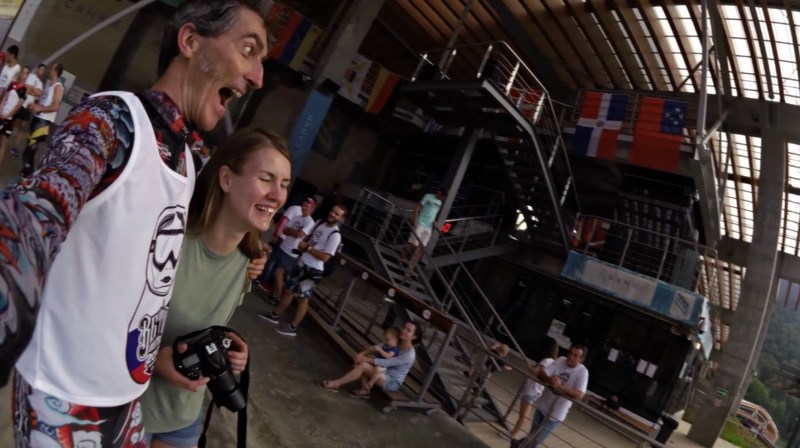 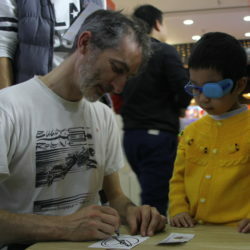 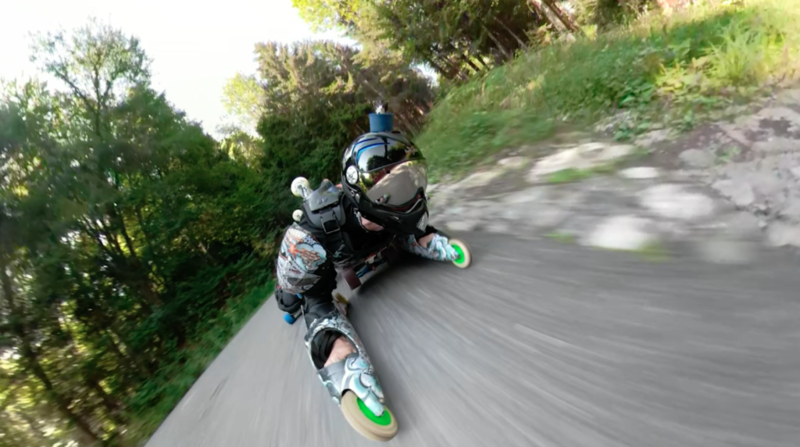 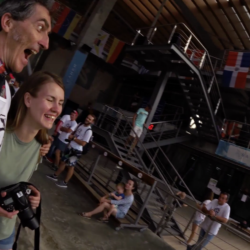 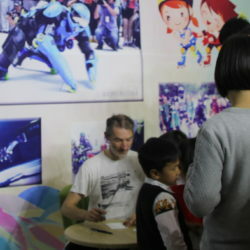 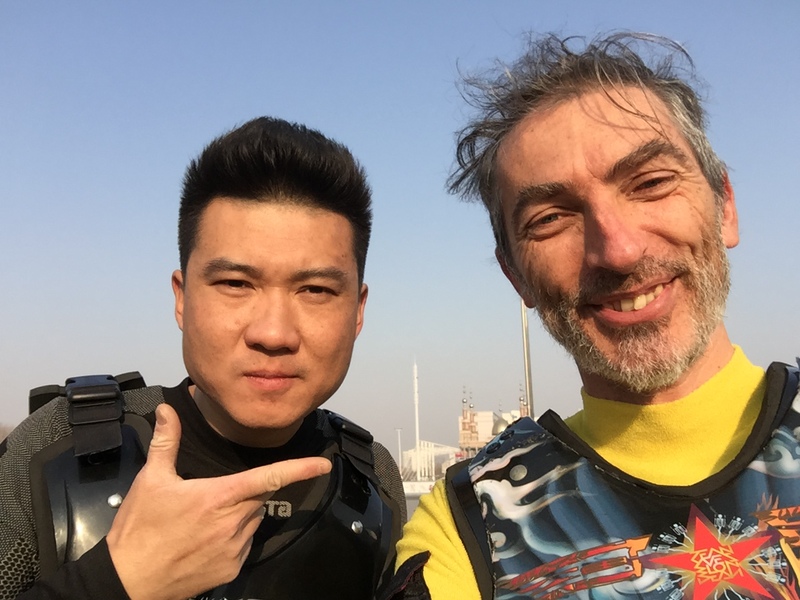 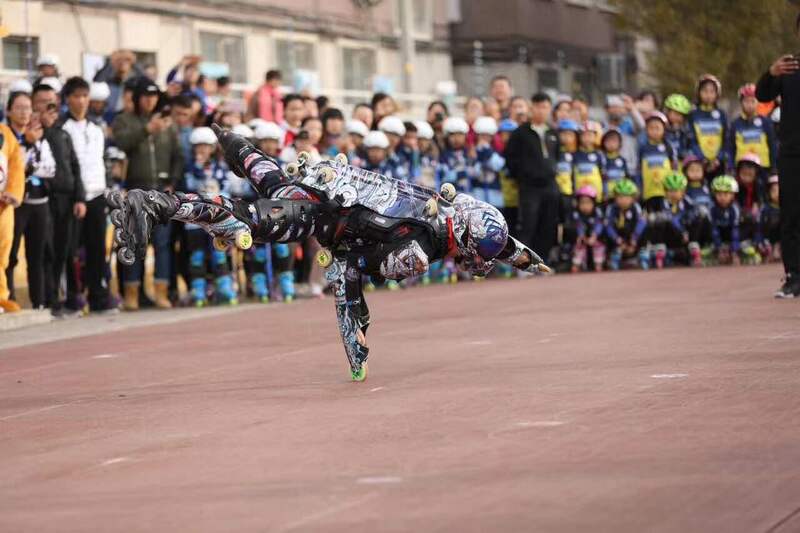 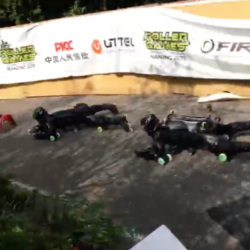 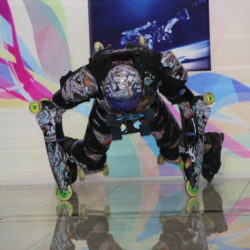 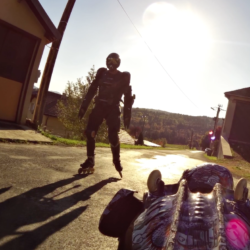 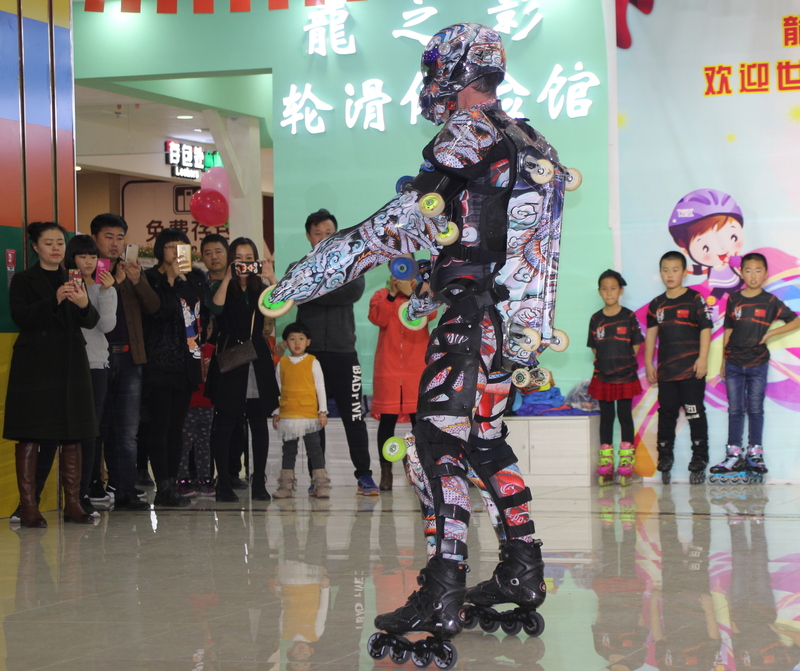 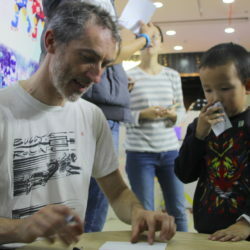 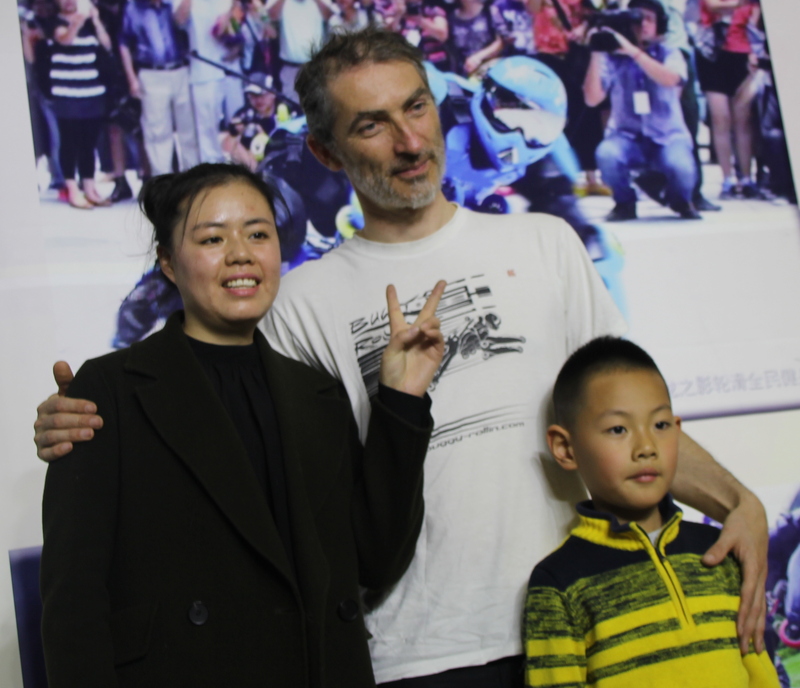 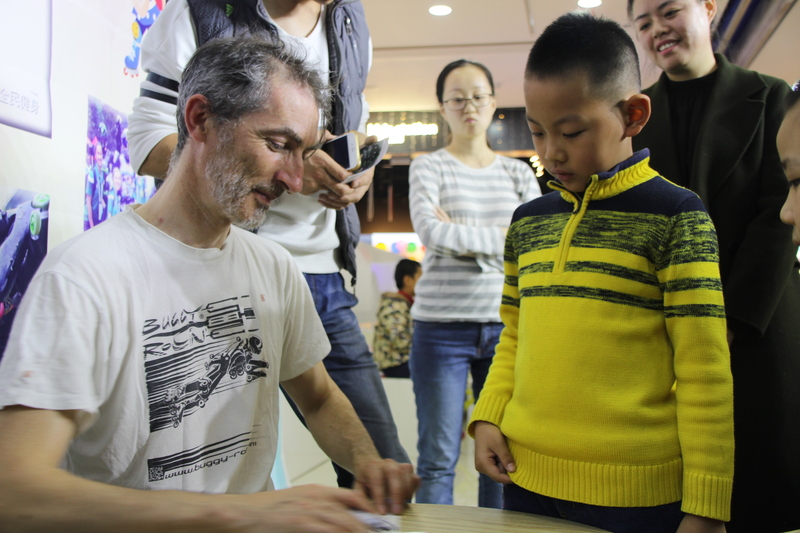 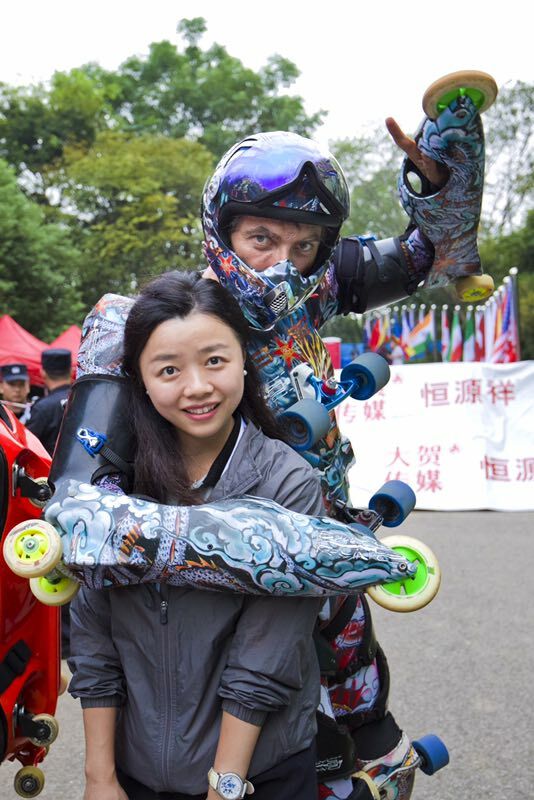 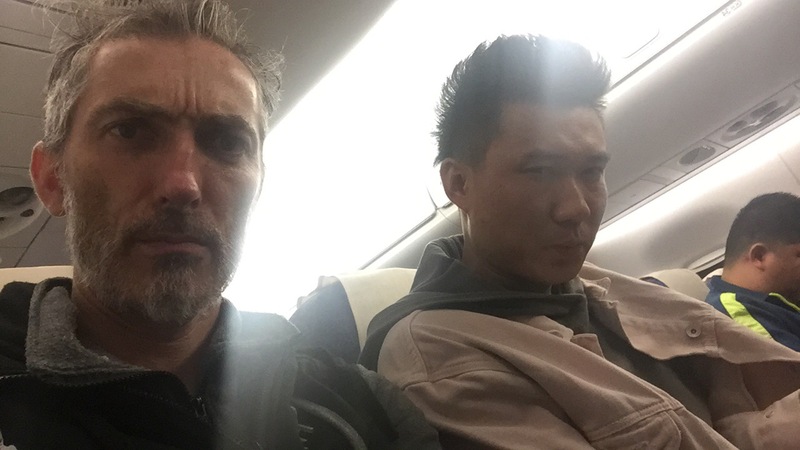 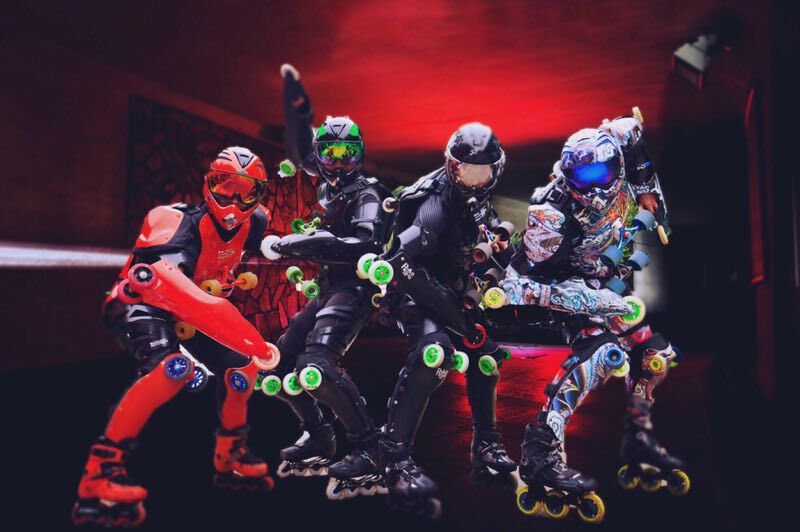 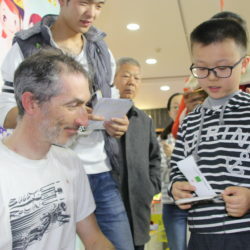 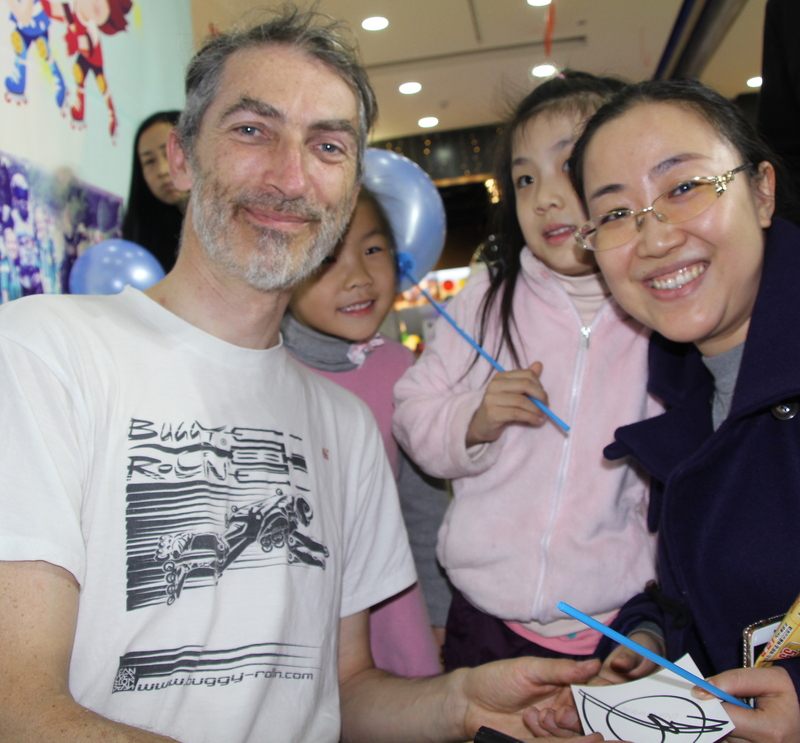 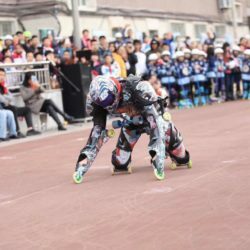 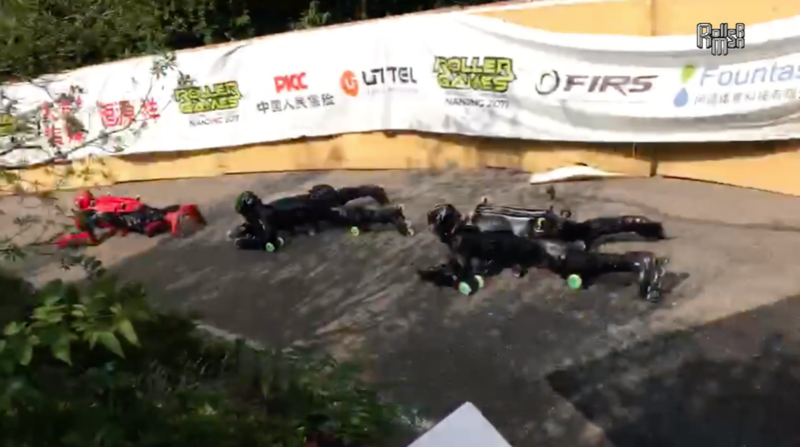 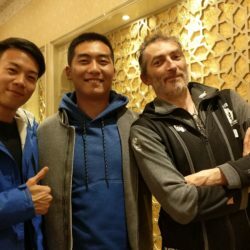 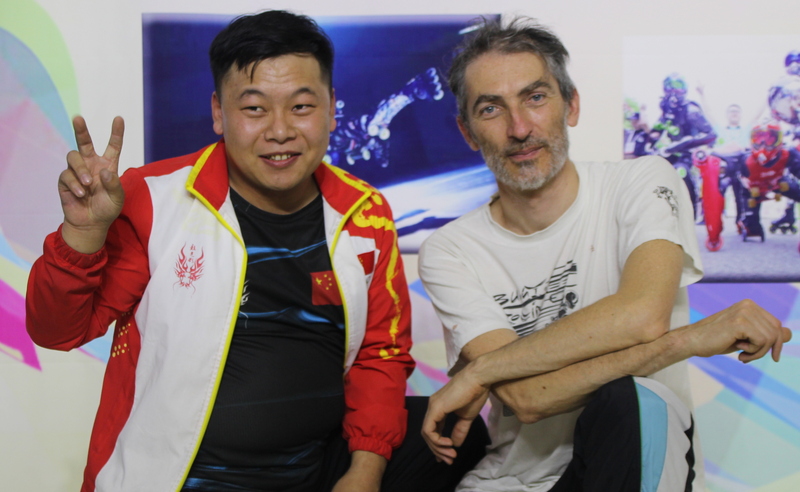 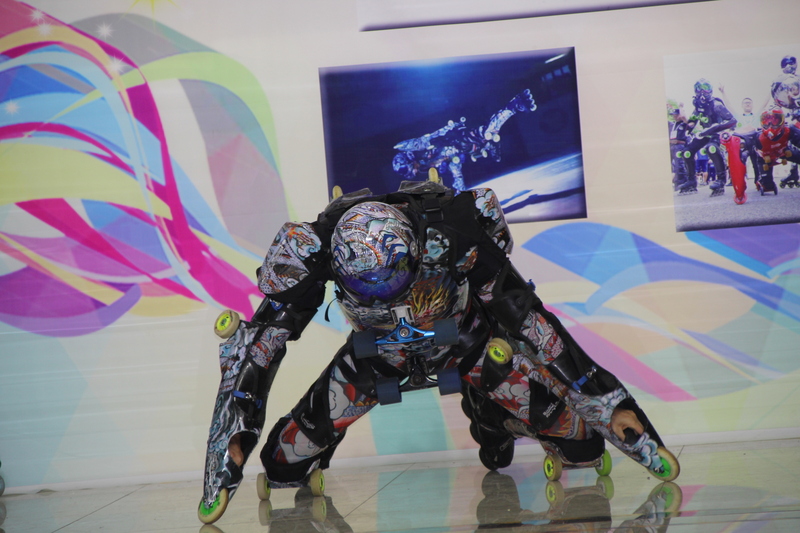 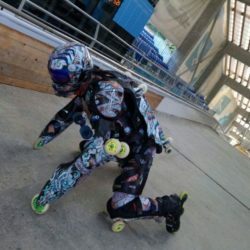 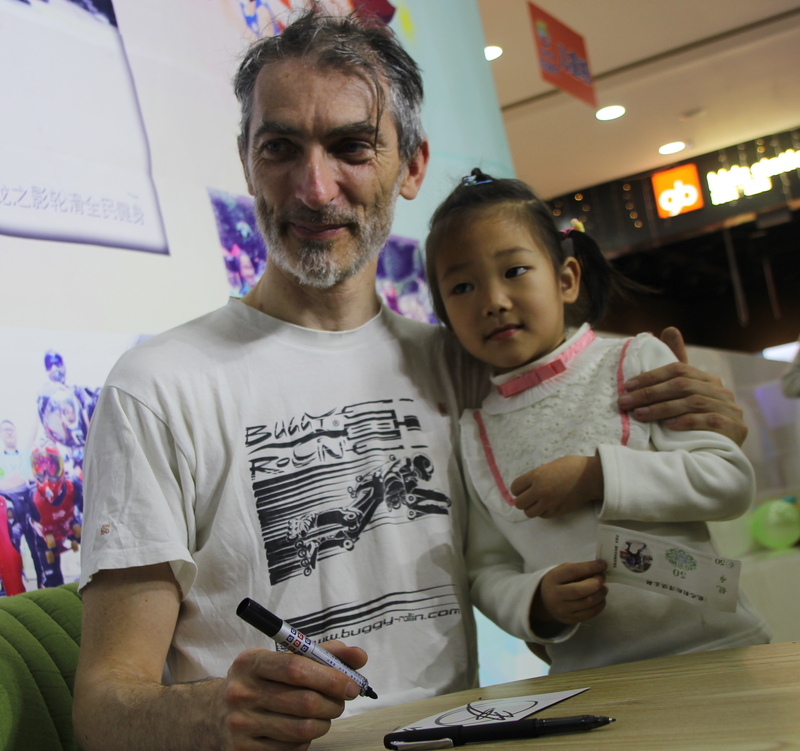 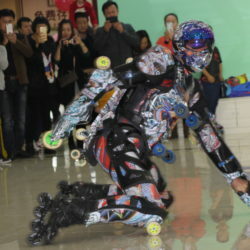 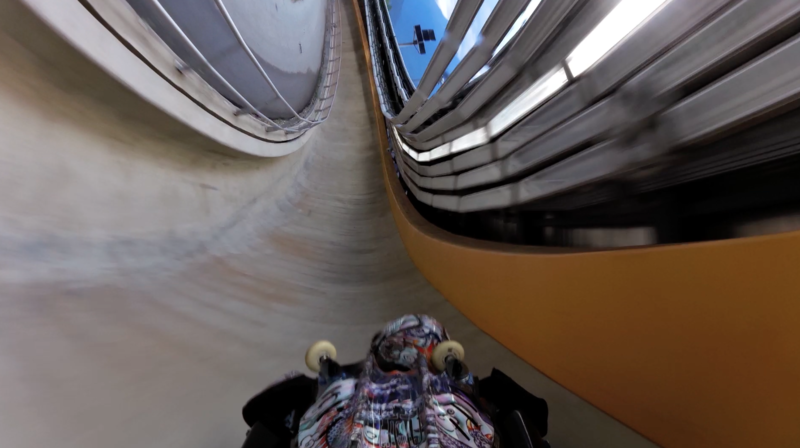 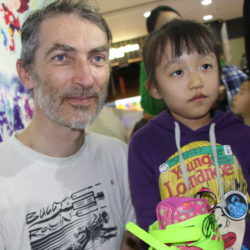 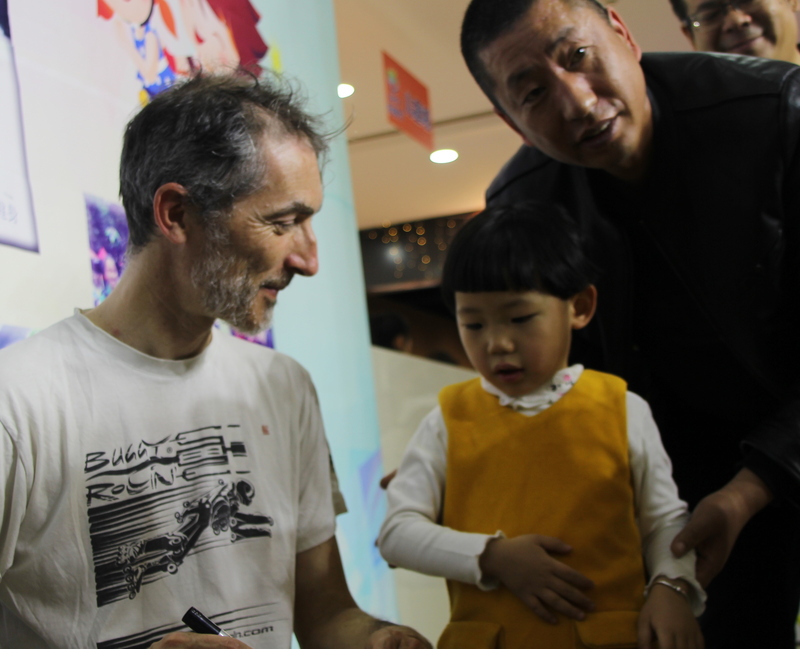 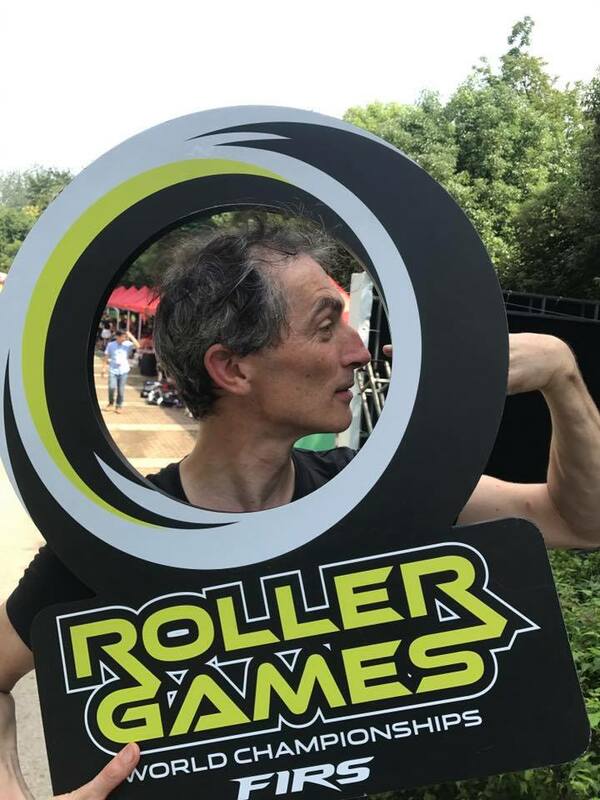 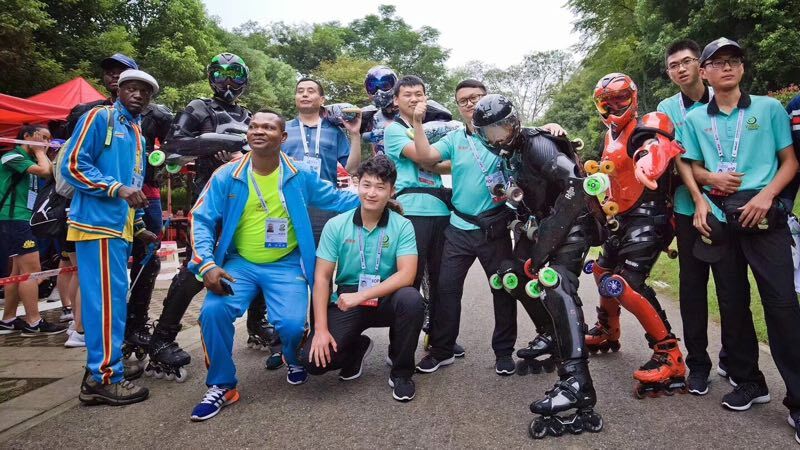 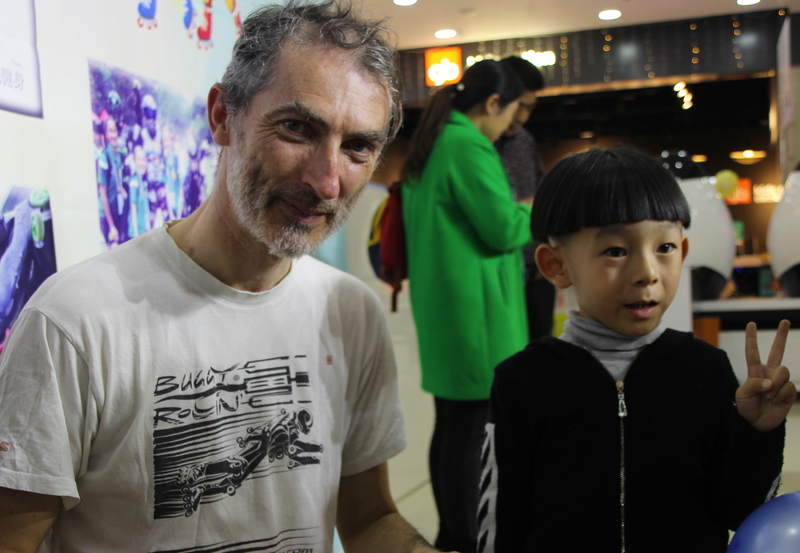 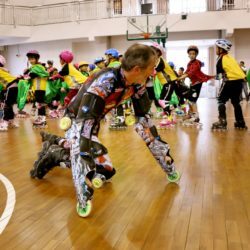 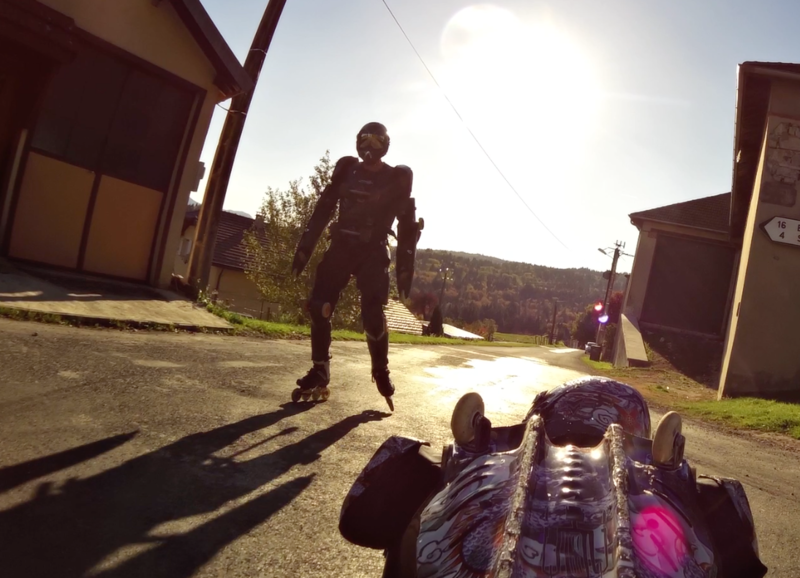 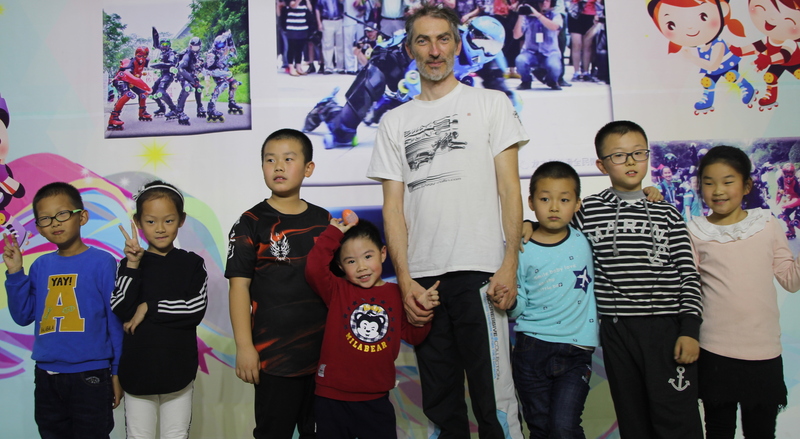 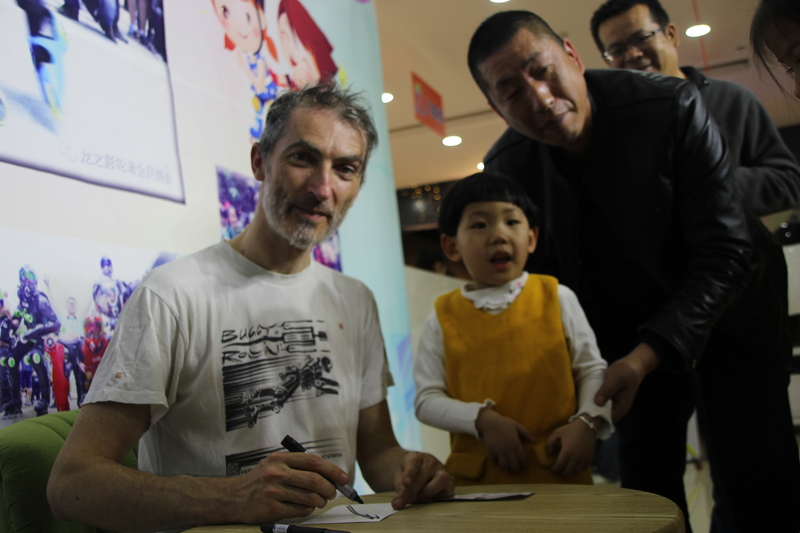 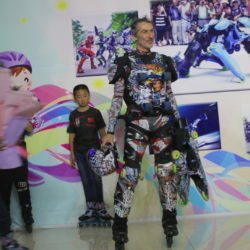 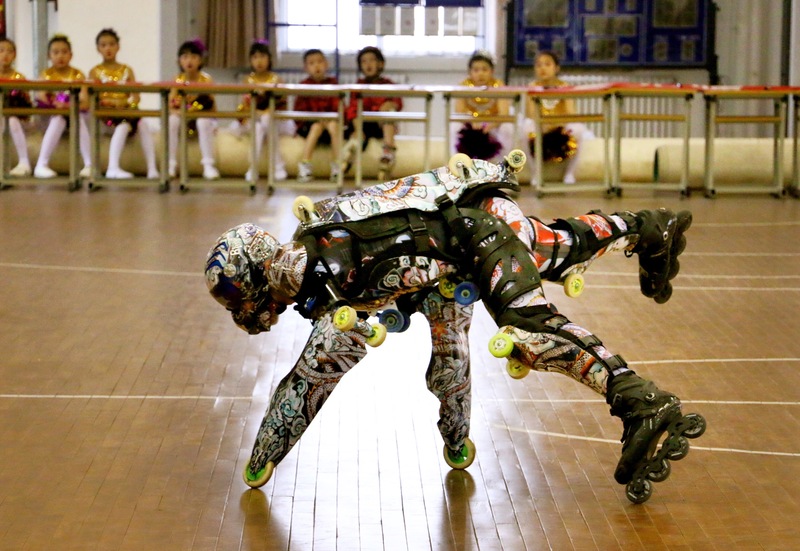 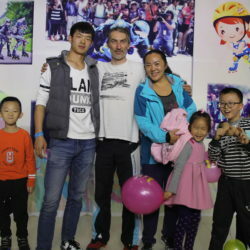 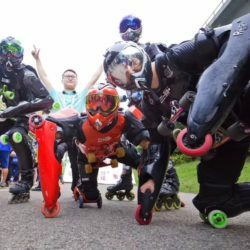 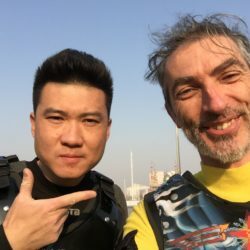 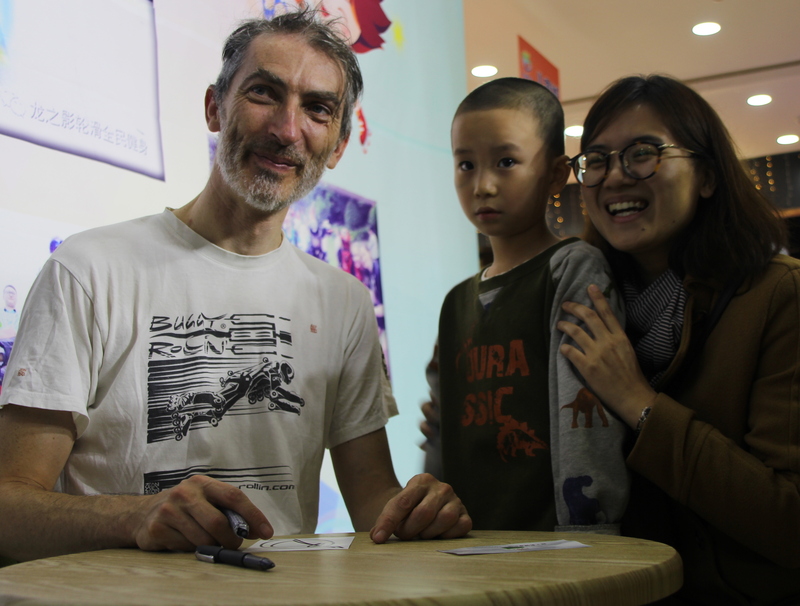 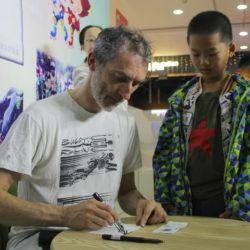 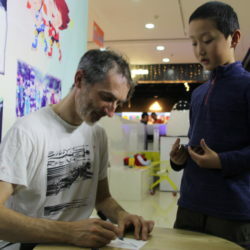 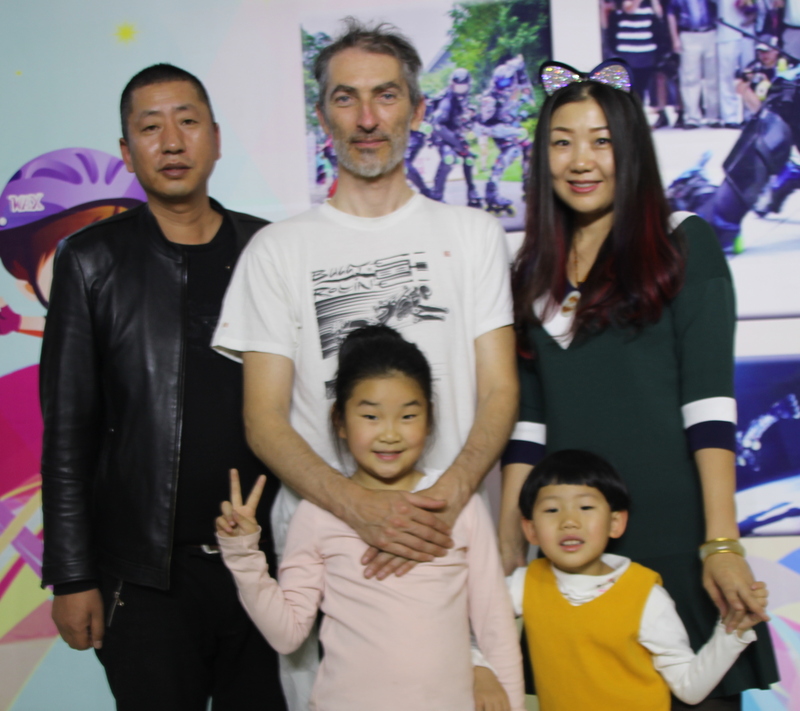 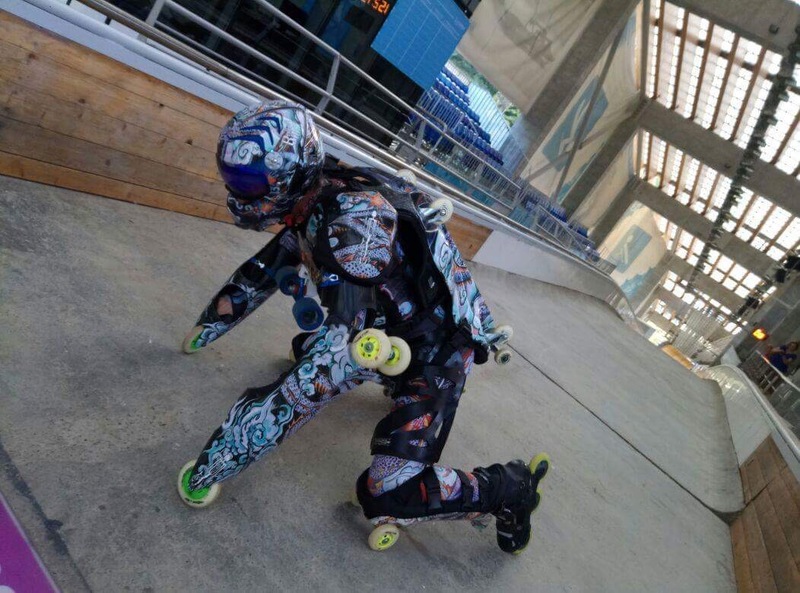 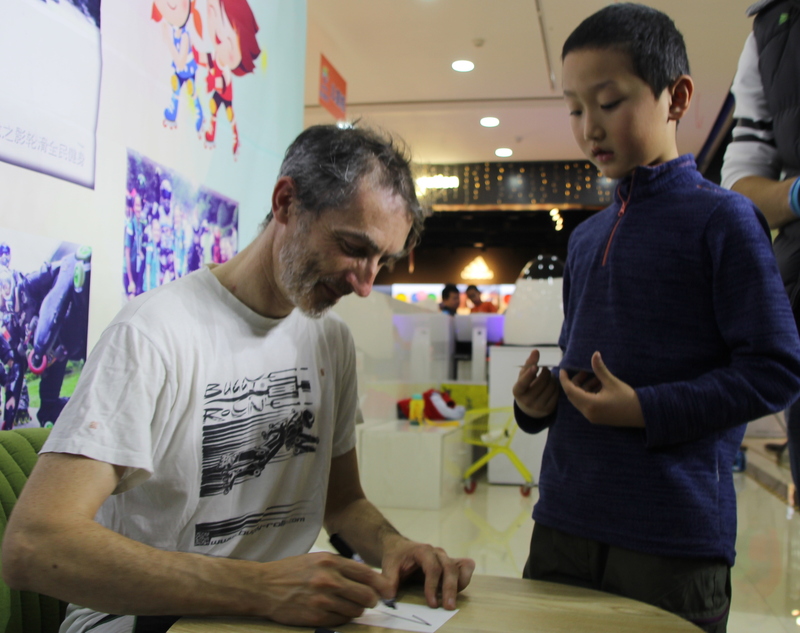 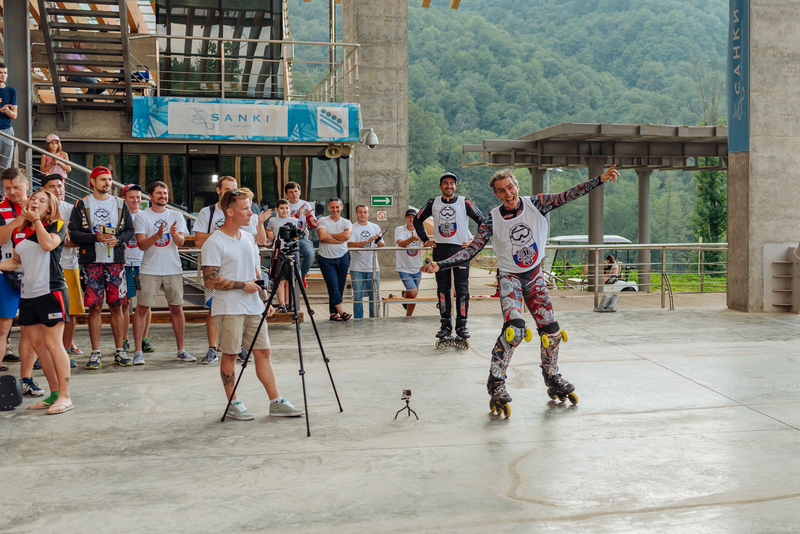 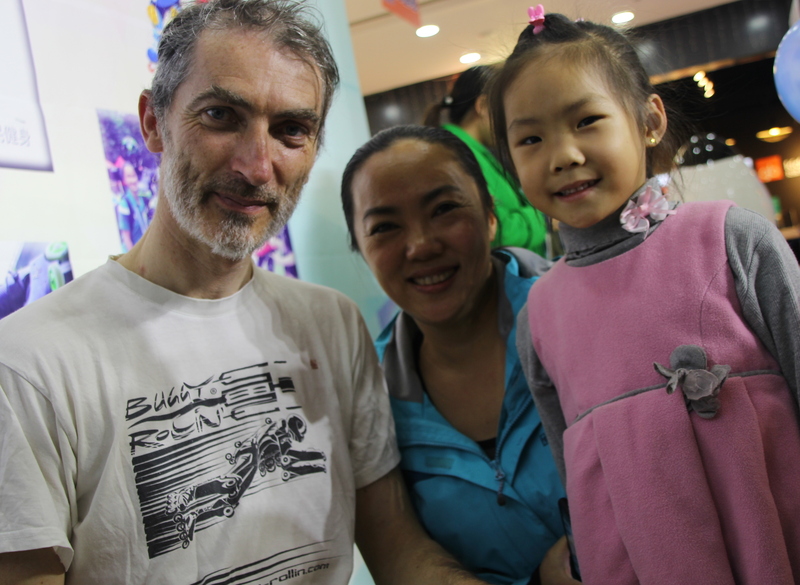 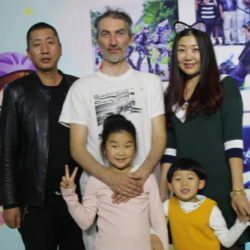 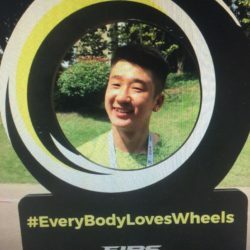 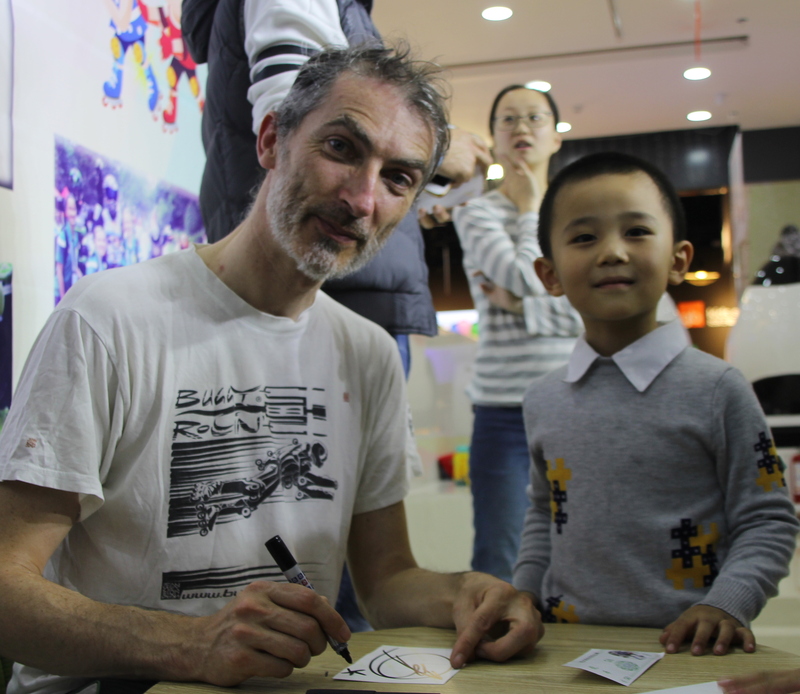 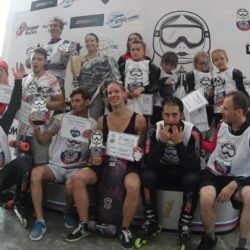 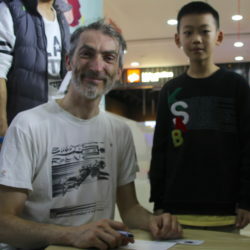 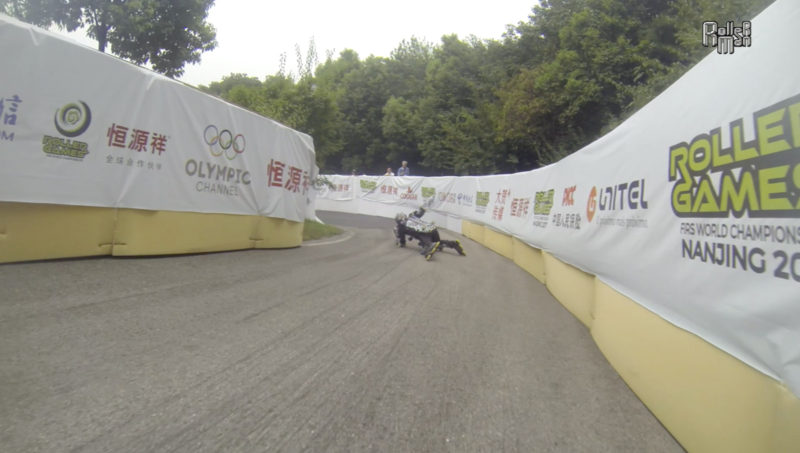 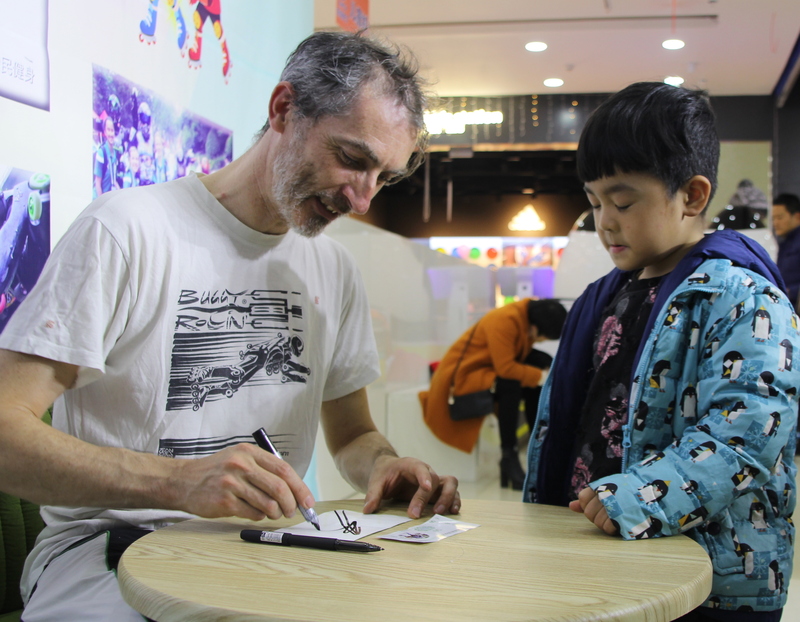 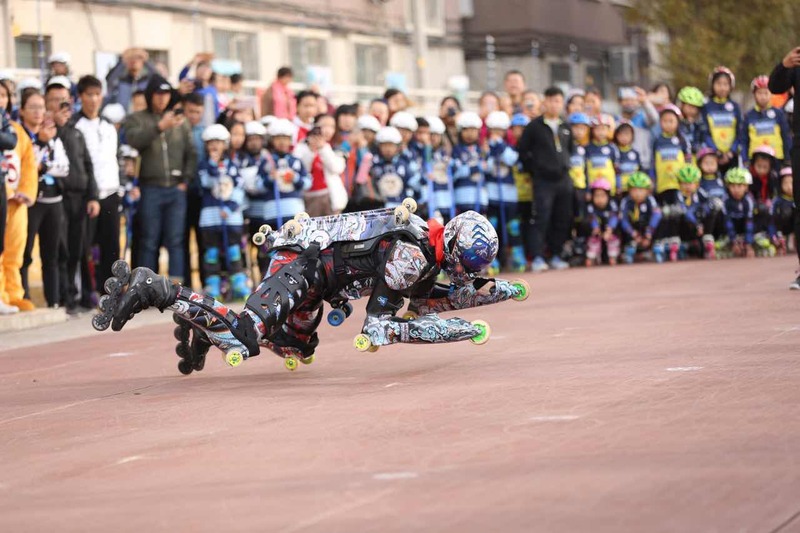 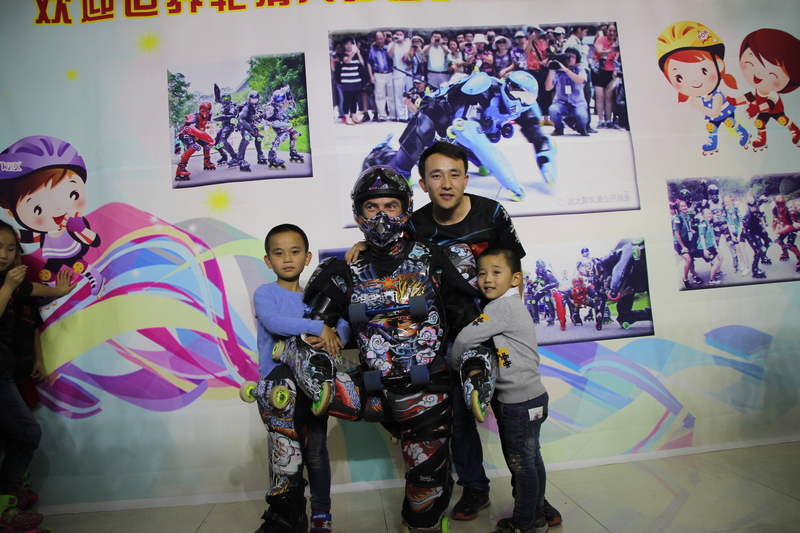 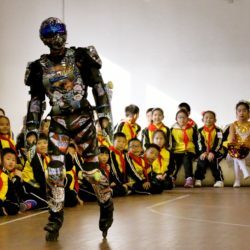 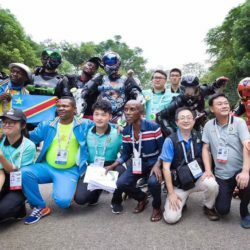 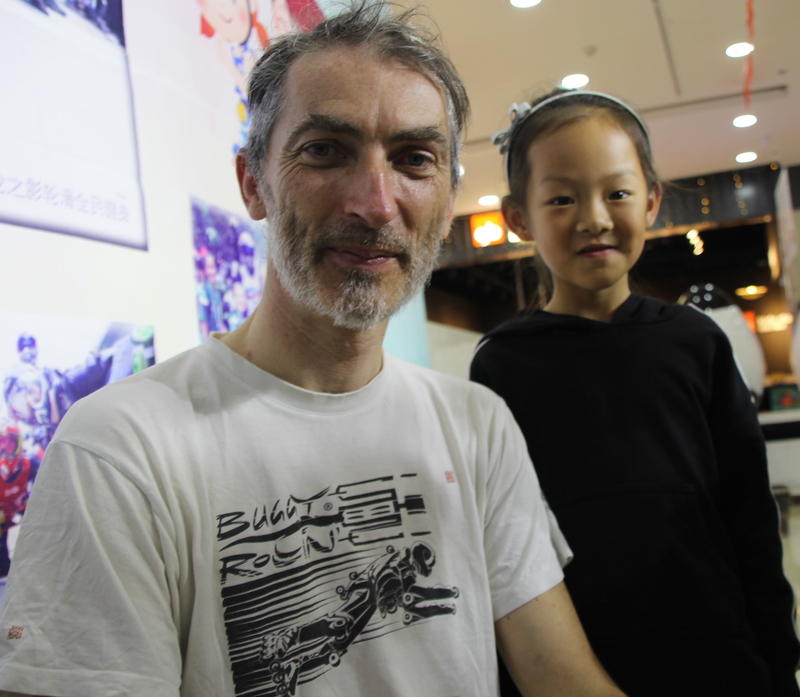 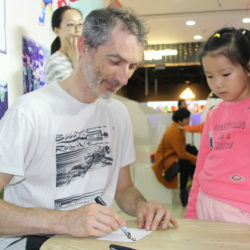 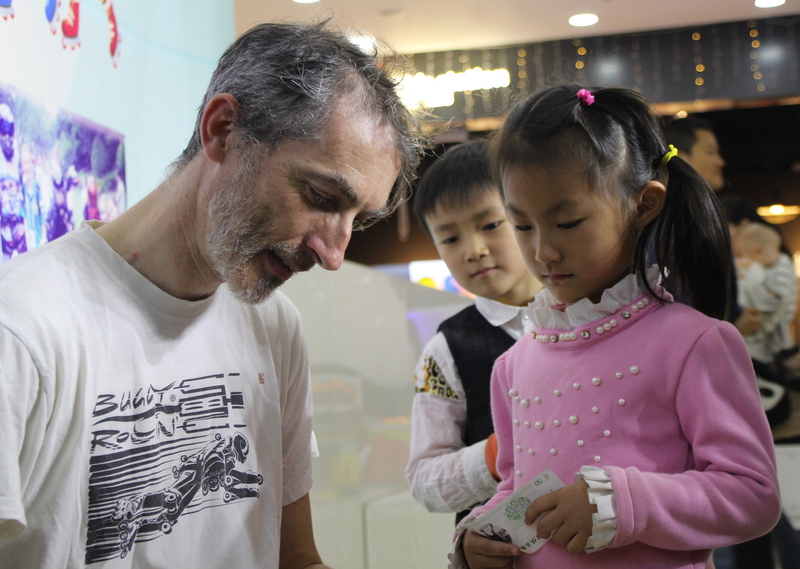 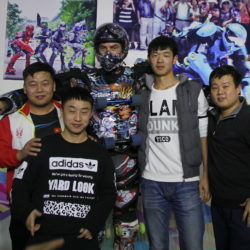 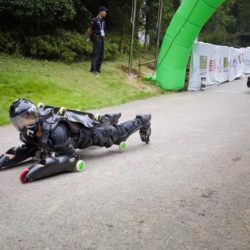 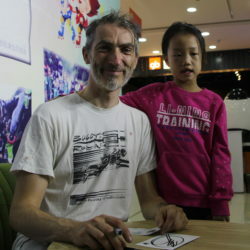 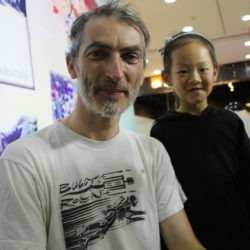 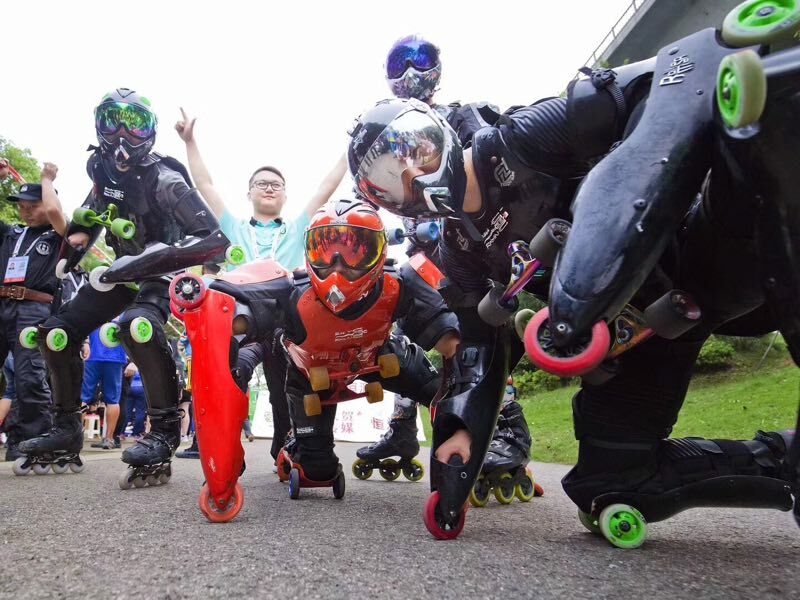 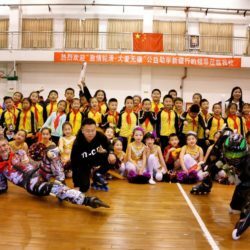 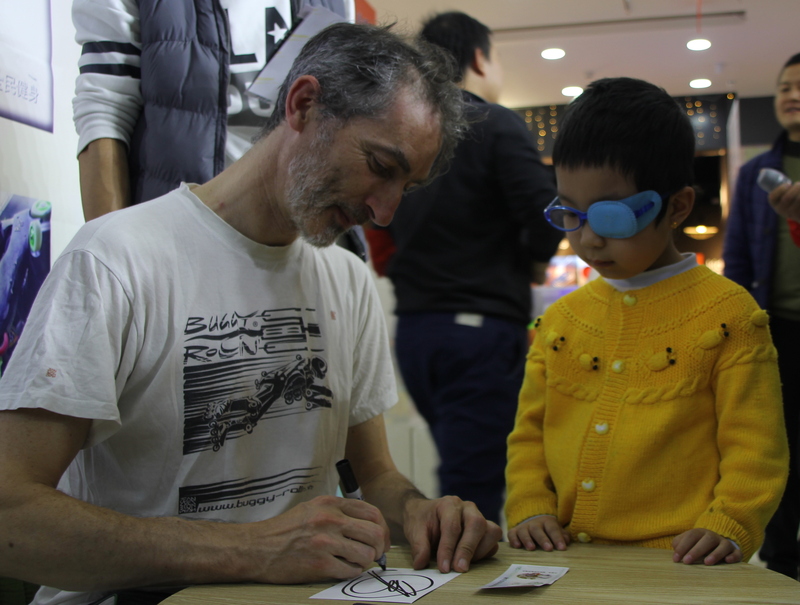 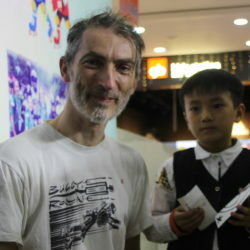 Jean Yves Blondeau, Freezy, Xiao Long, Chang Yue, decided to join together in order to demonstrate the existence of BUGGY ROLLIN as Roller Sport. 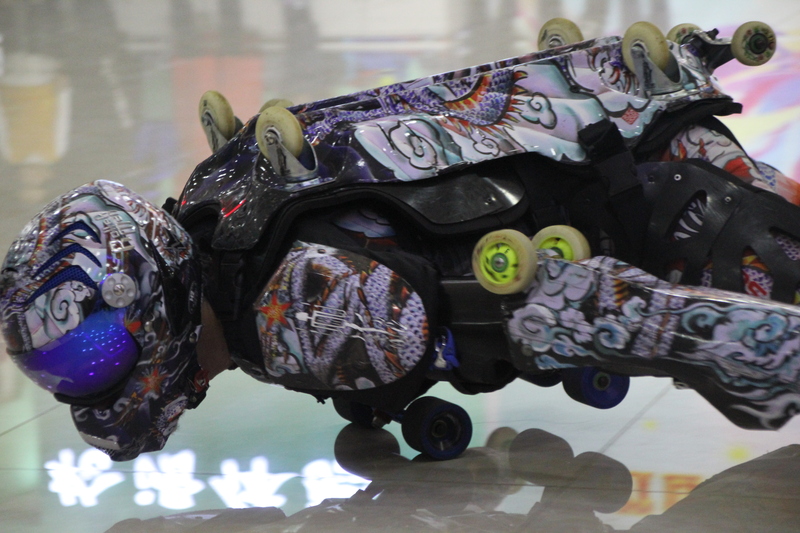 That was 4 BUGGY ROLLIN in Nanjing. 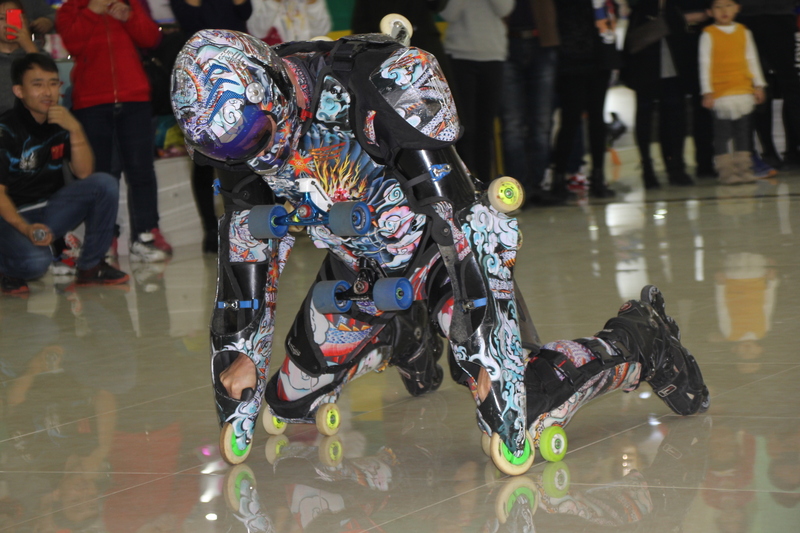 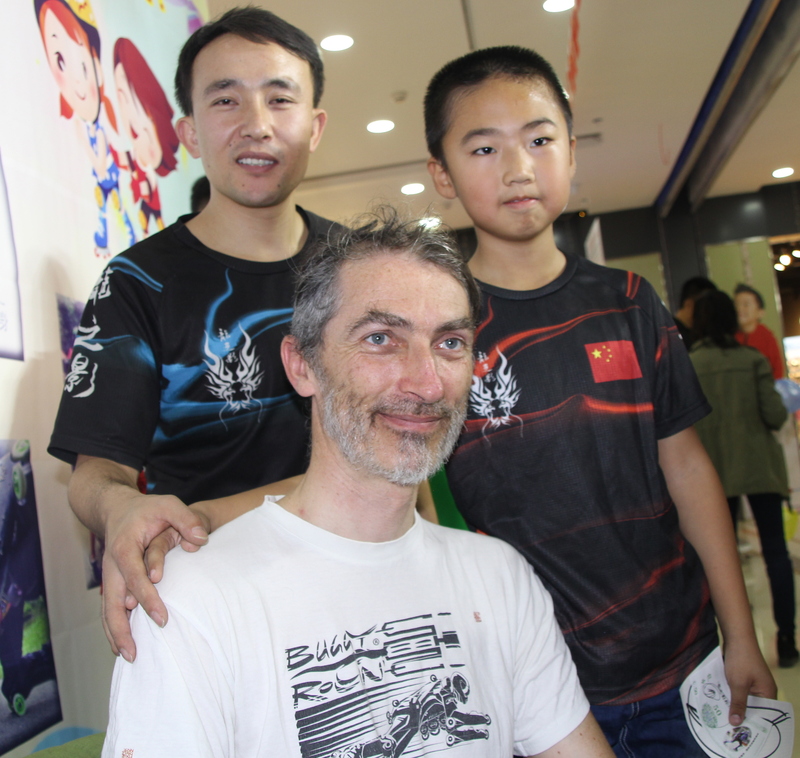 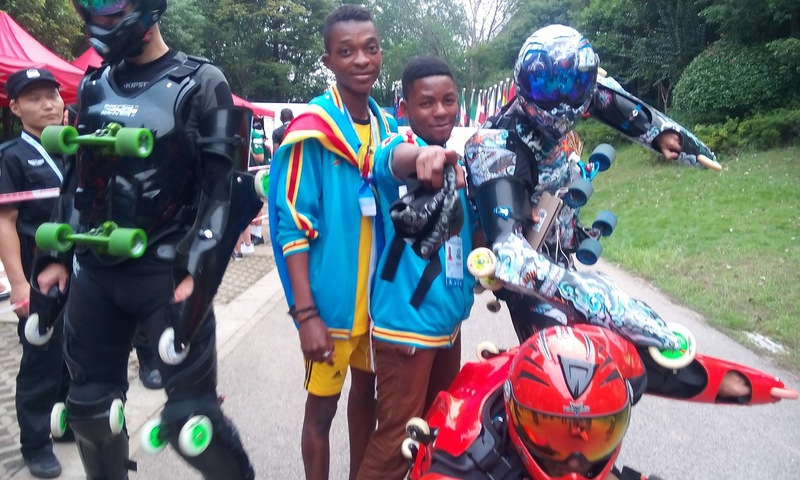 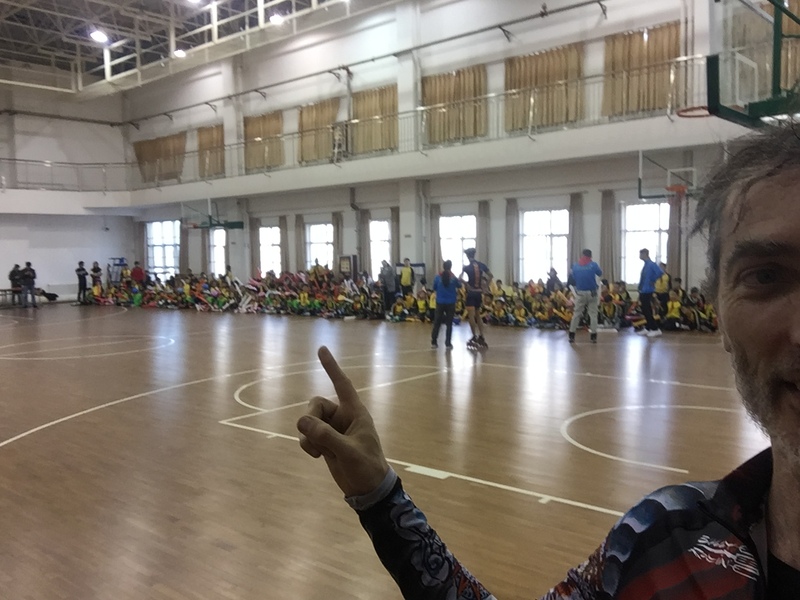 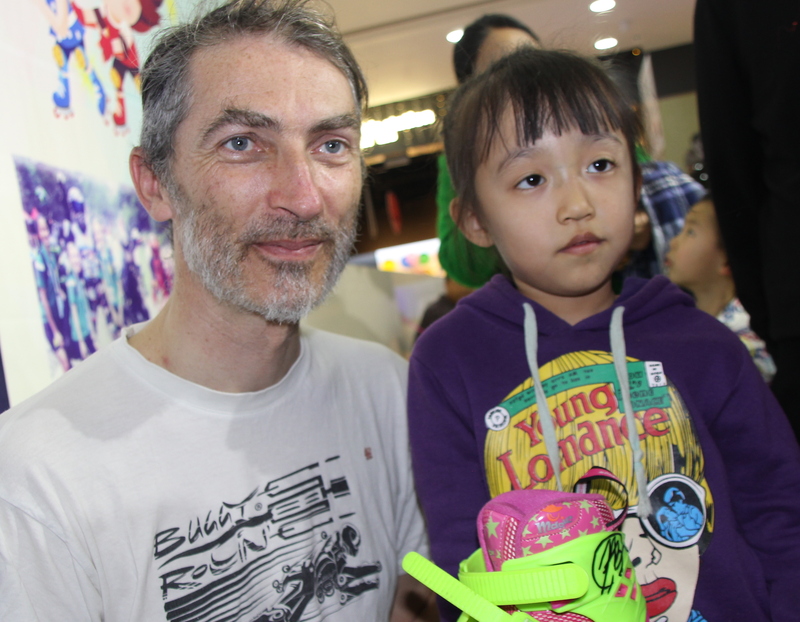 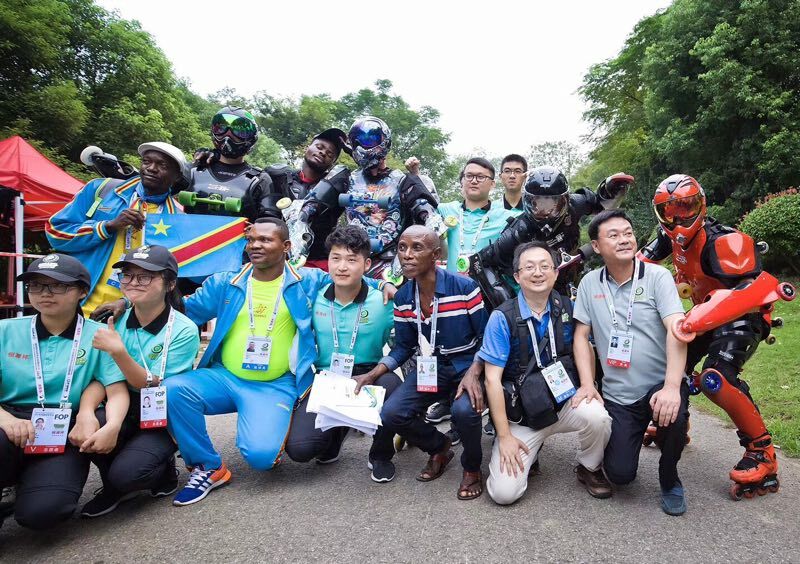 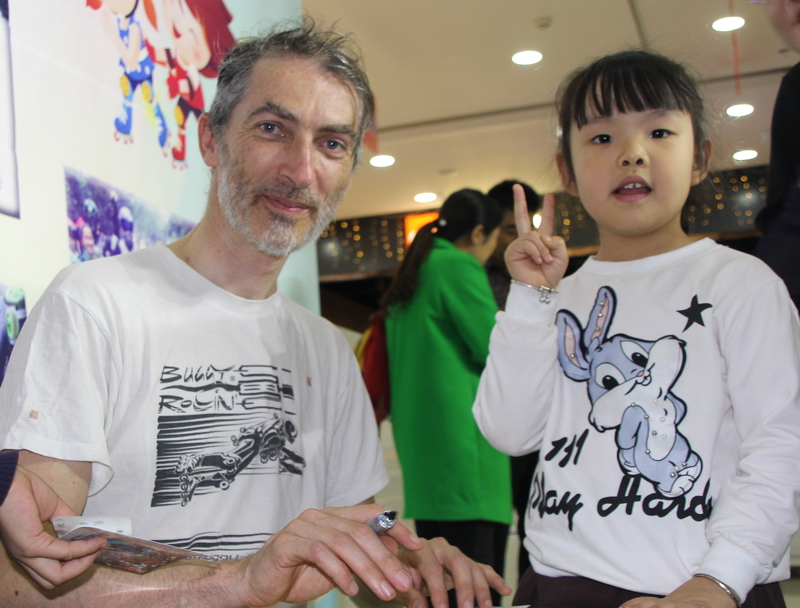 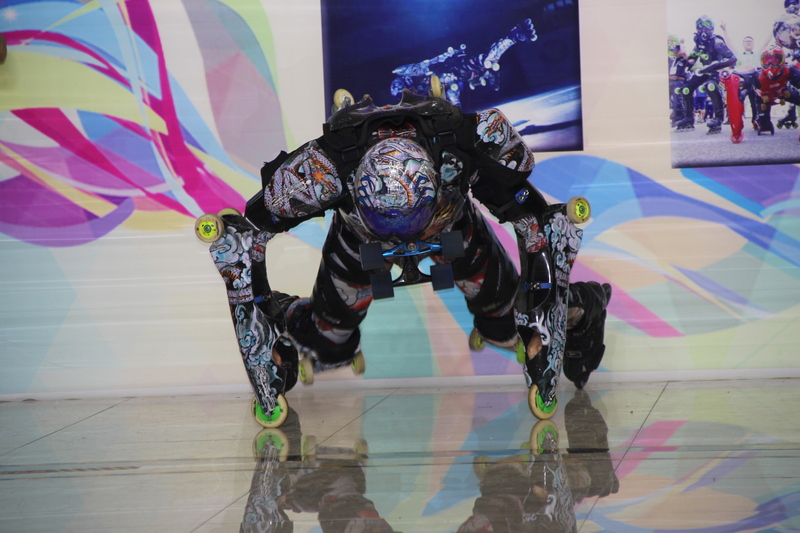 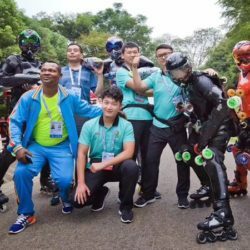 The Nanjing Roller Games were organized like olympic event. 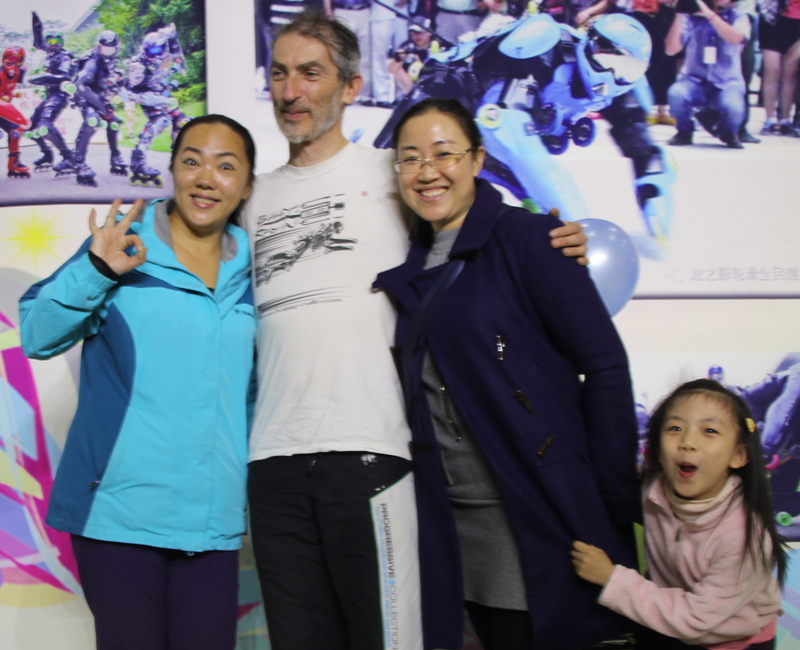 There was a lot of protocol, and much too much police. 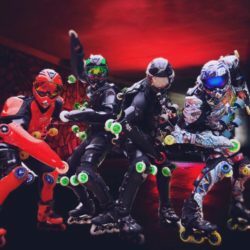 We had police event in night club ! 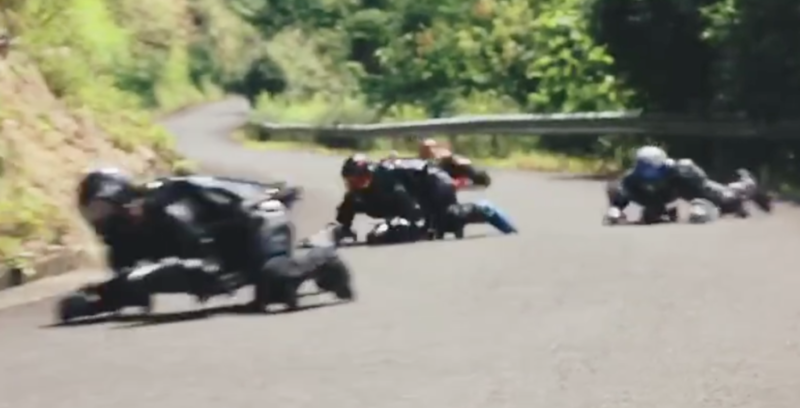 BUGGY ROLLIN were not expected and not welcomed by organisator. 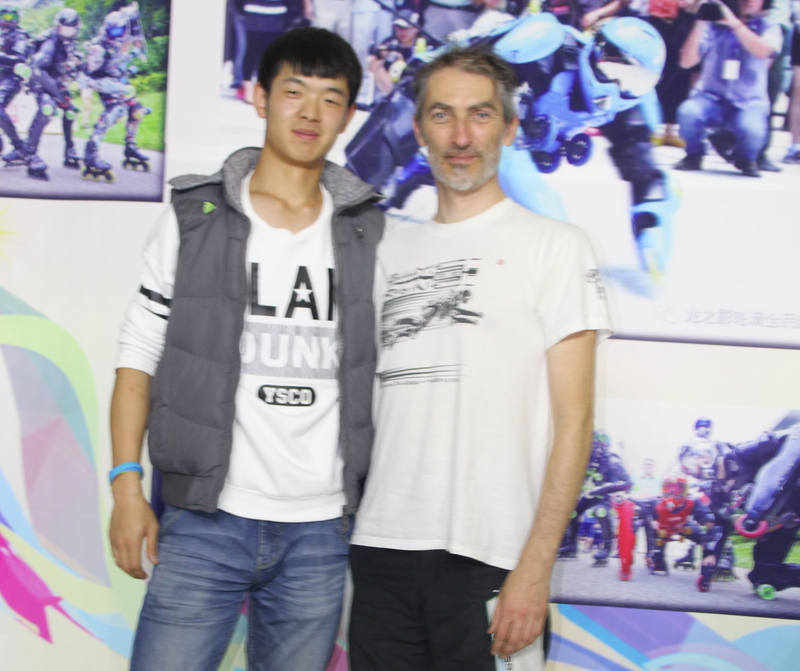 Jean Yves Blondeau with the help of IIDA President Alxandre Lebrun had to fight a lot to get athletes pass. 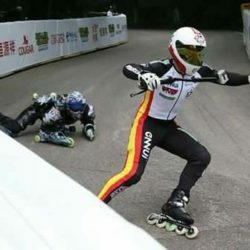 Freezy had to struggle quite a lot to be able to come on the race too. 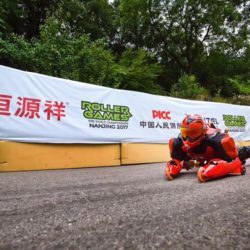 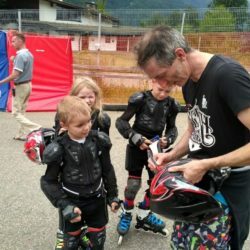 DOWNHILL IS THE WORLD OF BUGGY ROLLIN, SO WE MUST BE THERE at the Roller Games. 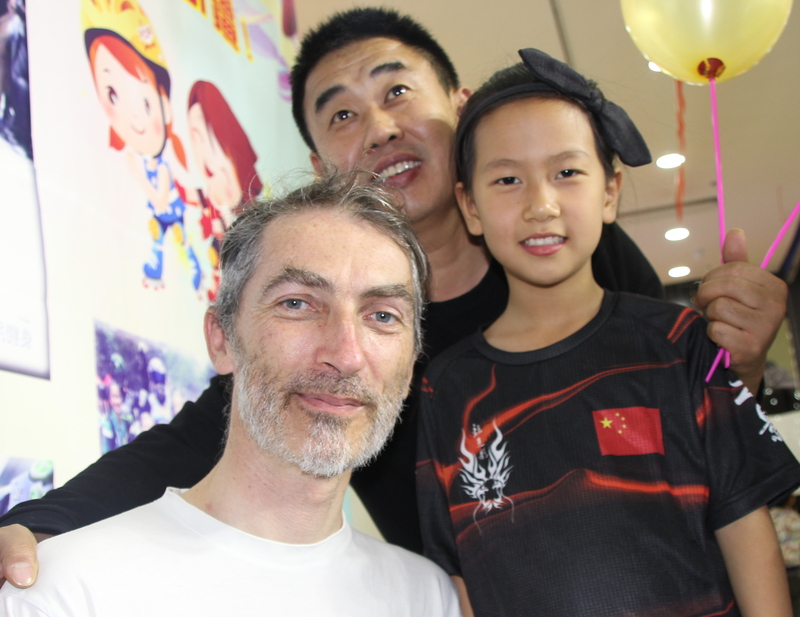 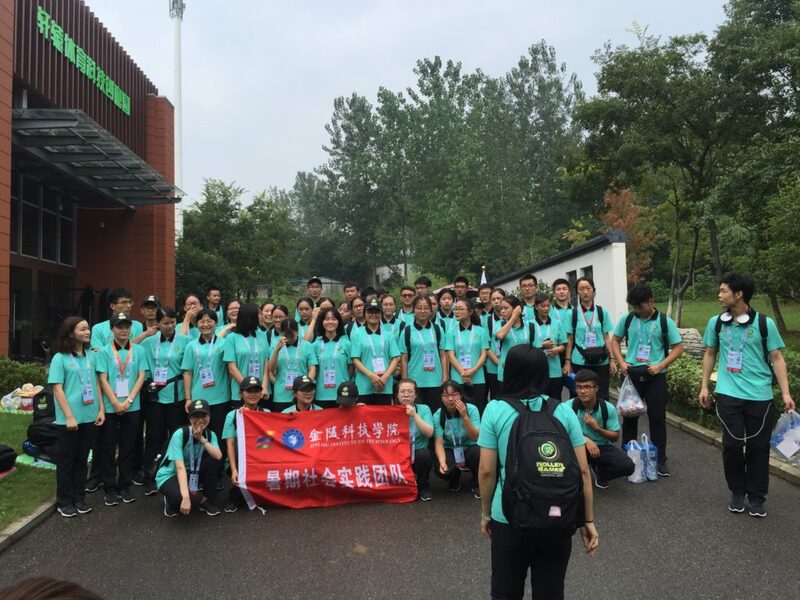 It was a success and happiness to have all Chinese athletes coming to take part to competition. 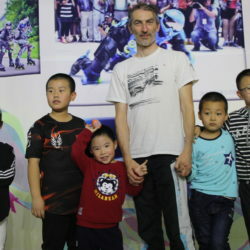 They also had to fight quite a lot to be able to be there. 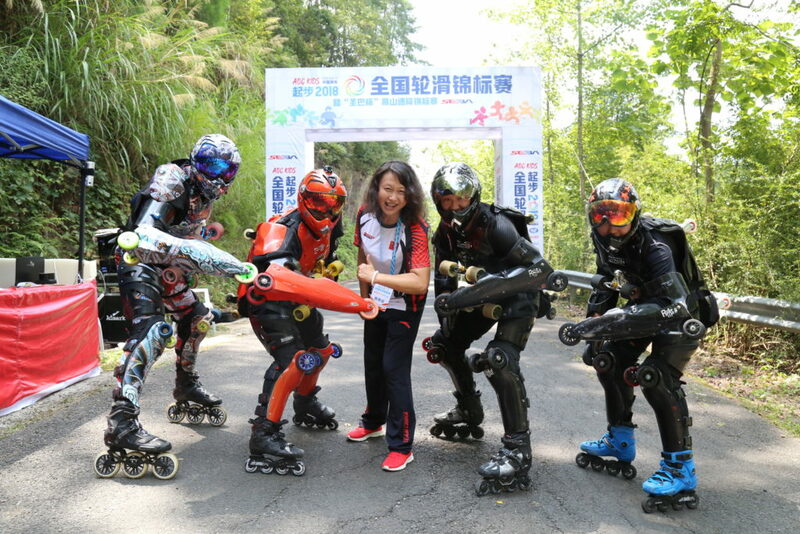 Even if each BUGGY ROLLIN athlete had a federal skater license we had to struggle to be a part of the event. 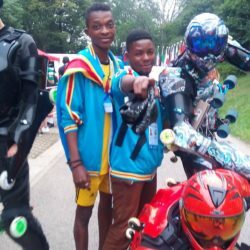 We may be not a lot, but we are representing of the future, we are powerful image. 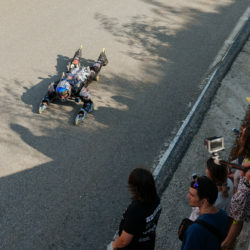 The configuration of the road was very technical. 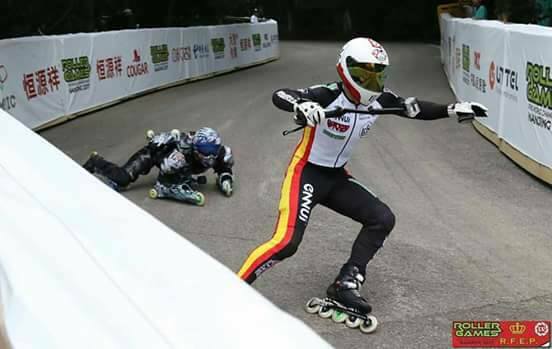 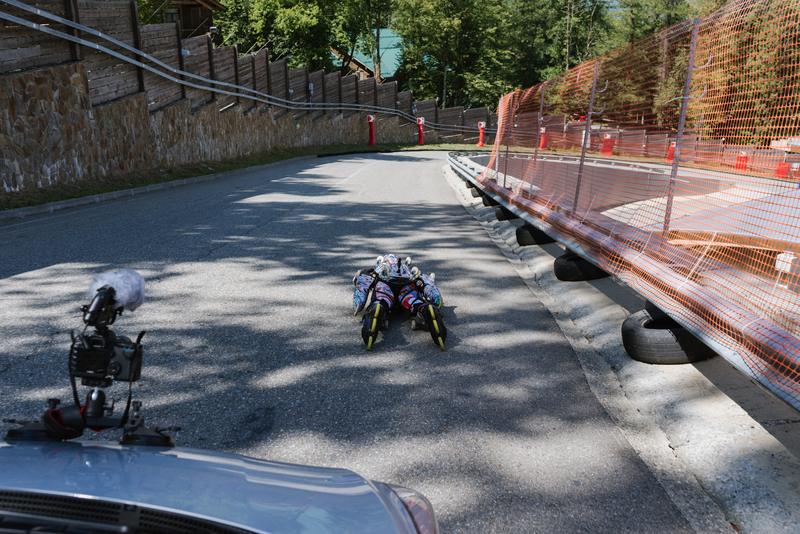 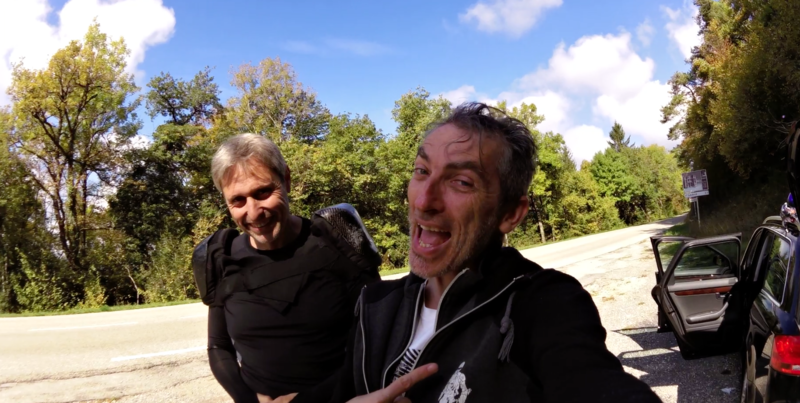 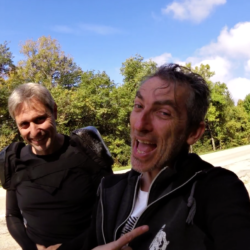 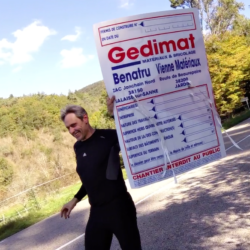 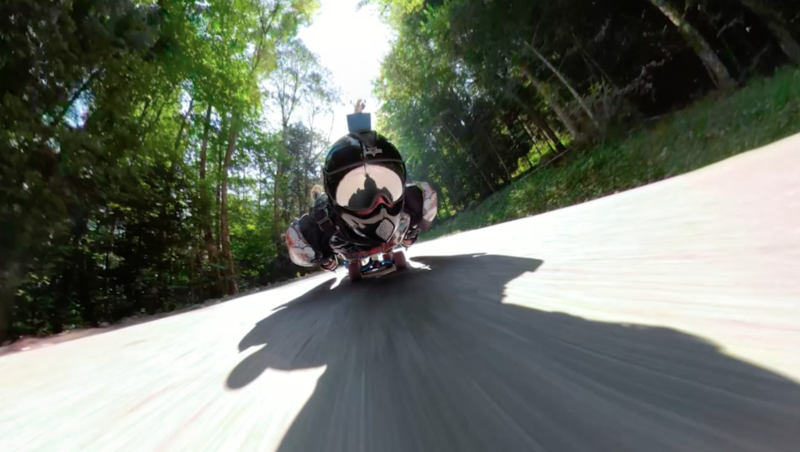 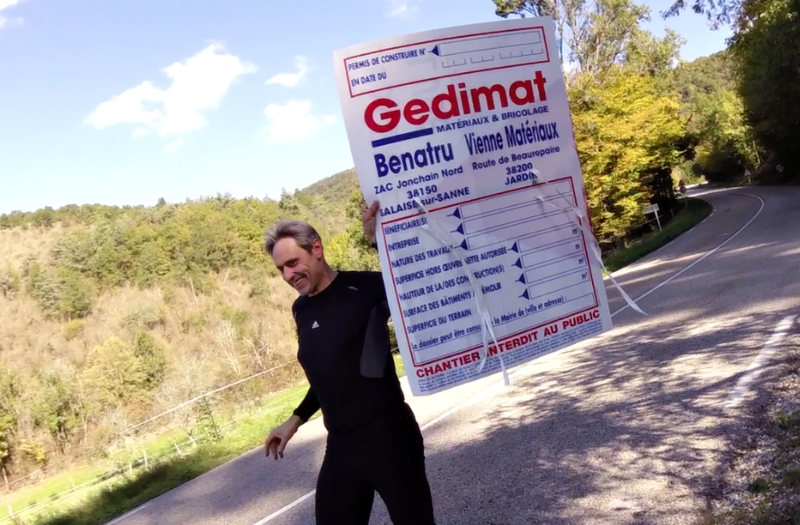 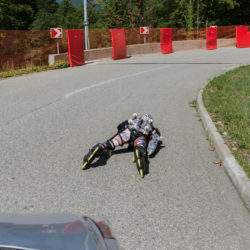 Usually Jean Yves Blondeau never crash on downhill. 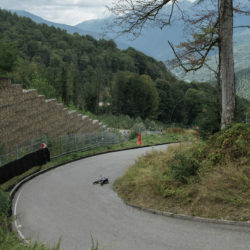 But this track was designed to minimize high speed crash. 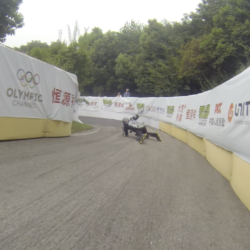 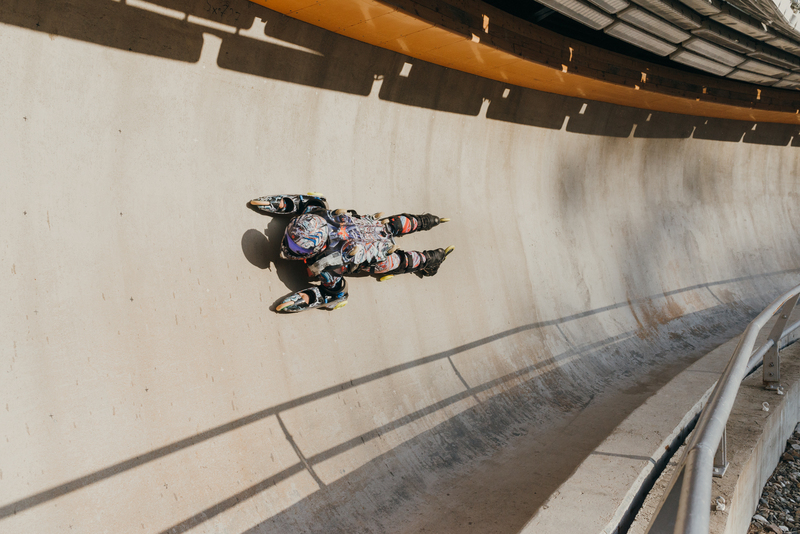 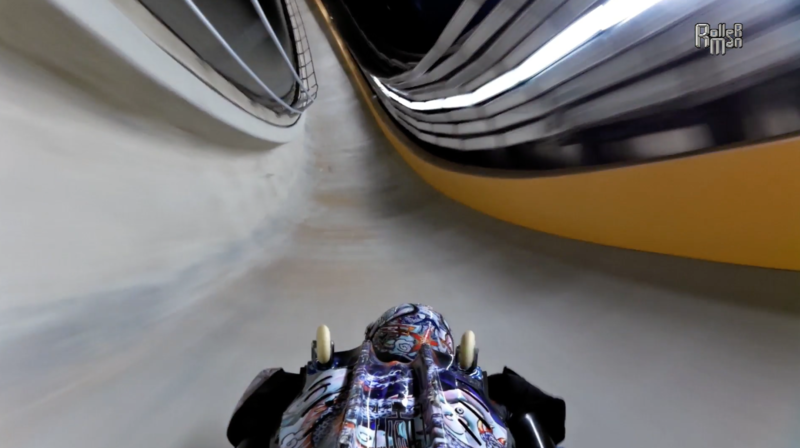 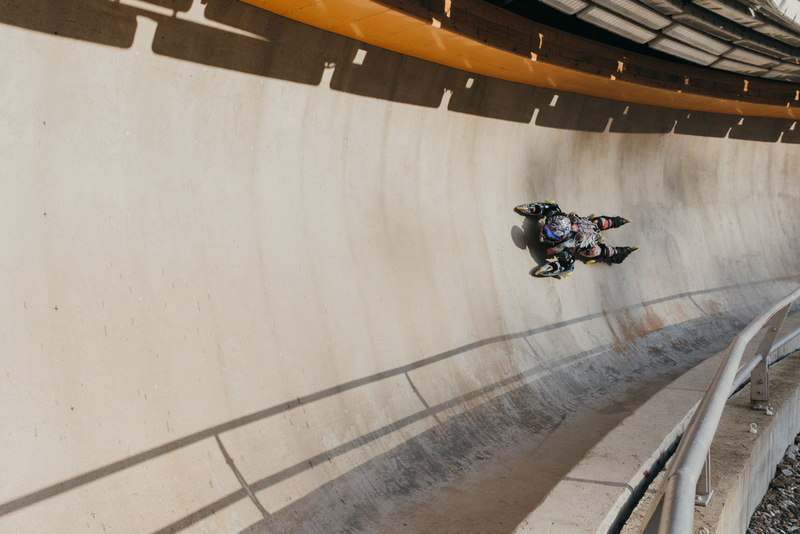 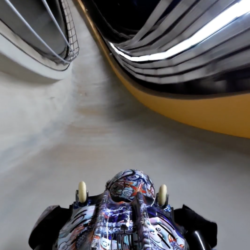 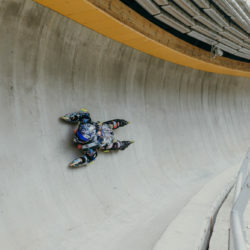 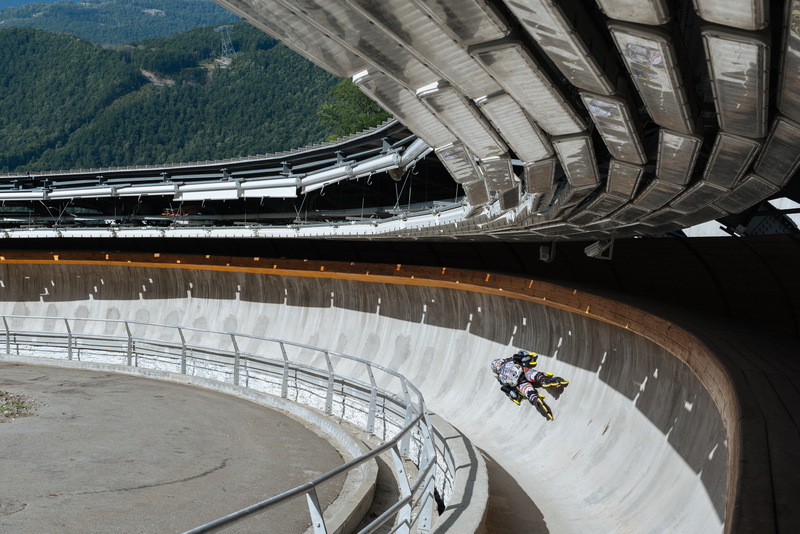 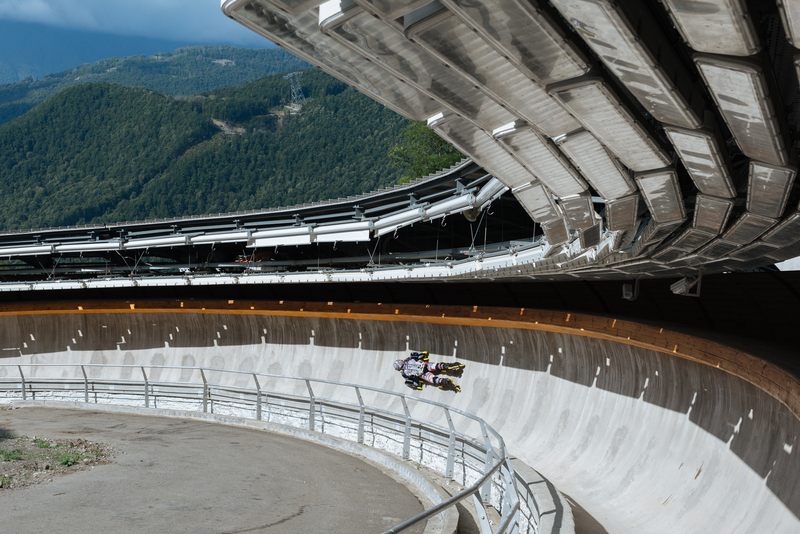 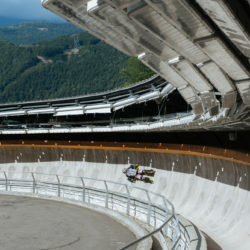 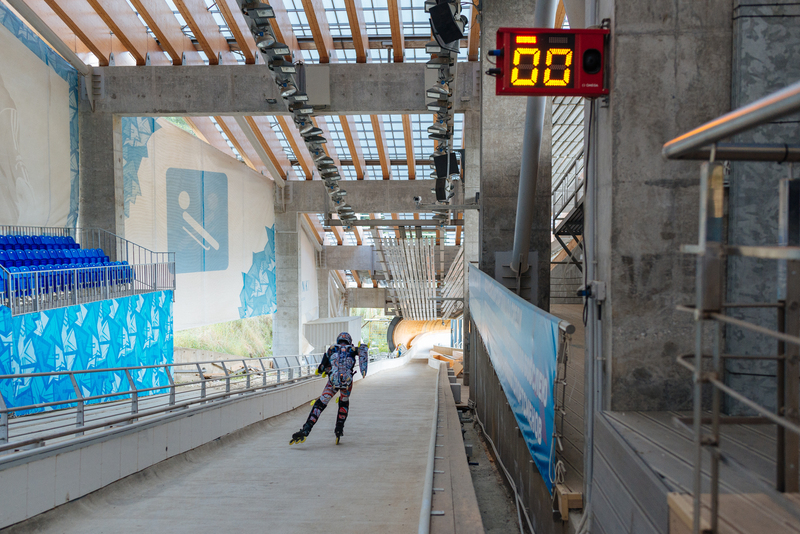 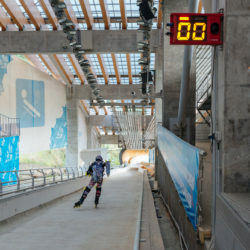 Mattress walls were restricting some key curves that forced the athletes to brake enough to pass without touching the walls. 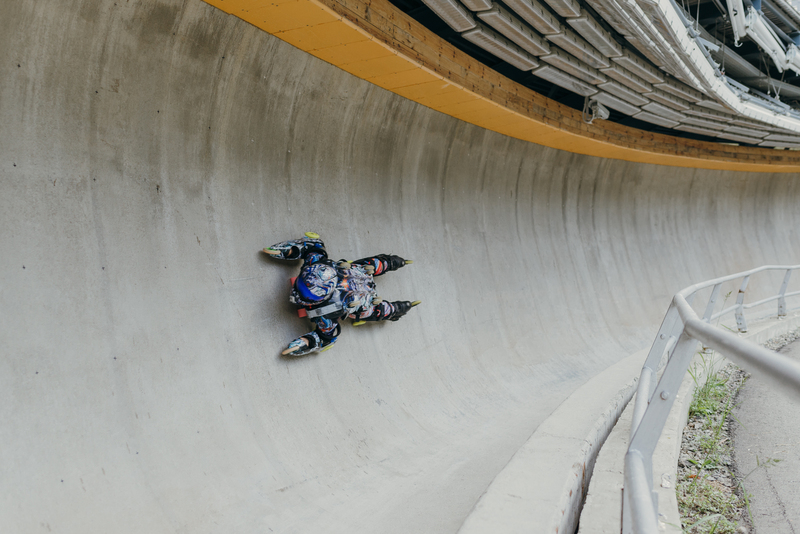 So we had to adjust the speed enough to be able to not crash. 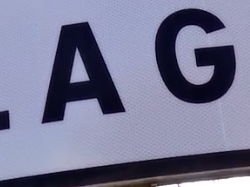 Finally we could all succeed it. 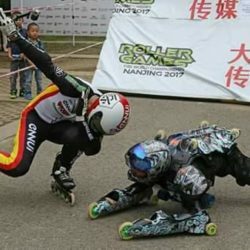 And the runs altogether were just spectacular. 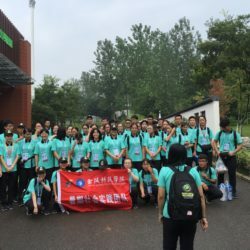 As for a major event, the organization asked for a lot of volunteers to help. 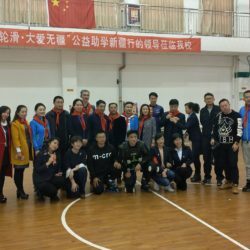 Every national team of every sport category had dedicated volunteers. 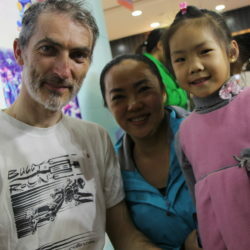 They were nice, gentle and helpful. 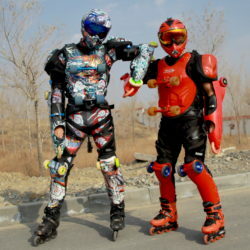 Thank them. 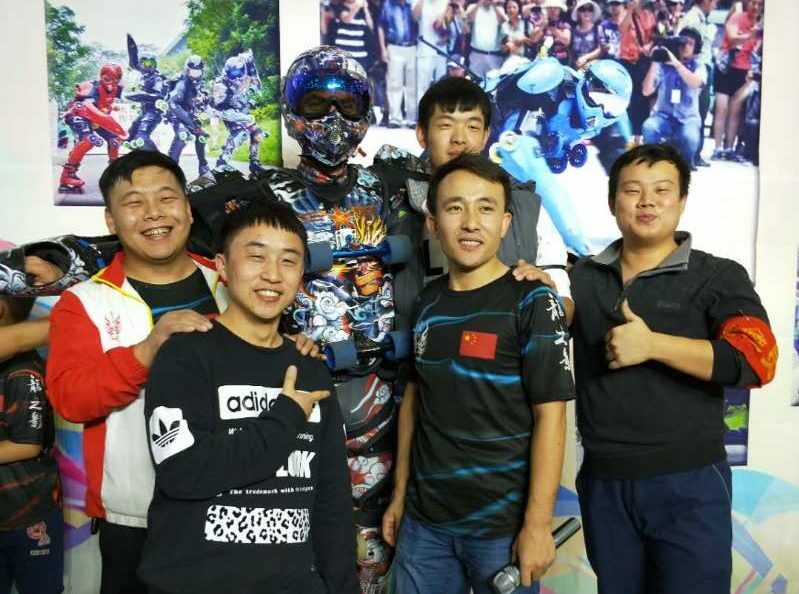 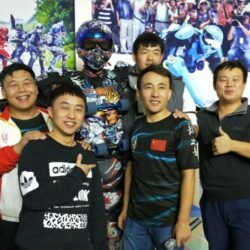 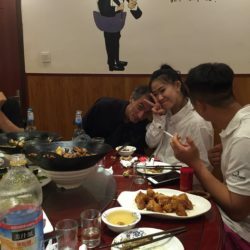 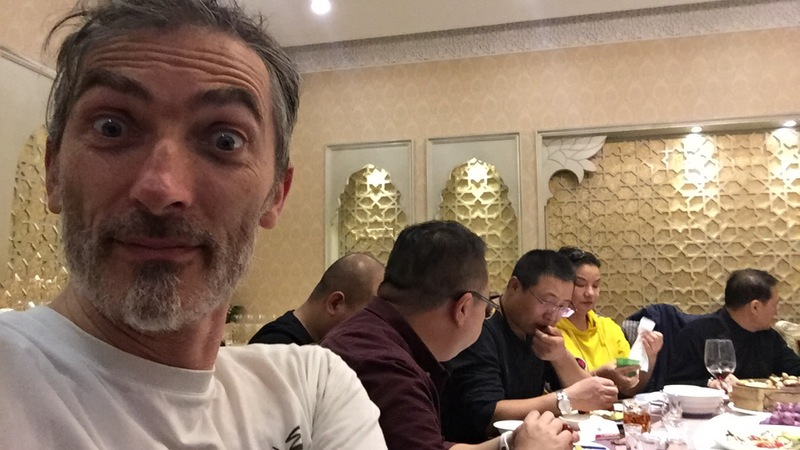 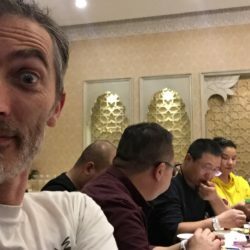 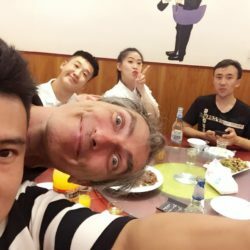 On the side of the event, we created the opportunity to make Chinese pilot meeting and talk about future development of BUGGY ROLLIN in China. 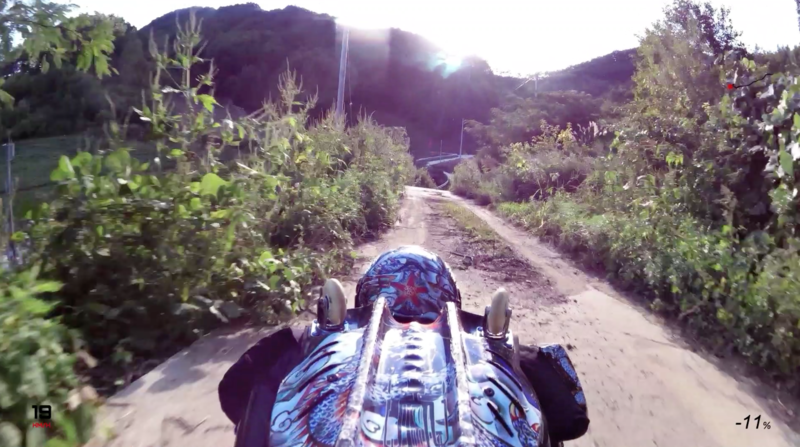 BUGGY ROLLIN downhill sport is something good to be shared with friend. 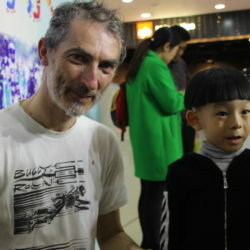 That the reason why Jean Yves Blondeau Rollerman met Christphe Andreatta Riderman on the roads. 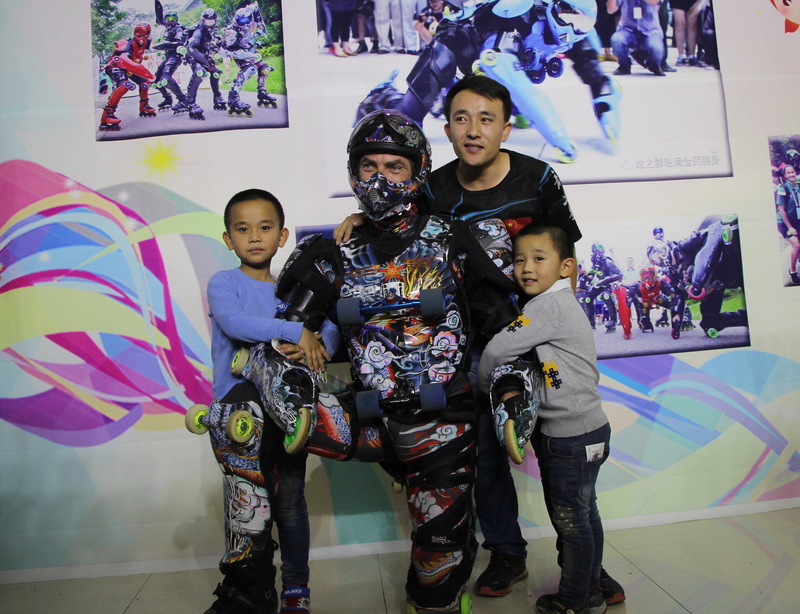 Meet Riderman and Rollerman at Charix. 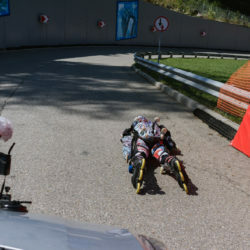 Charix was the opportunity to go over 100km/h. 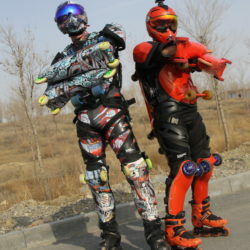 Infact Riderman and Rollerman at Charix was on 3 locations. 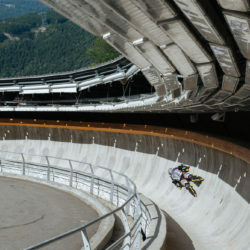 First was berstiaux where riderman achieved 110Kmh. 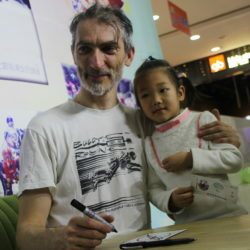 Second was Charix to meet Obelix and Asterix . 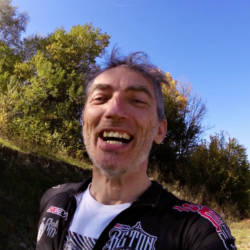 Last was Plagne with wonderfull red automne sun burning light throw golden leaves amazing scenery.